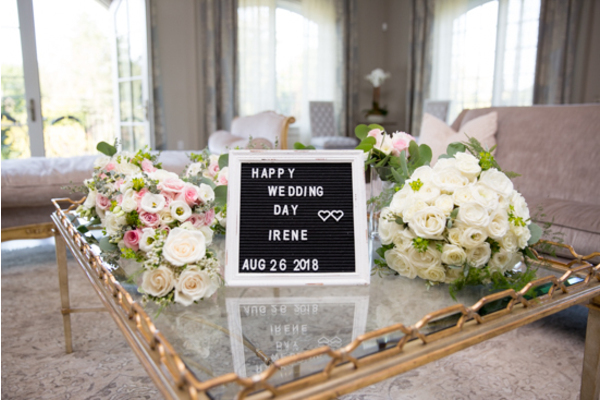 Congratulations to Irene and Neil on their recent marriage! 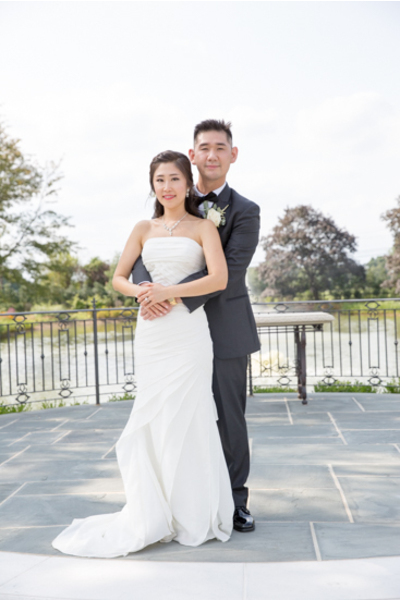 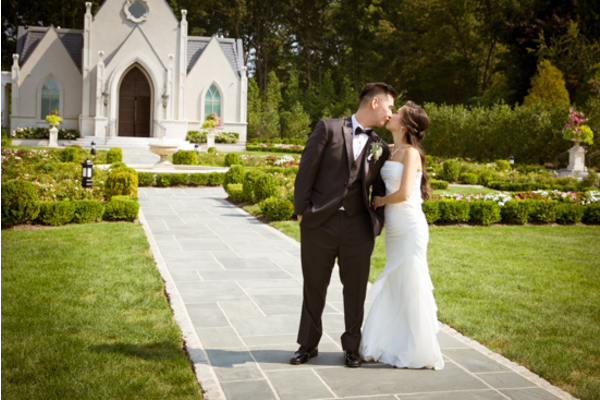 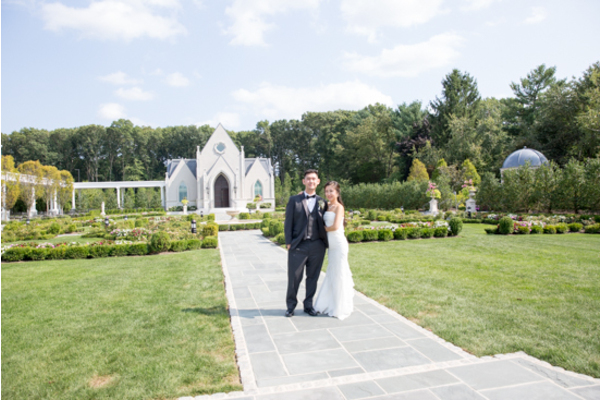 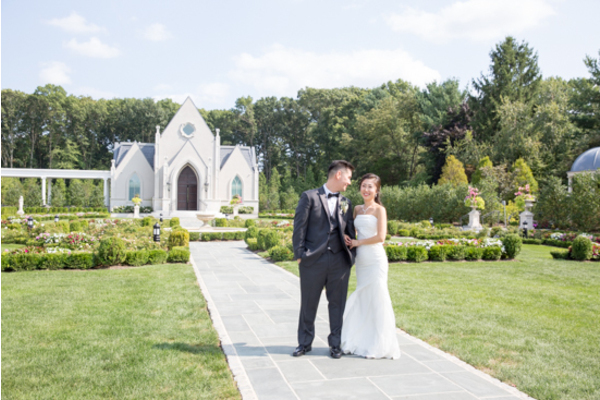 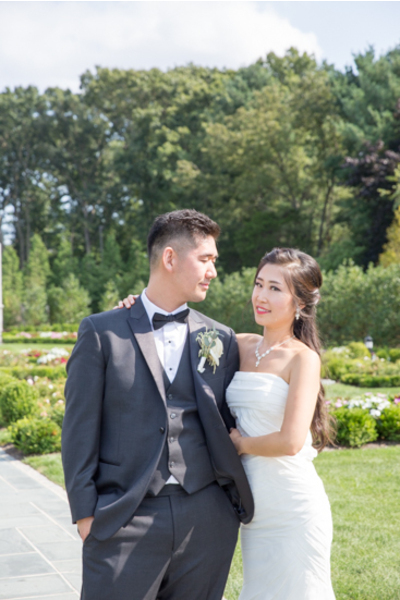 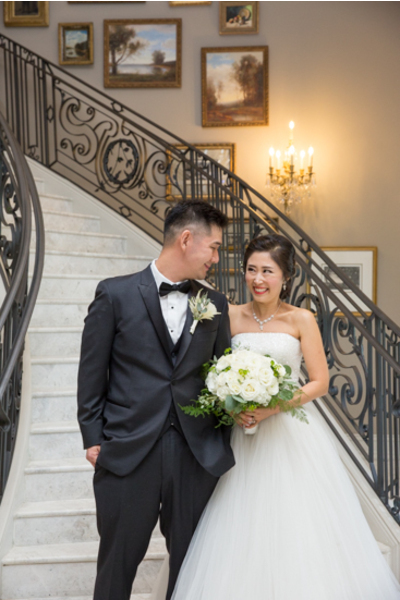 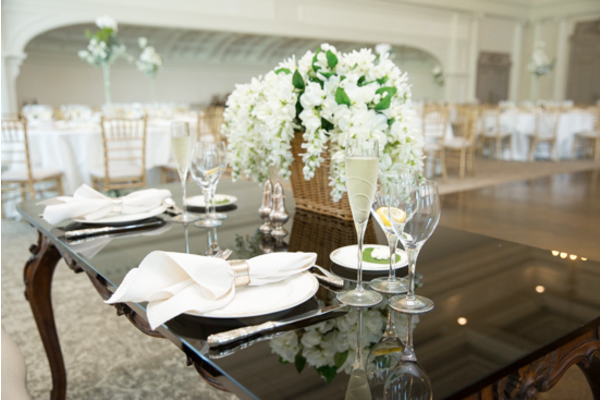 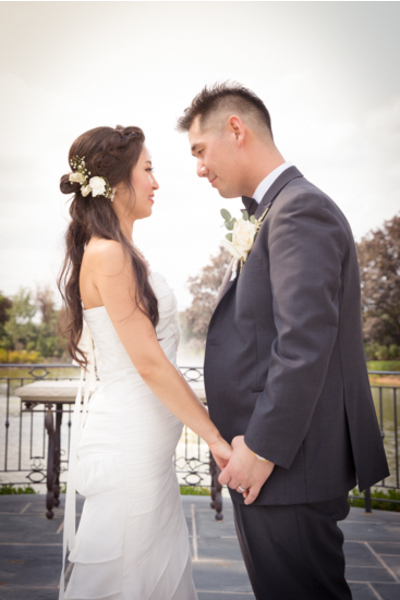 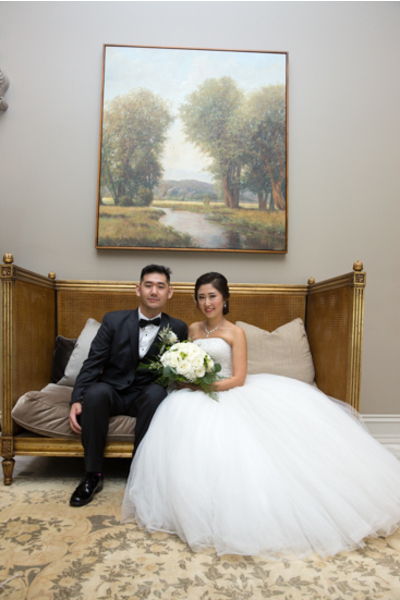 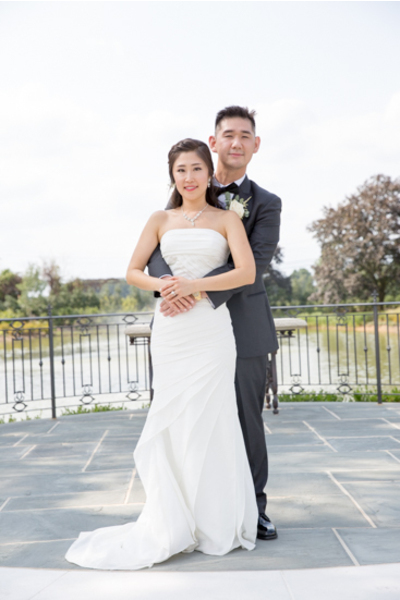 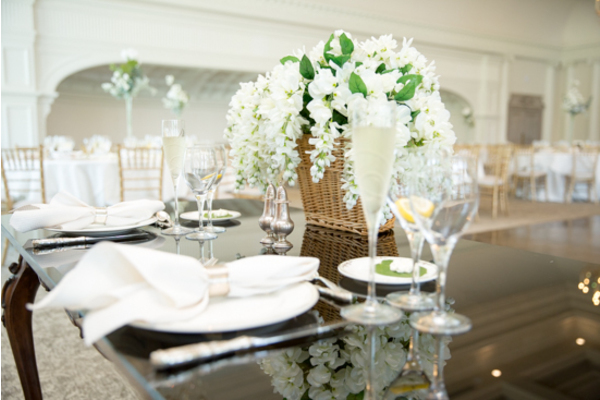 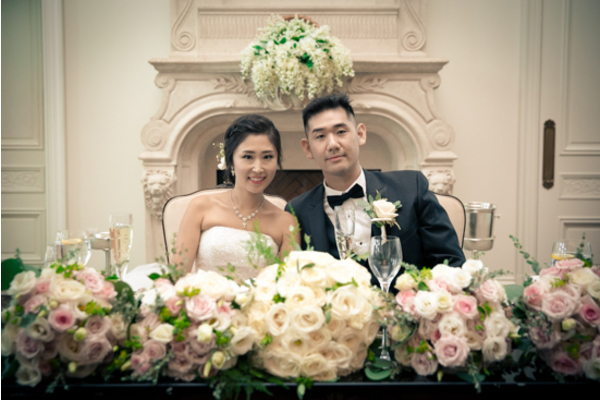 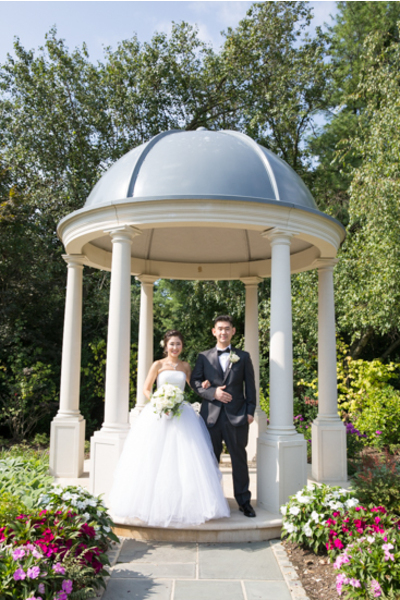 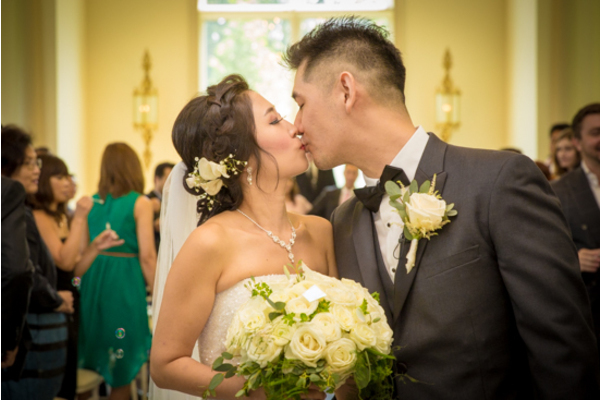 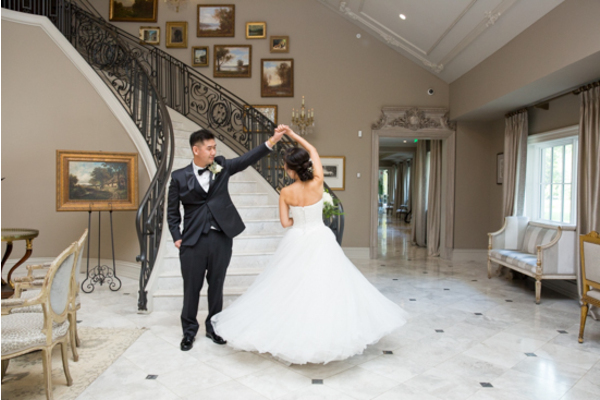 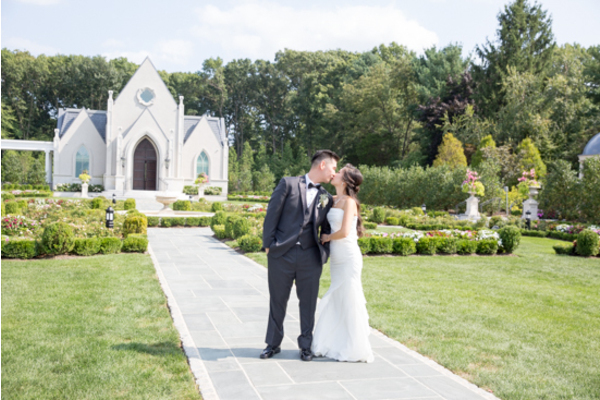 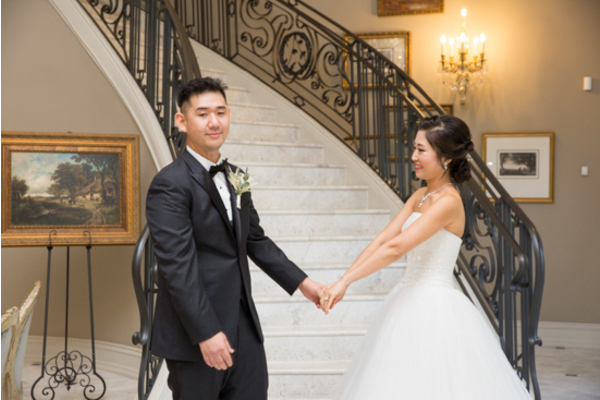 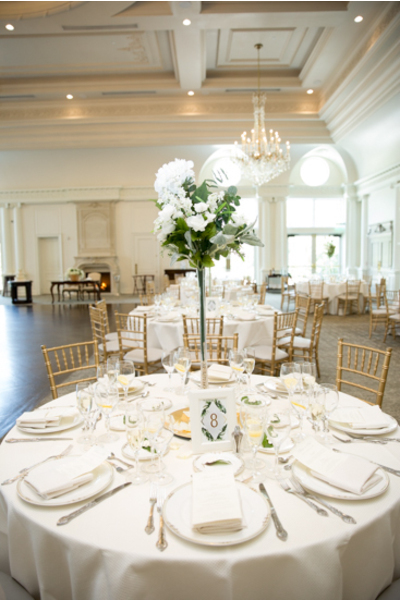 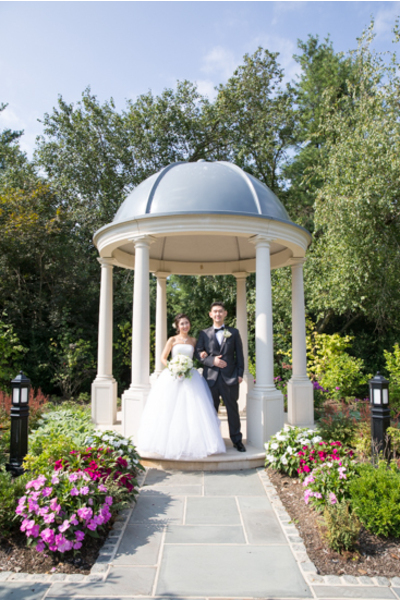 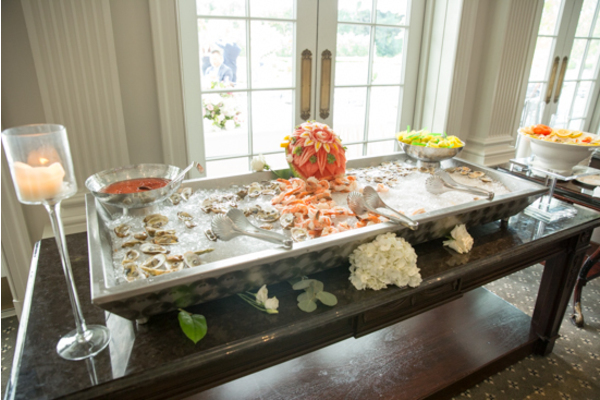 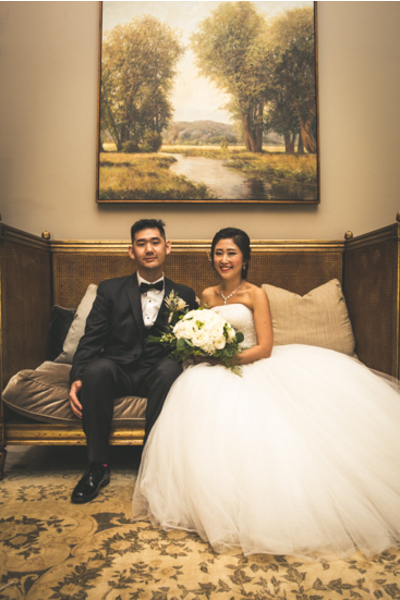 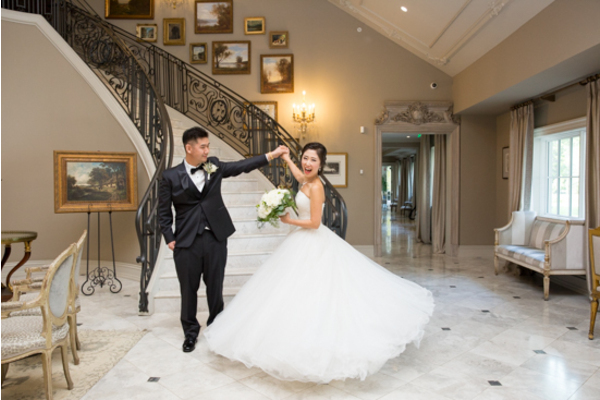 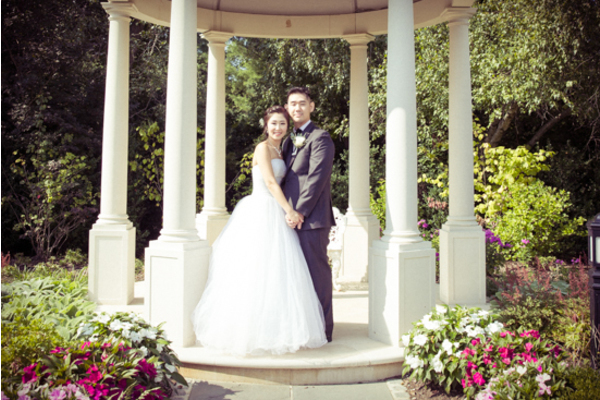 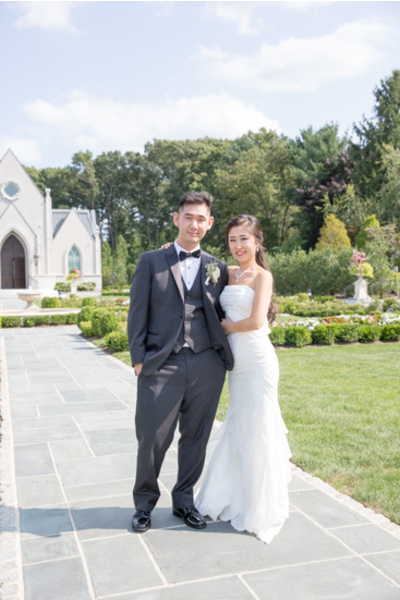 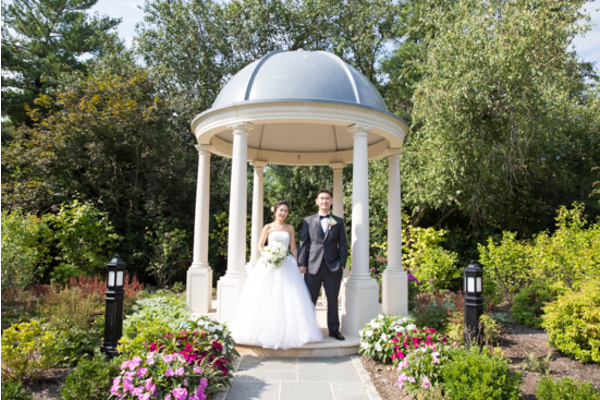 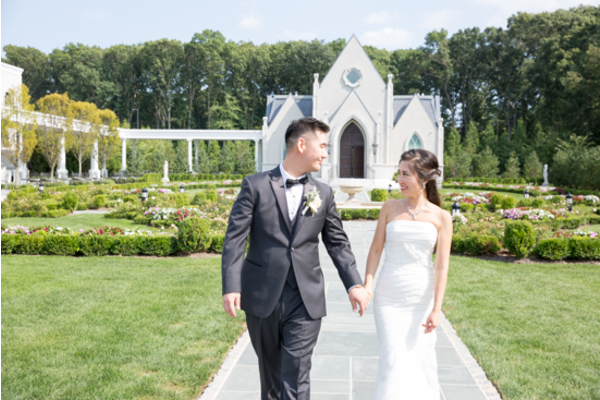 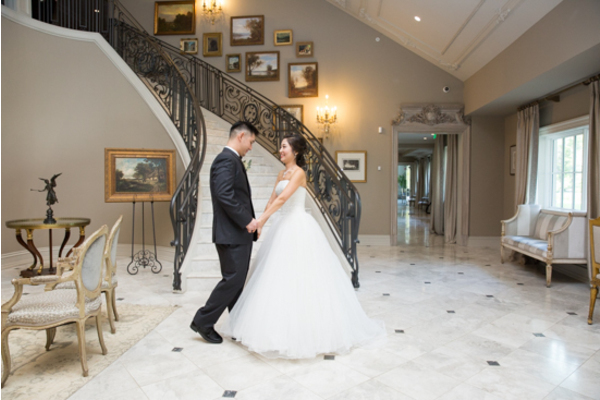 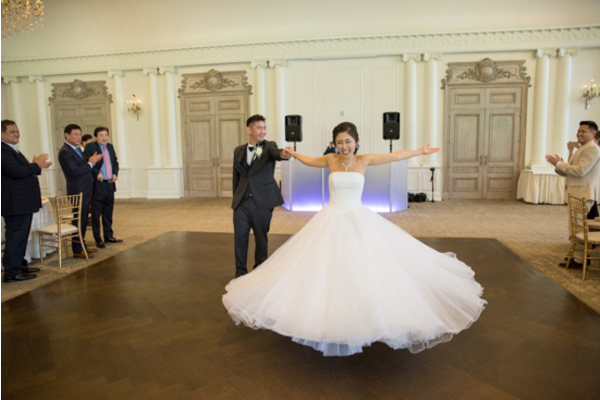 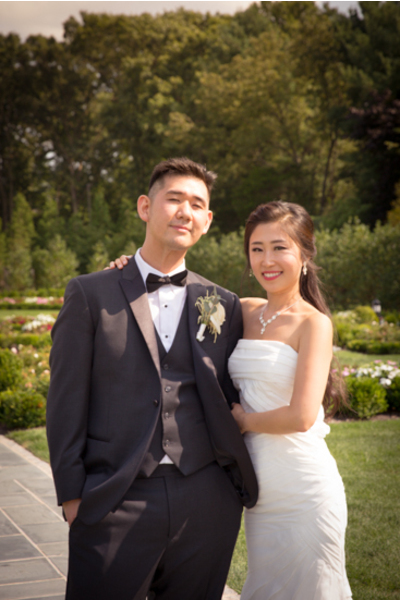 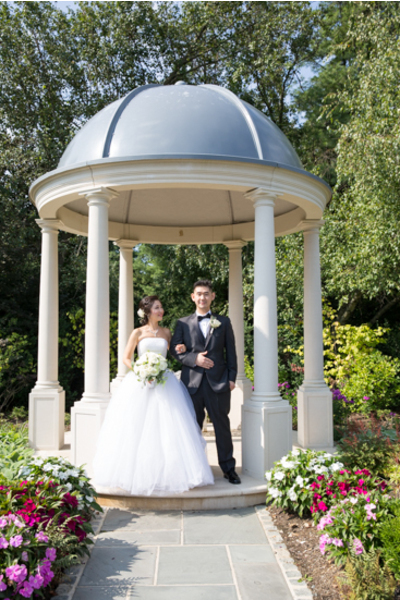 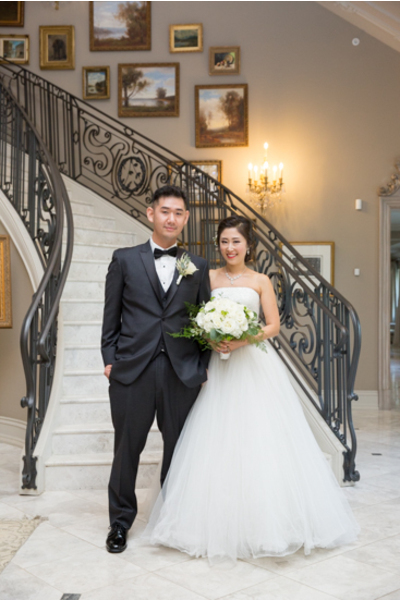 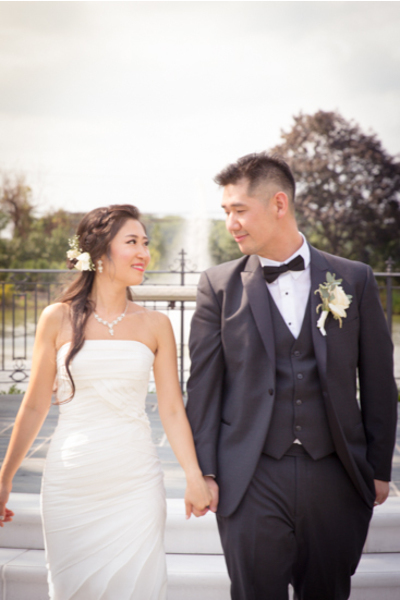 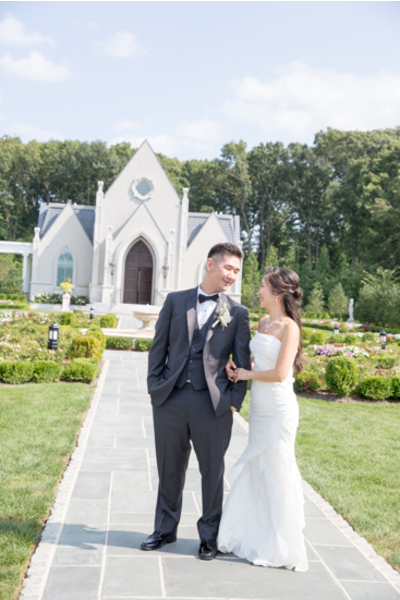 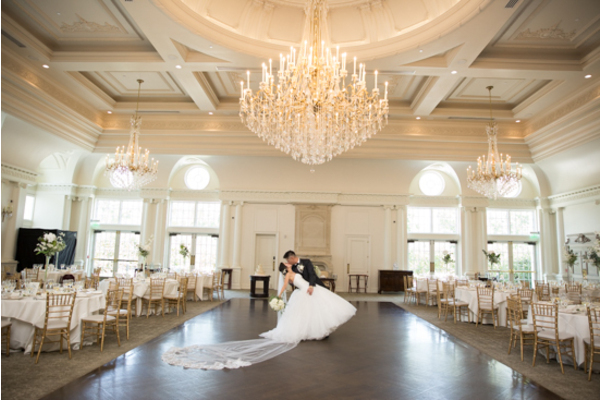 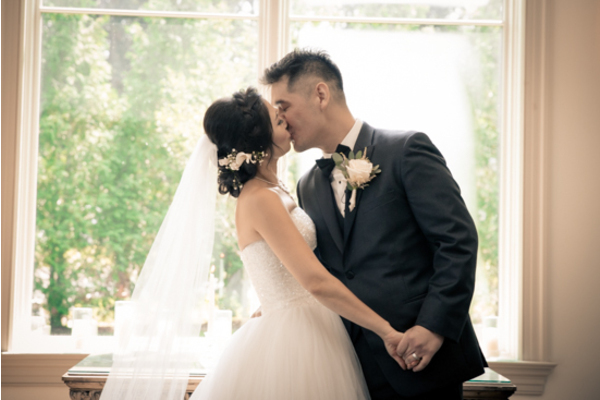 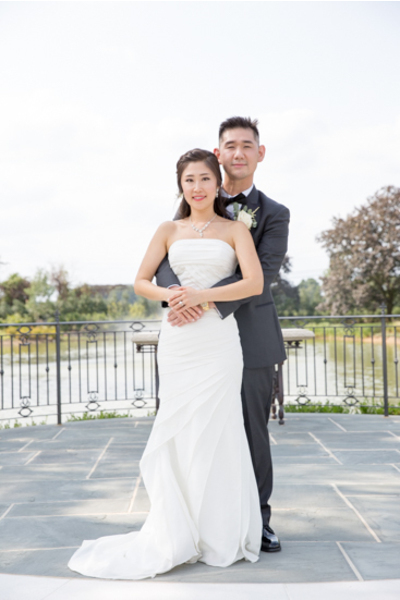 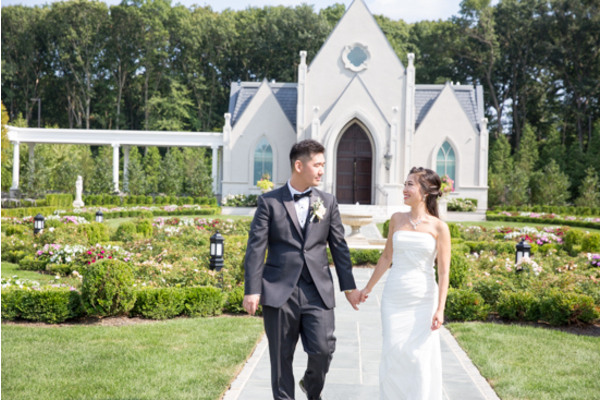 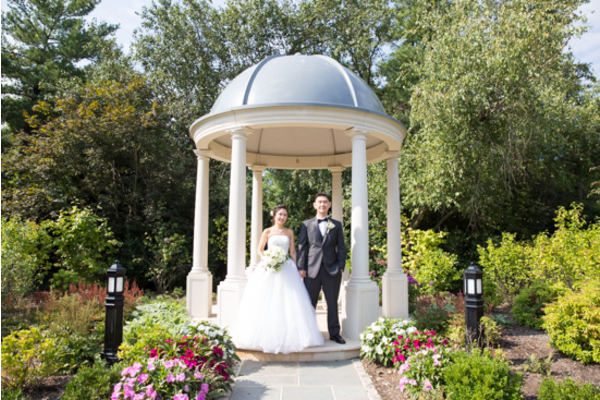 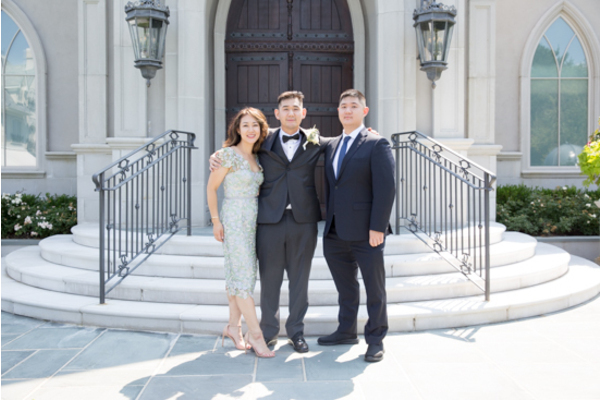 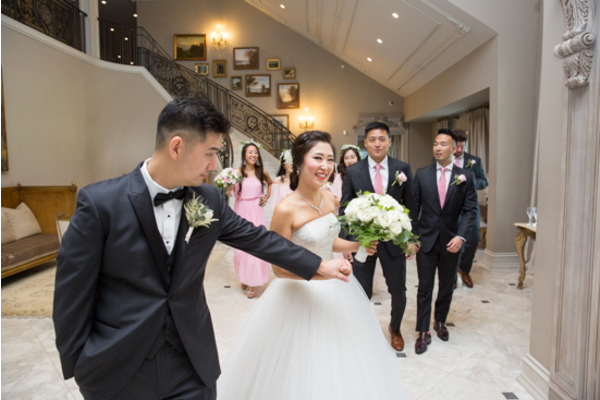 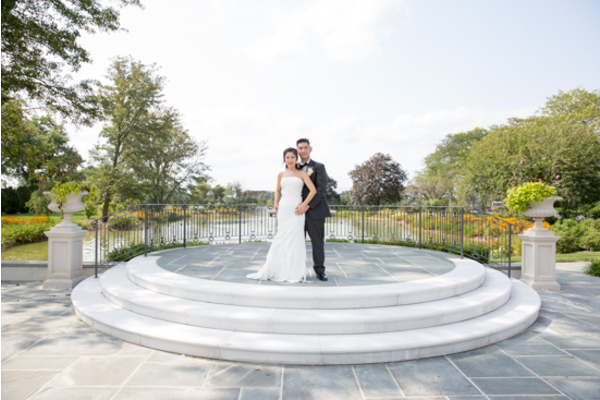 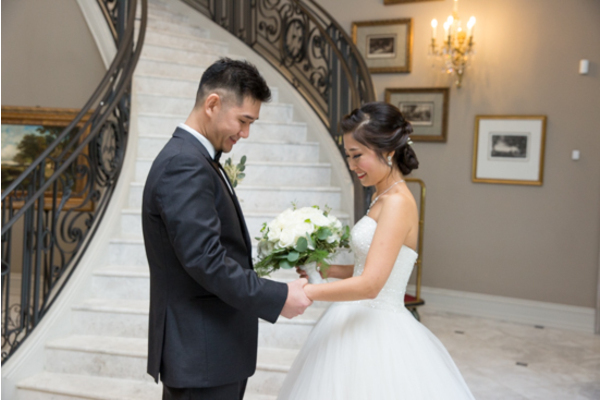 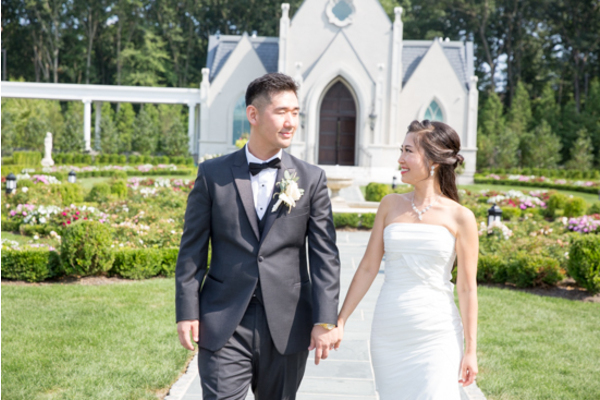 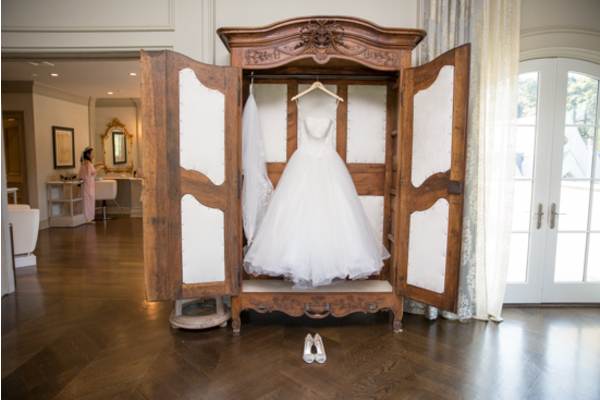 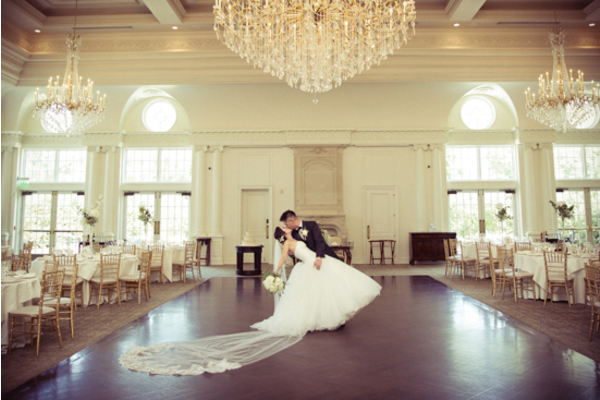 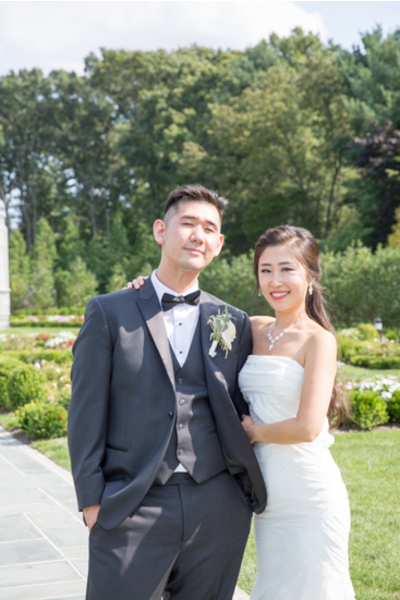 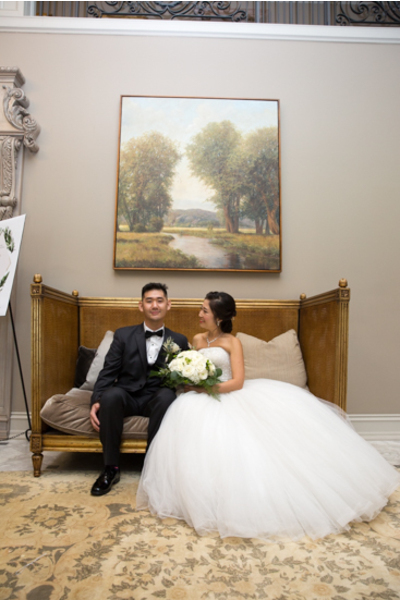 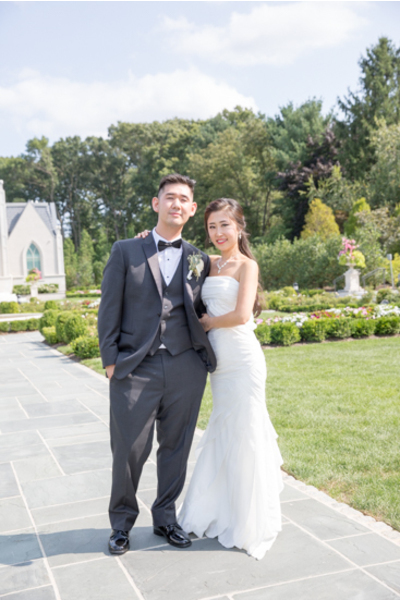 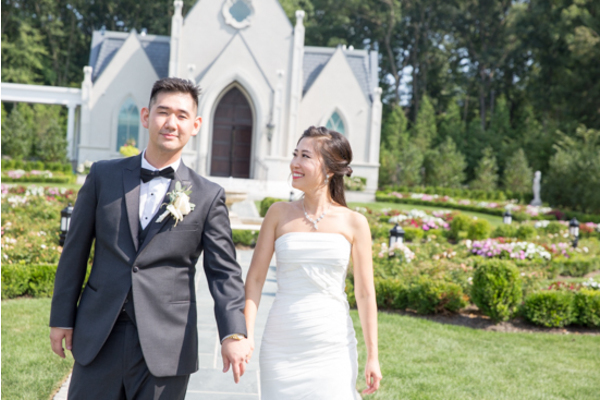 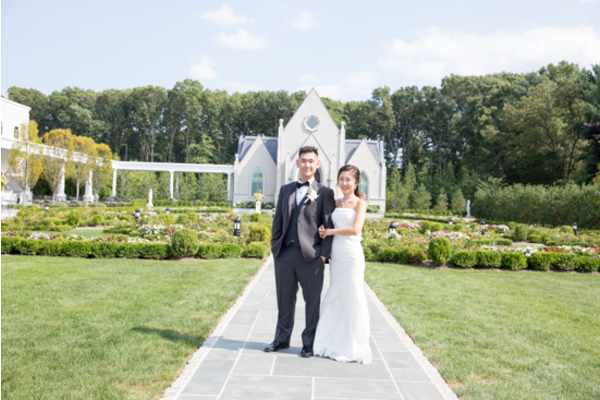 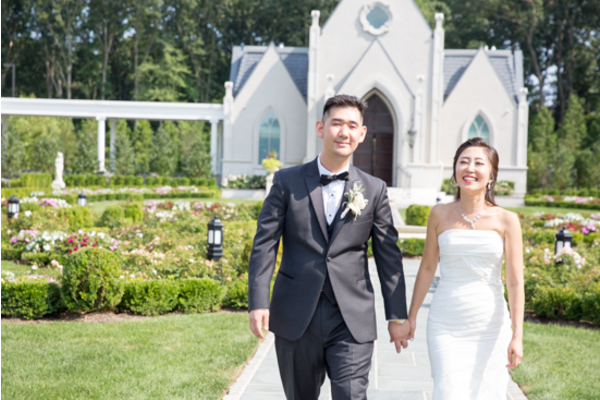 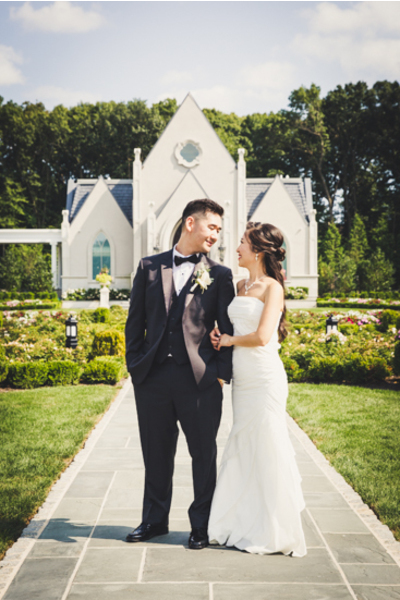 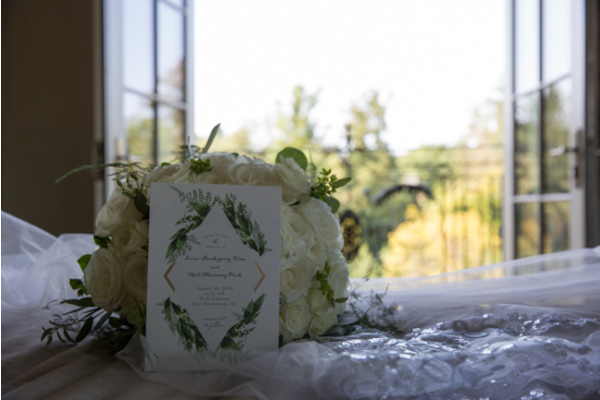 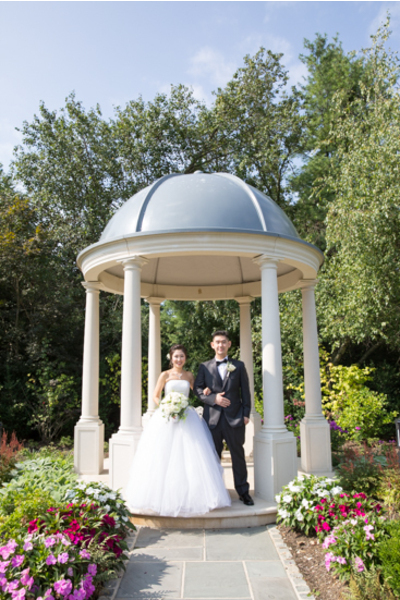 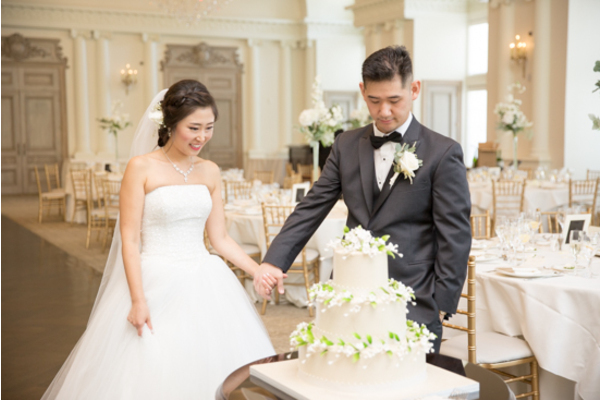 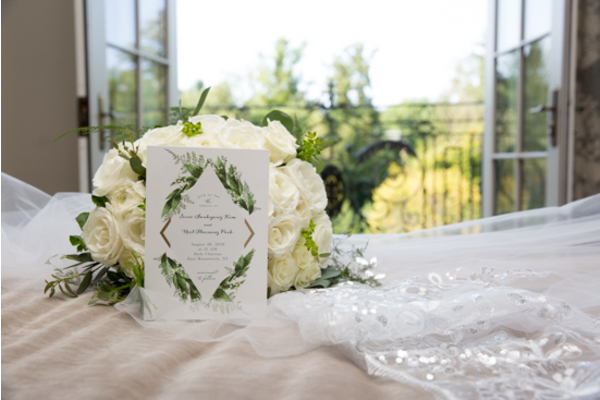 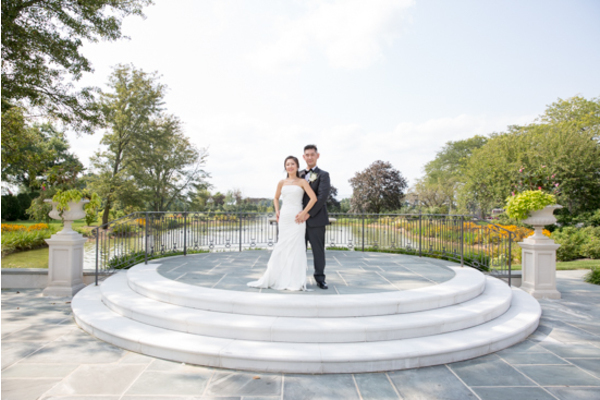 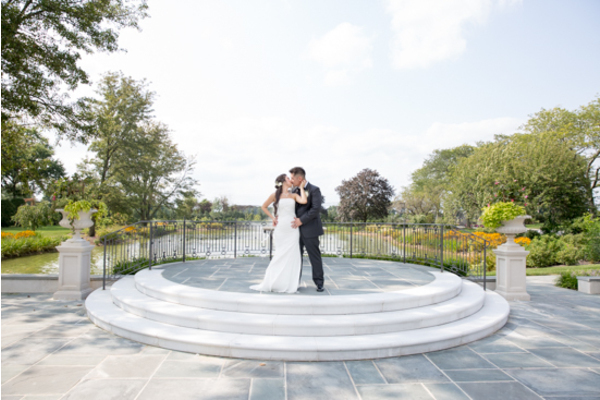 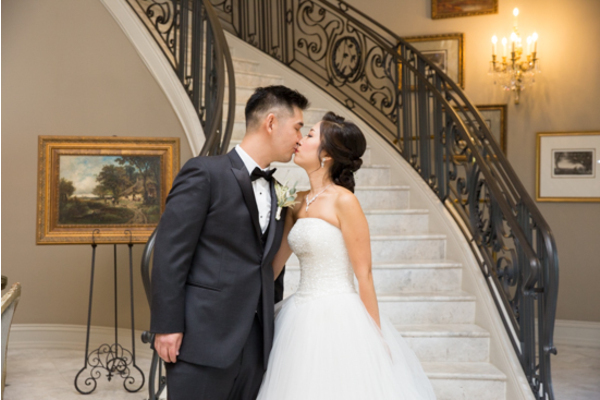 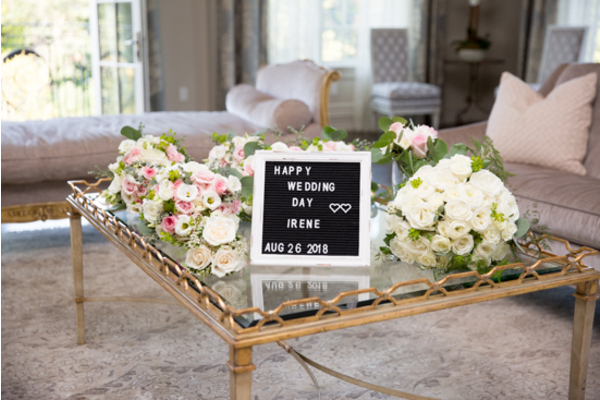 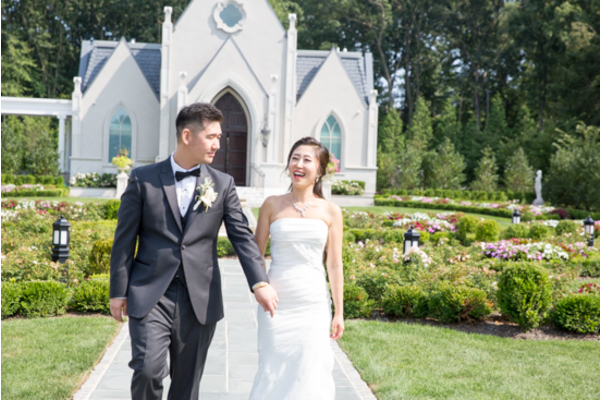 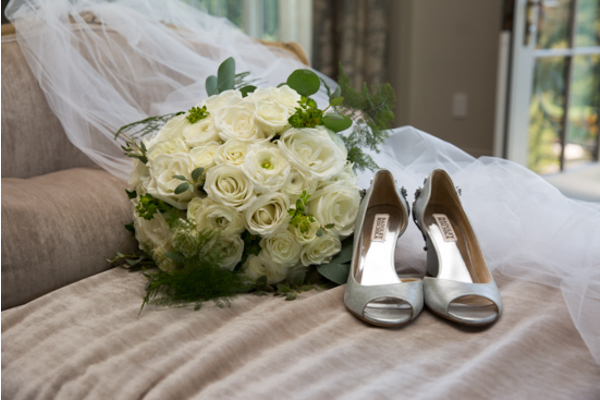 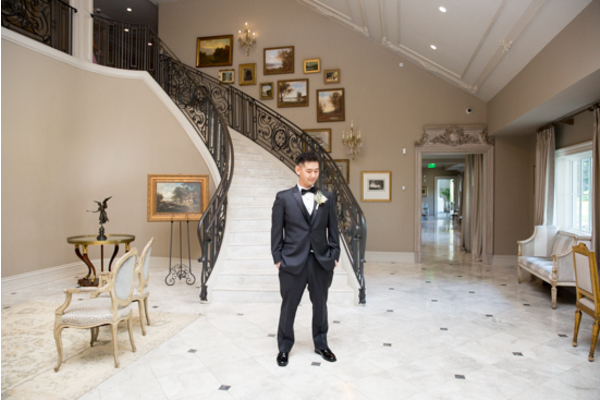 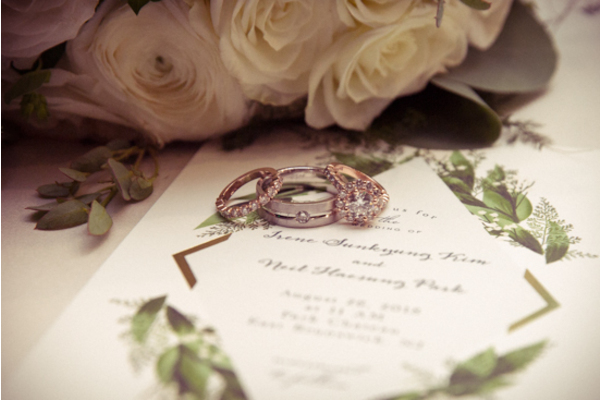 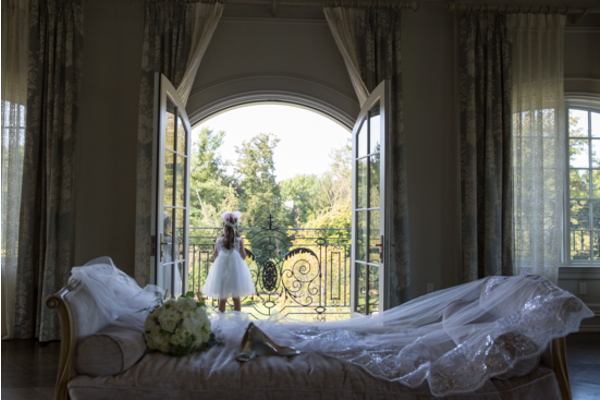 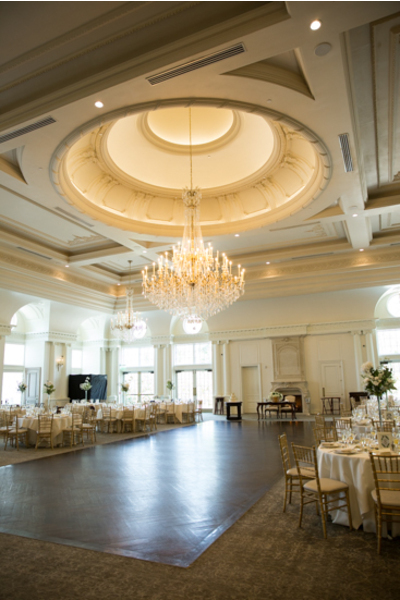 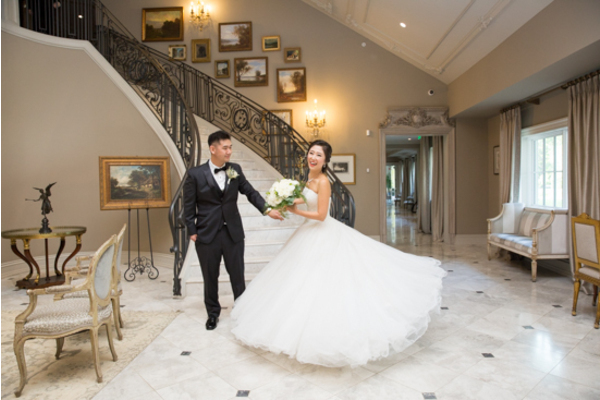 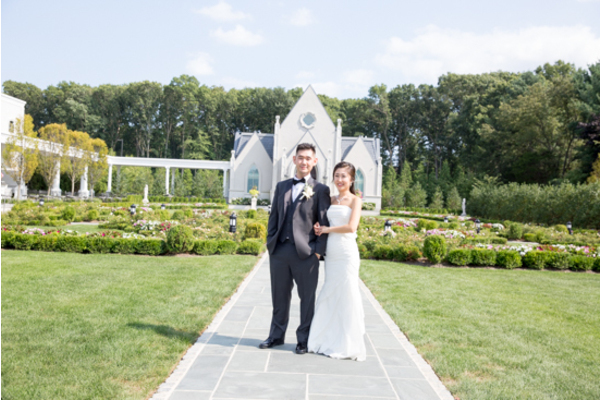 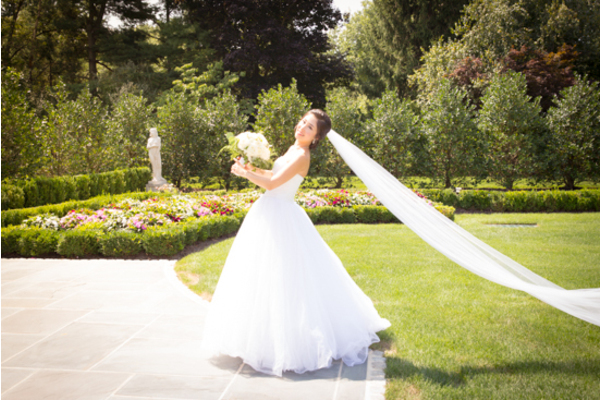 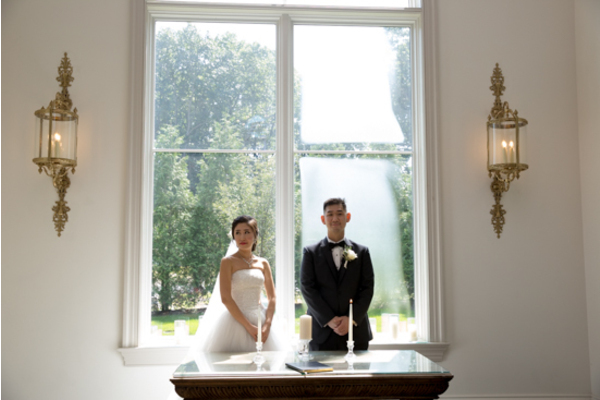 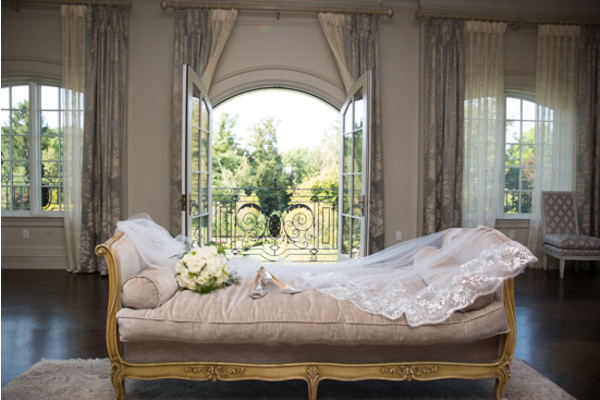 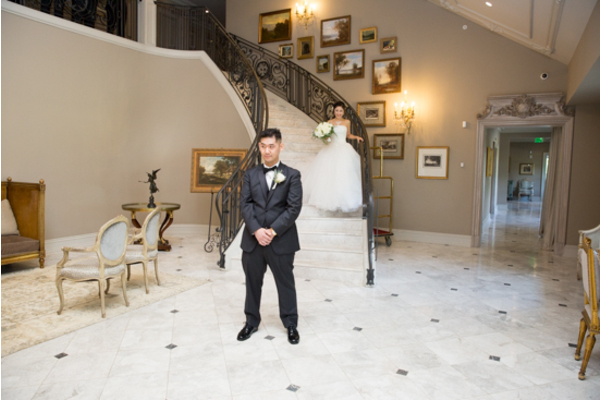 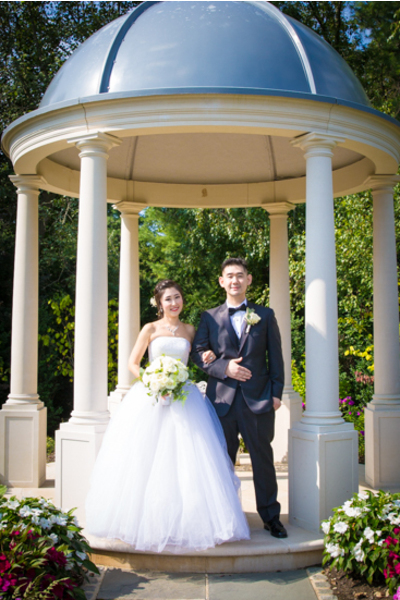 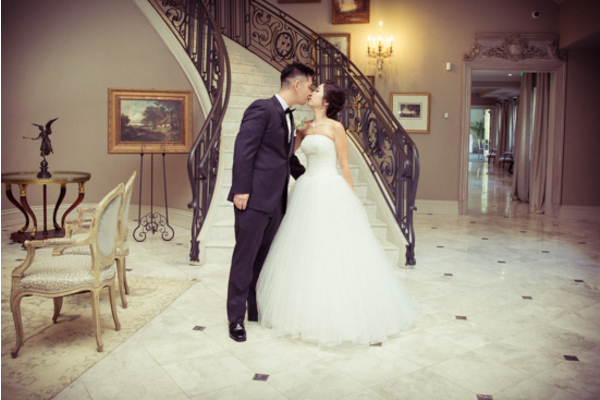 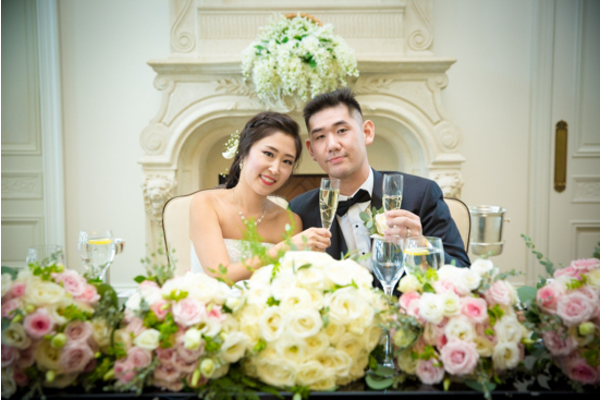 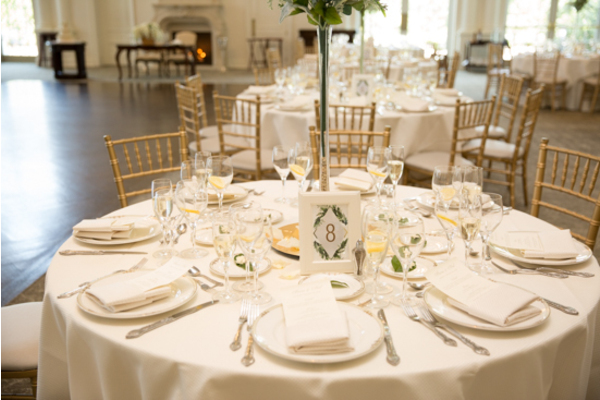 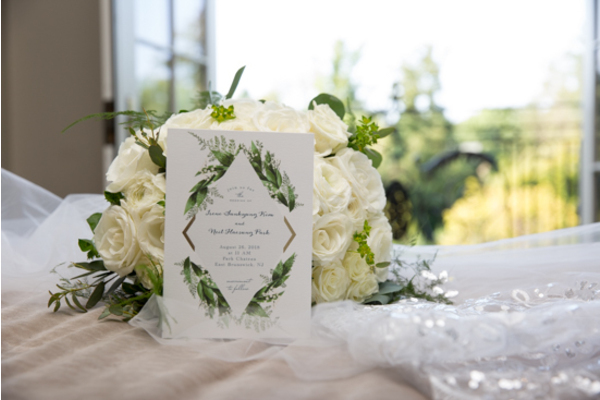 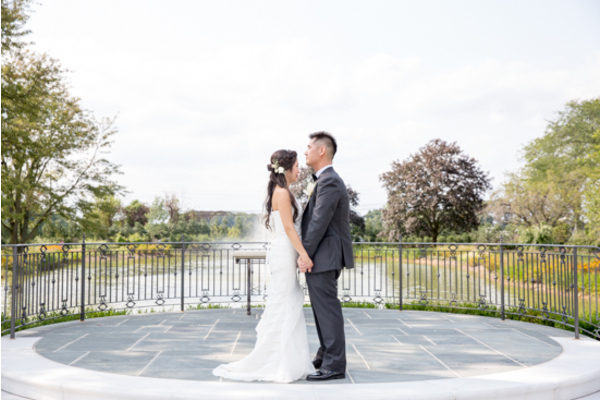 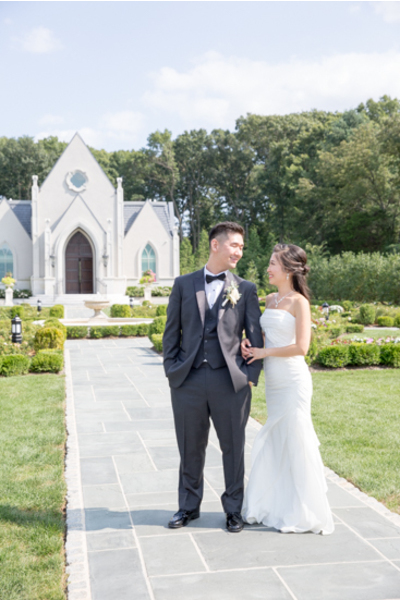 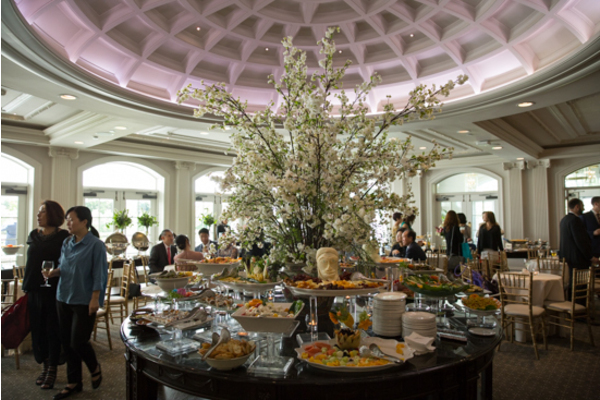 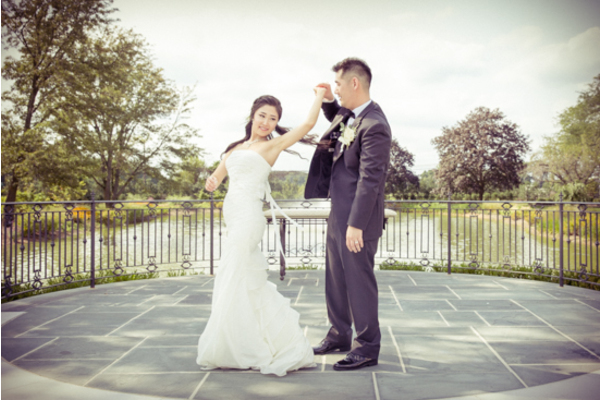 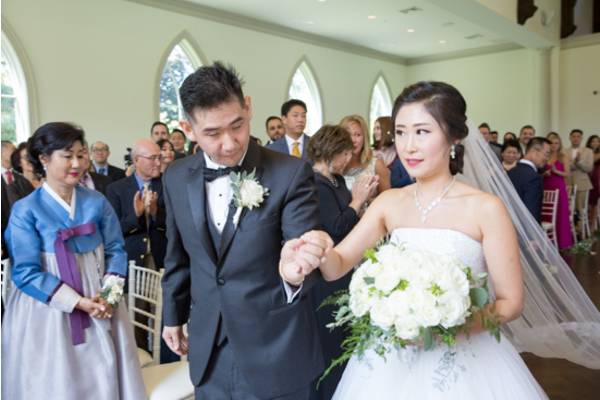 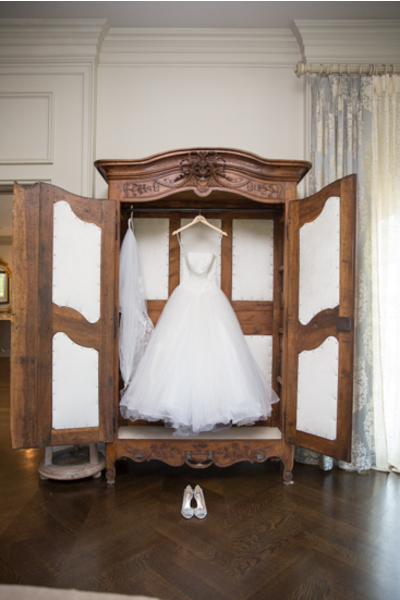 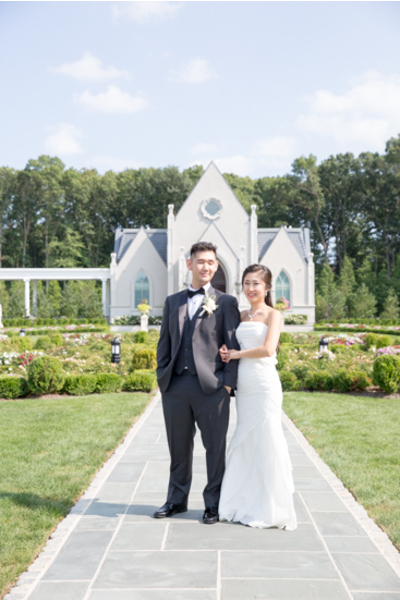 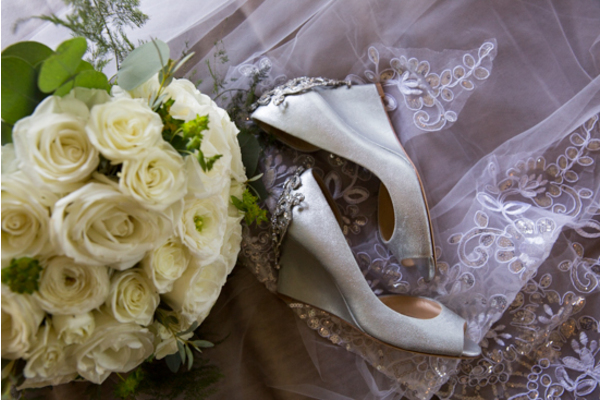 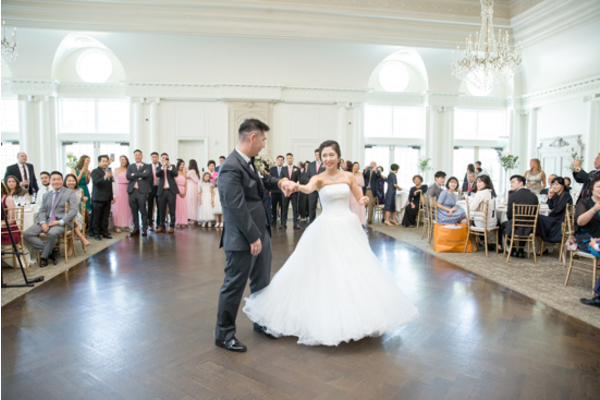 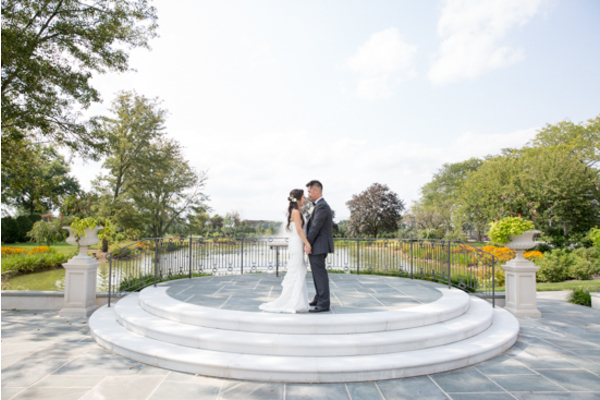 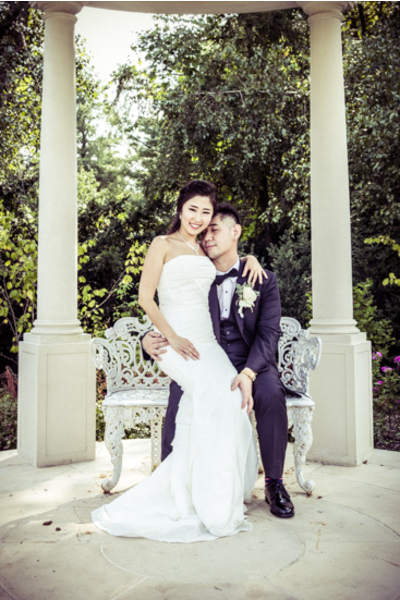 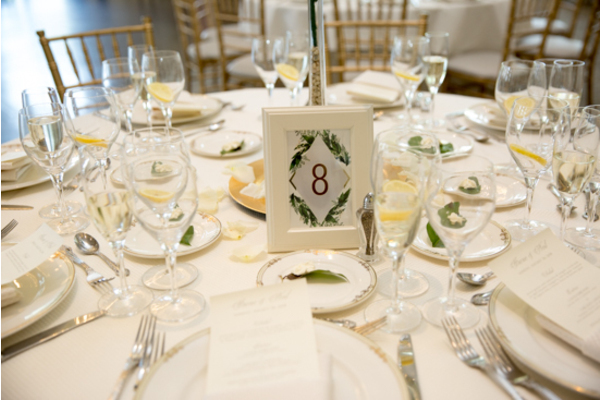 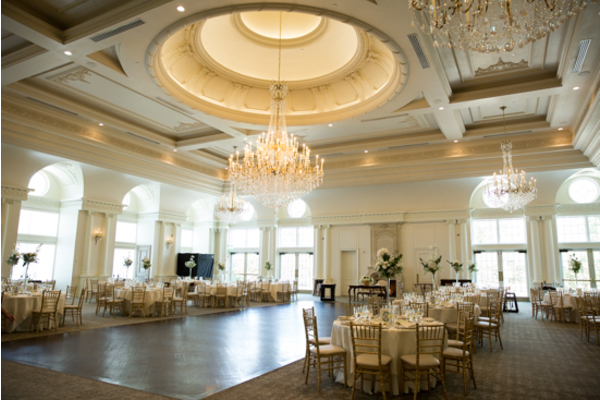 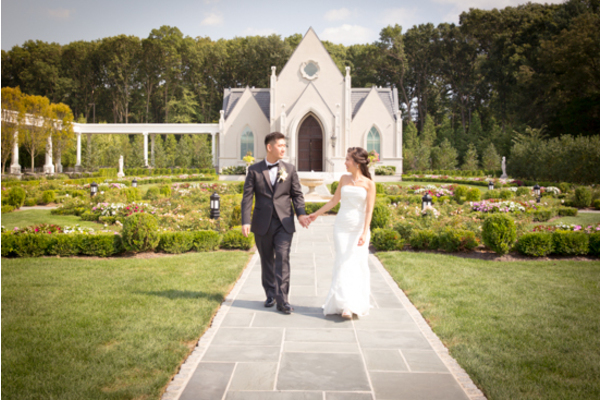 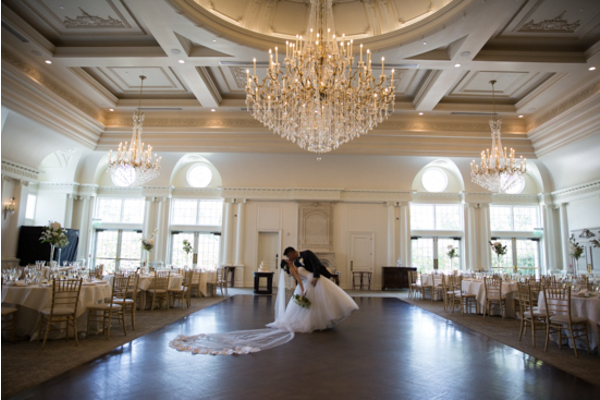 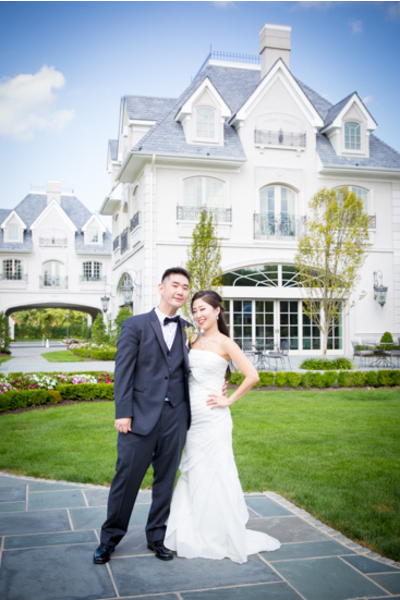 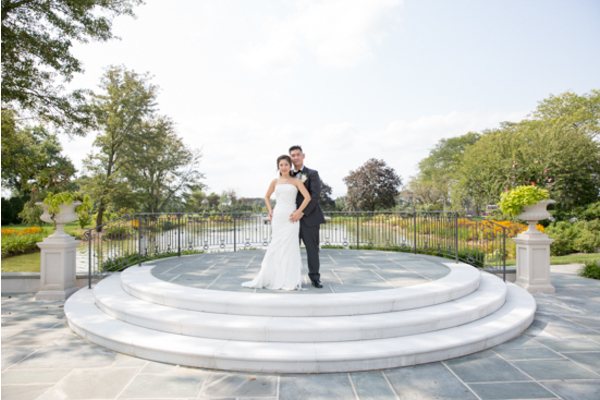 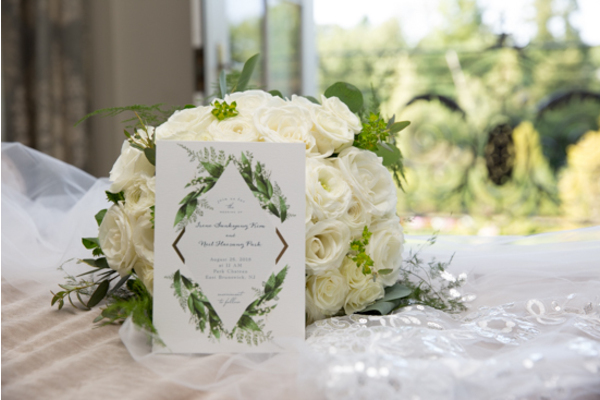 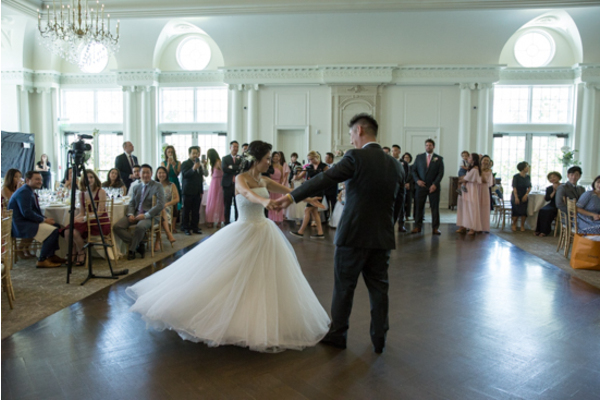 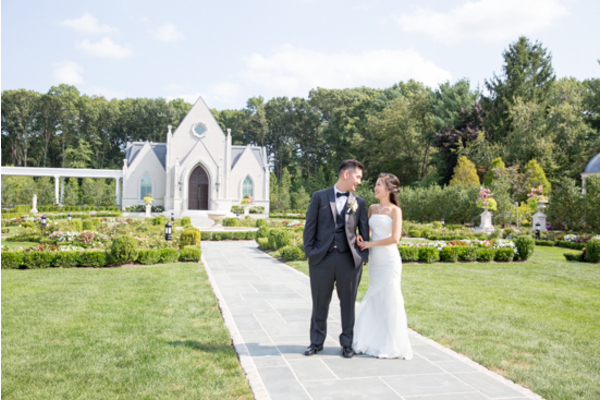 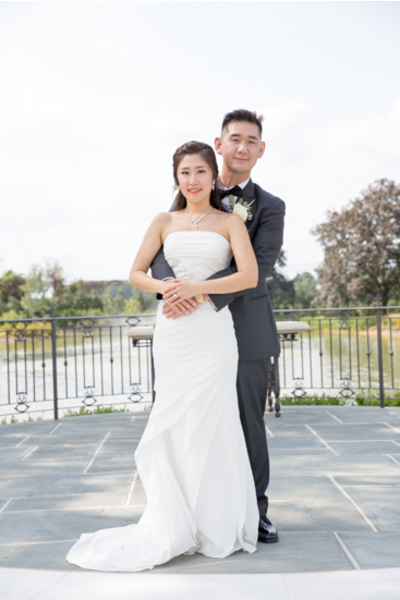 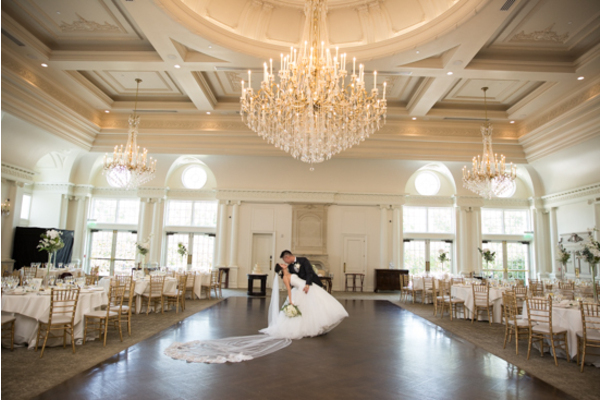 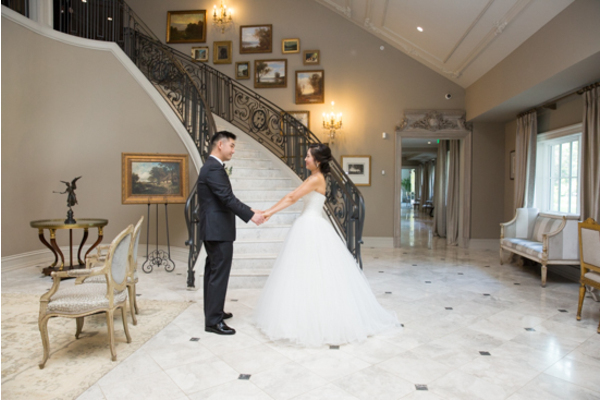 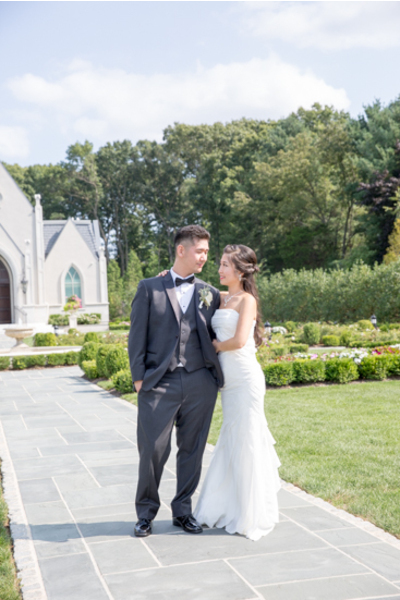 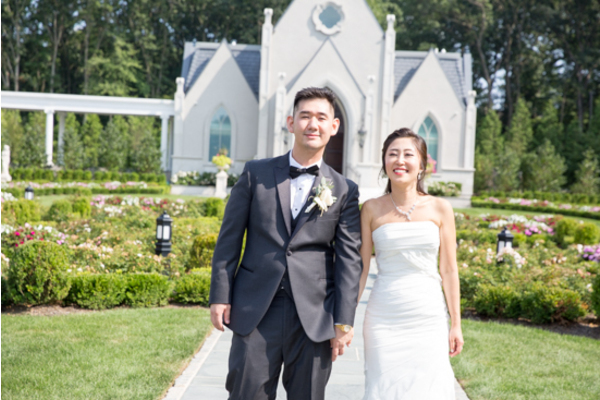 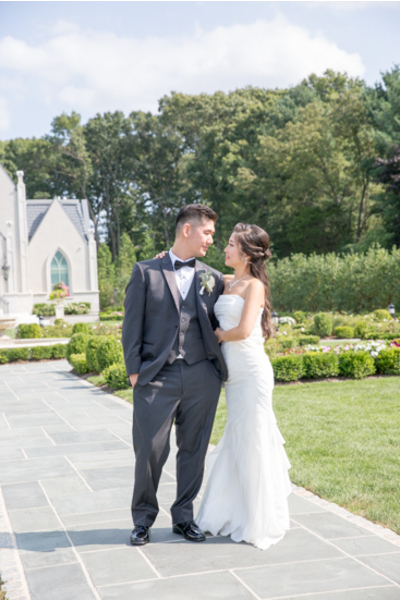 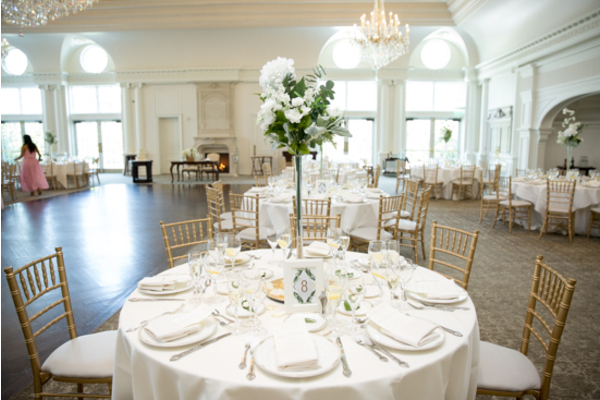 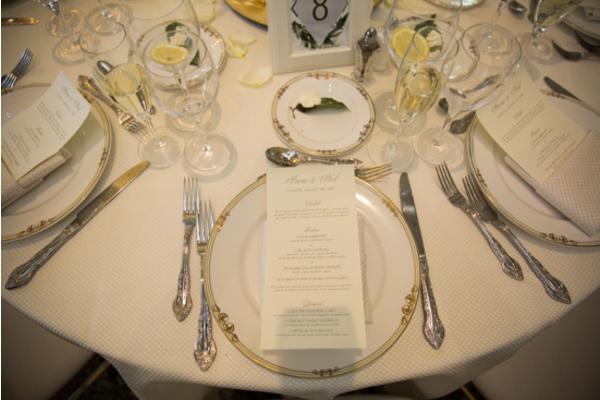 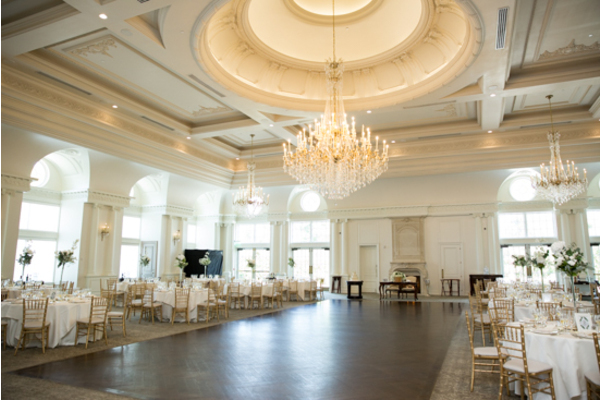 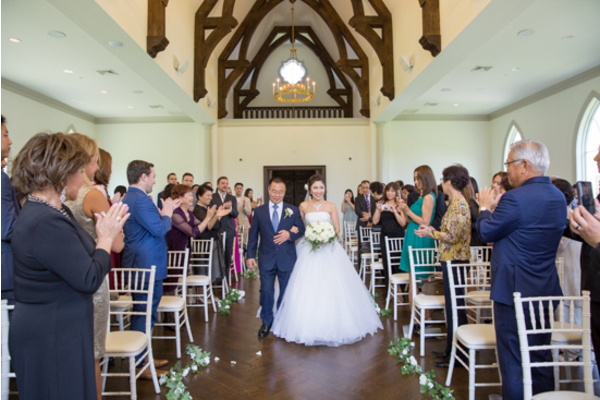 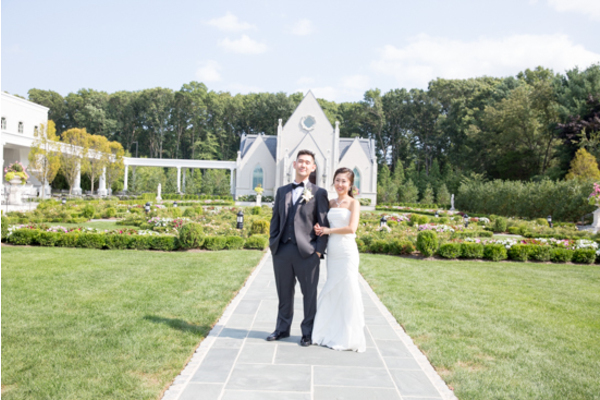 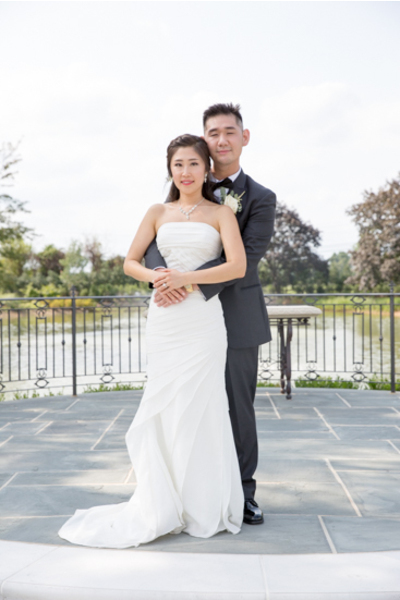 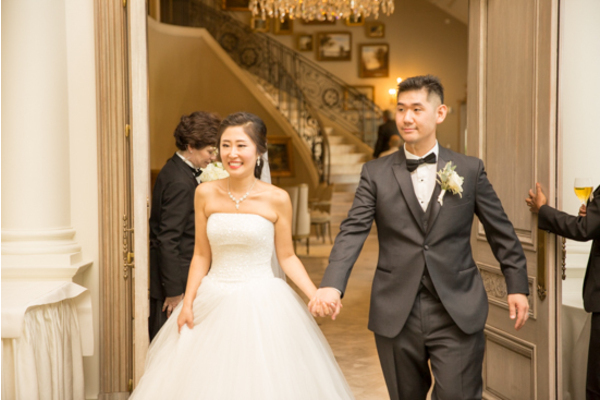 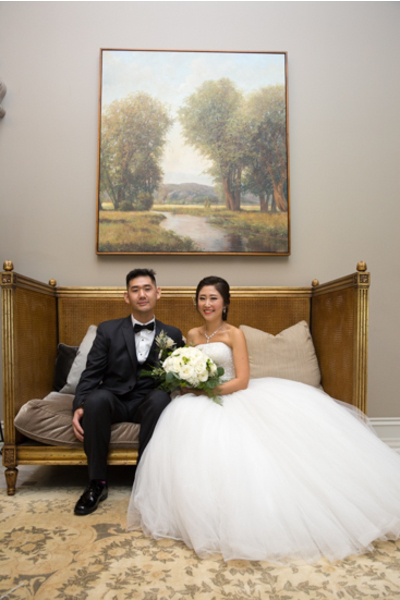 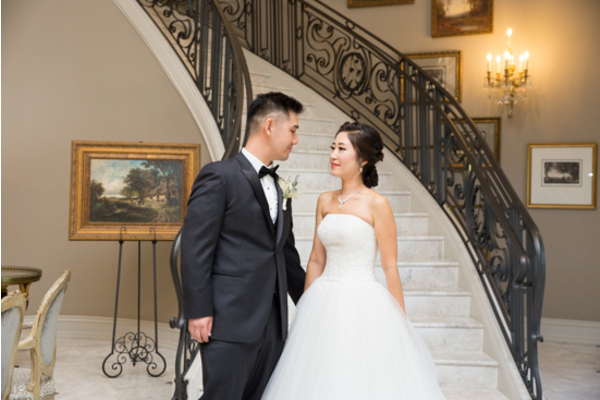 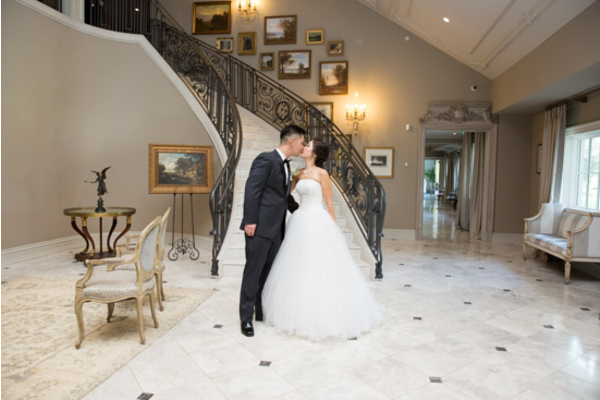 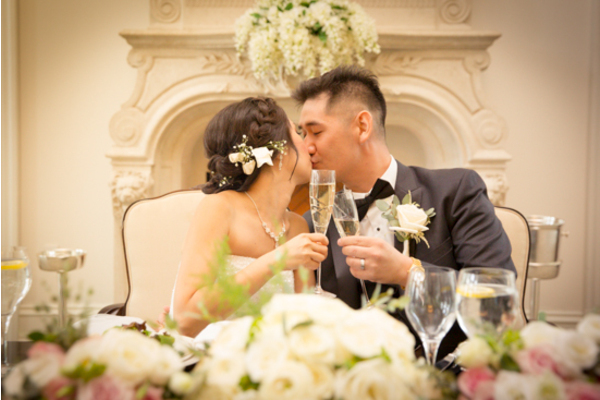 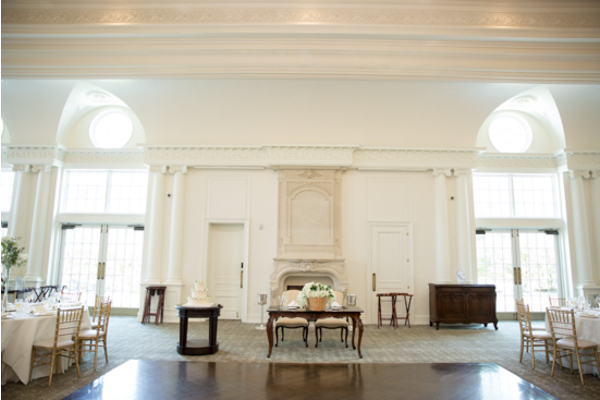 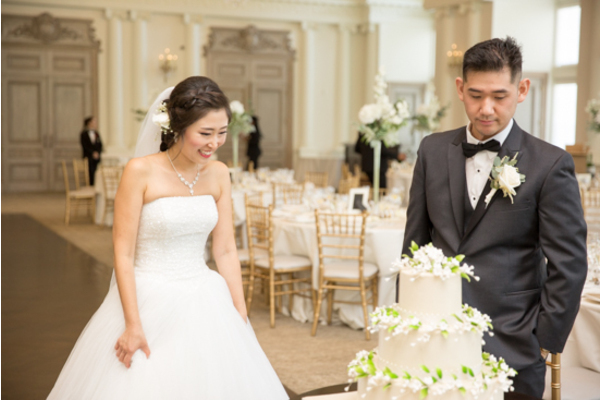 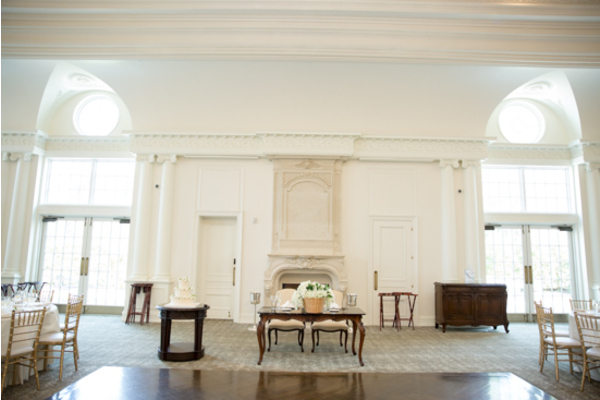 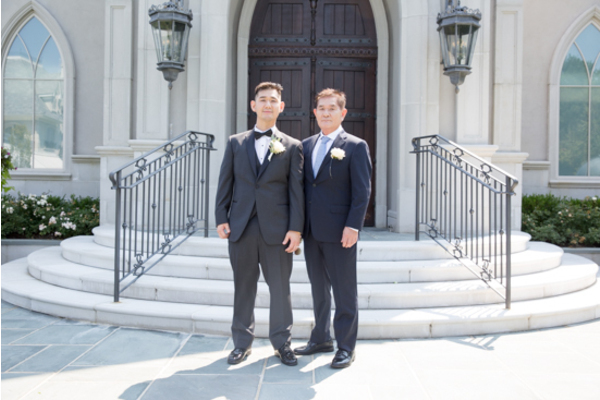 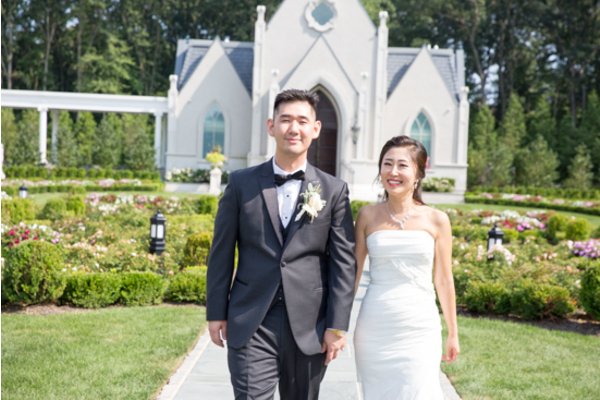 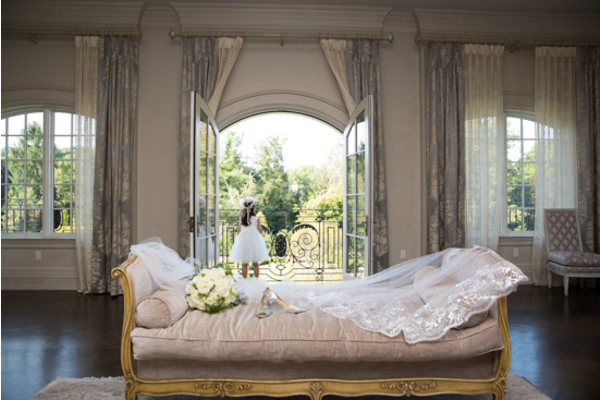 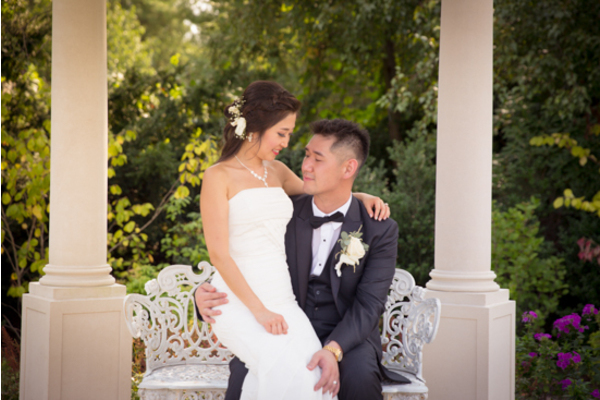 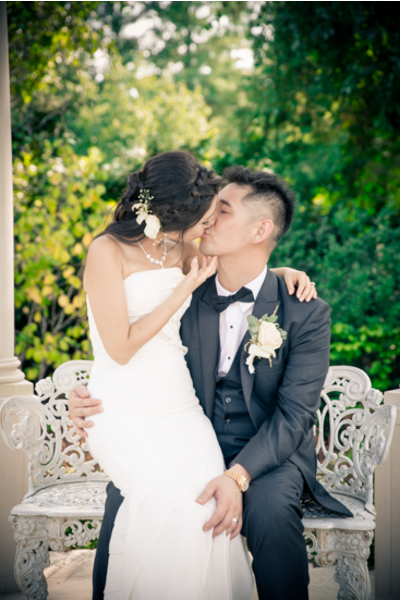 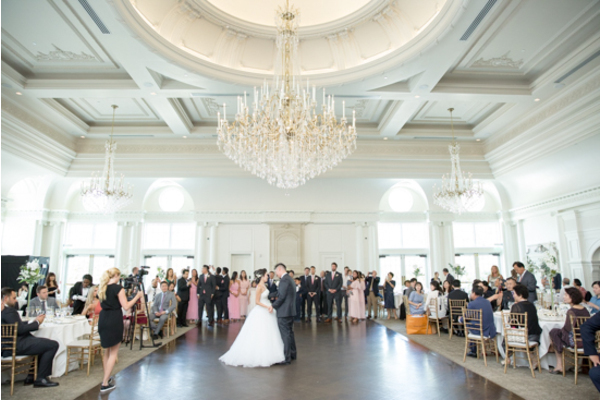 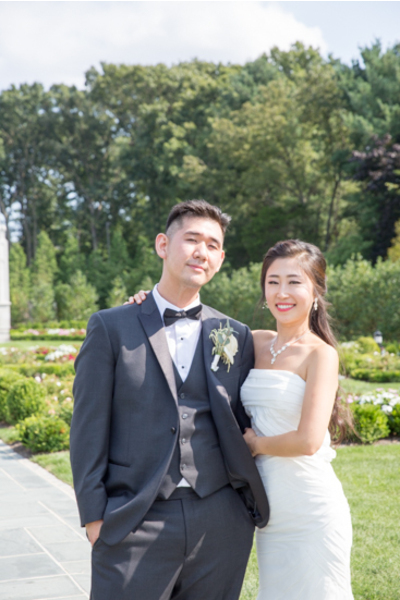 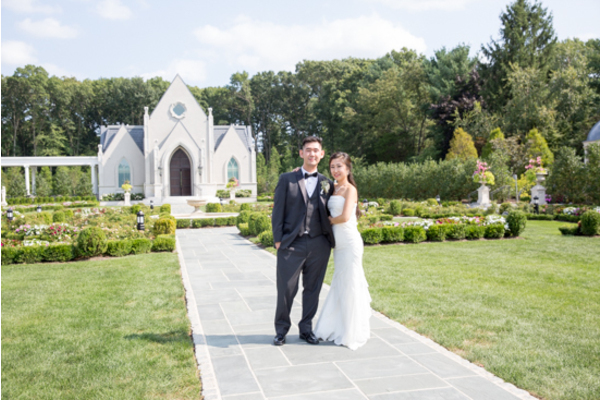 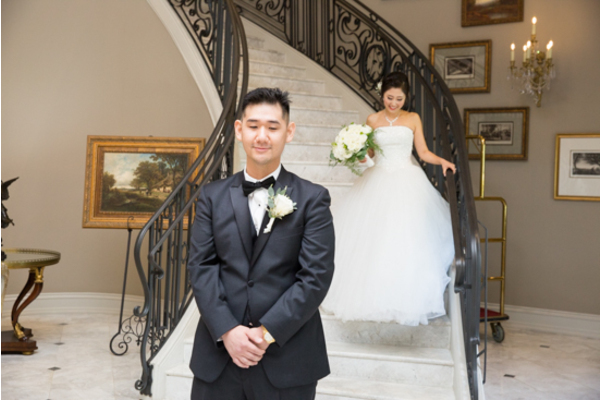 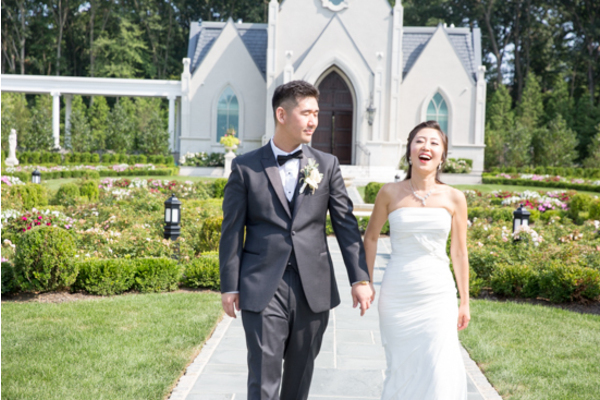 The couple said “I Do” at the elegant Park Chateau Estate and Gardens in East Brunswick, NJ. 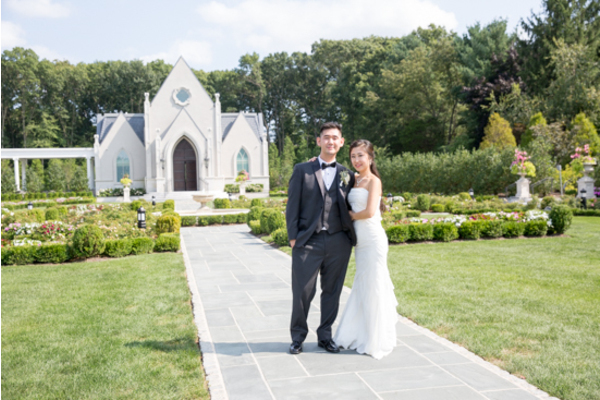 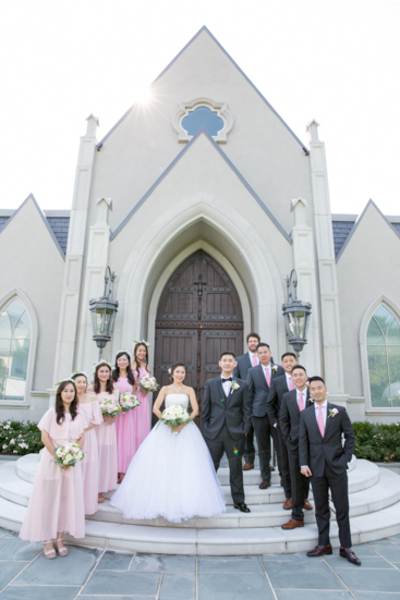 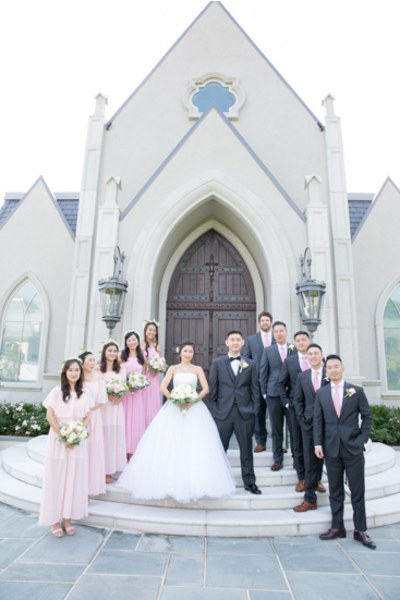 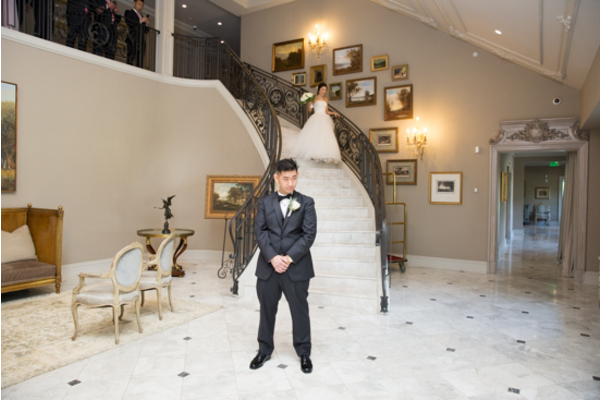 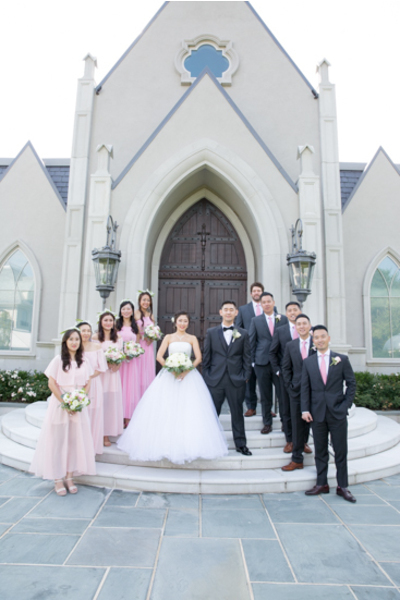 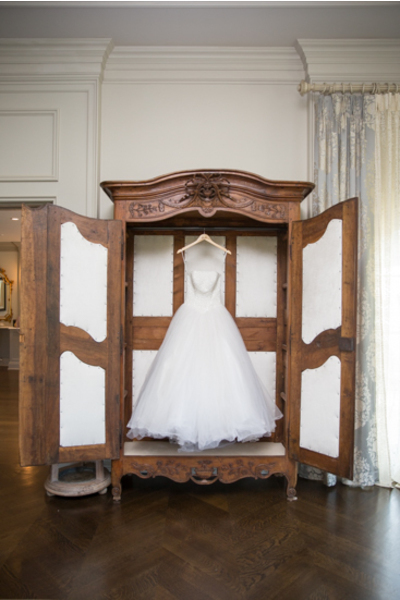 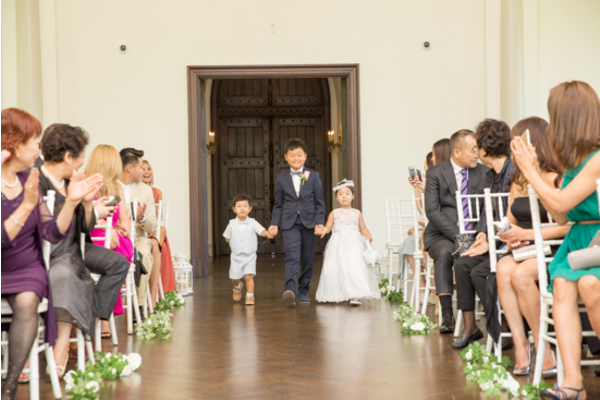 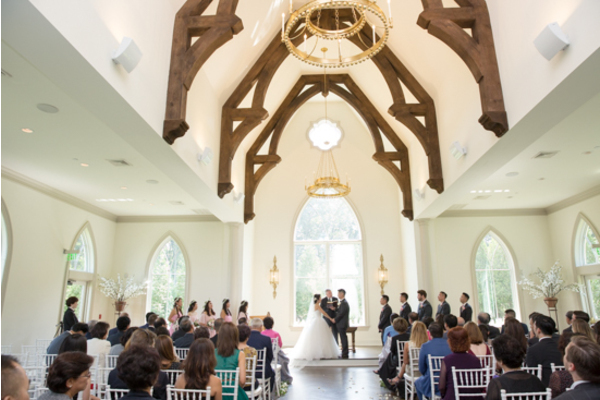 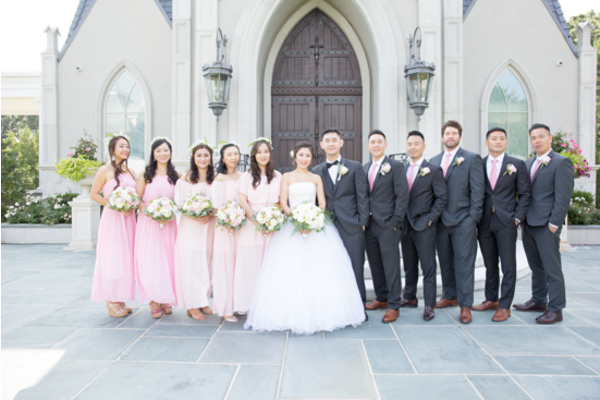 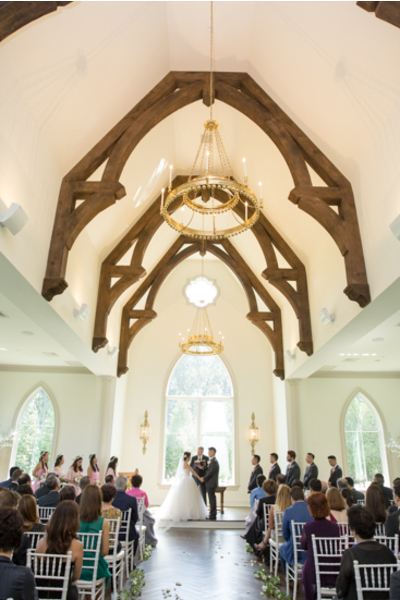 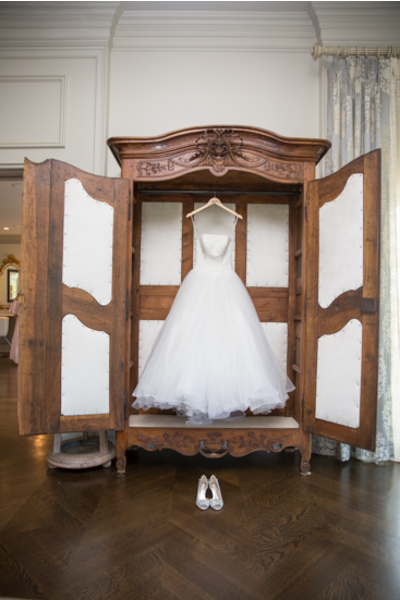 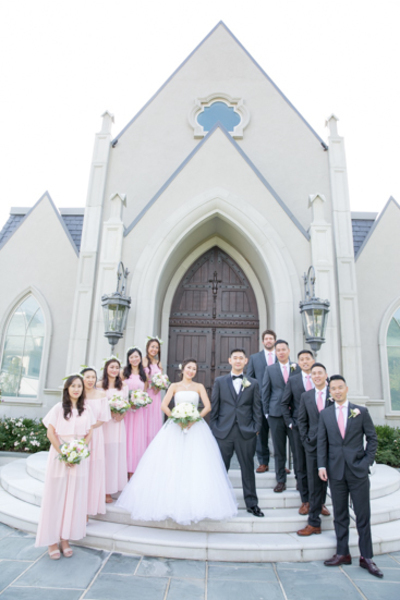 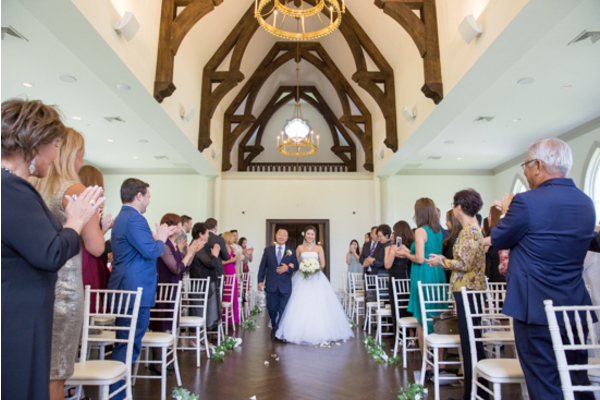 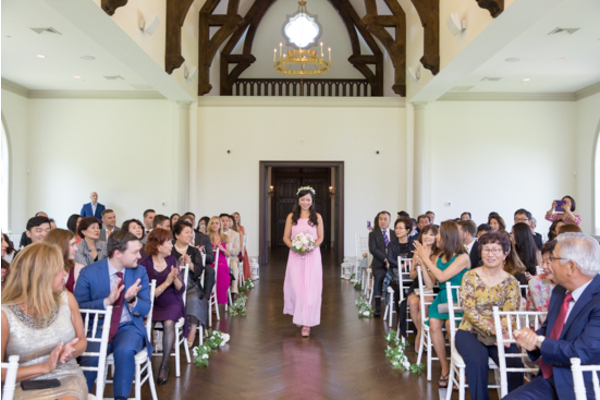 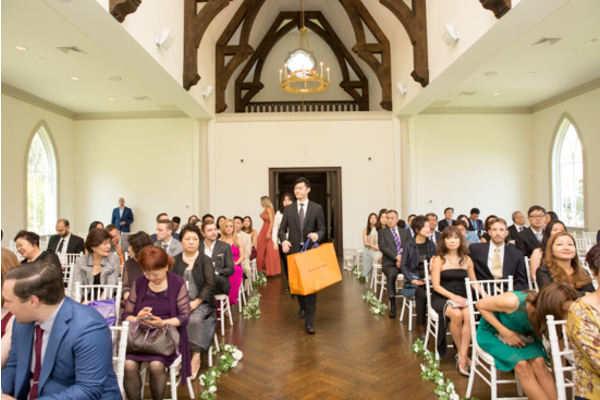 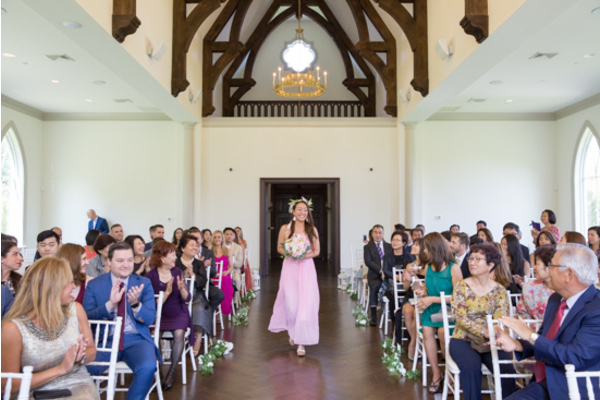 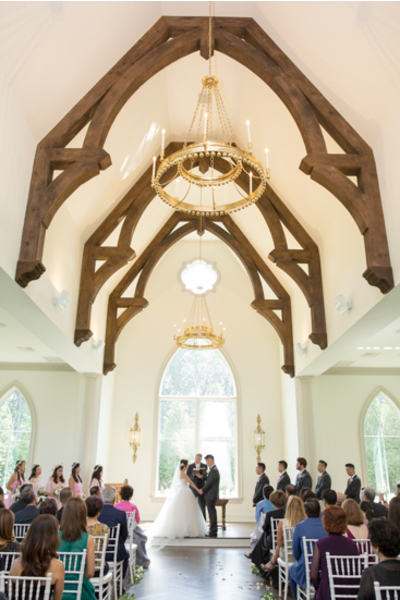 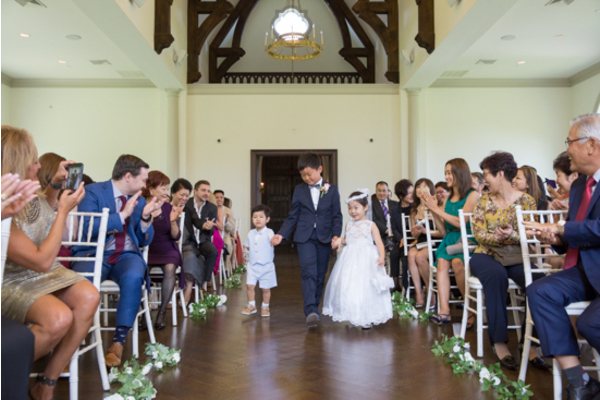 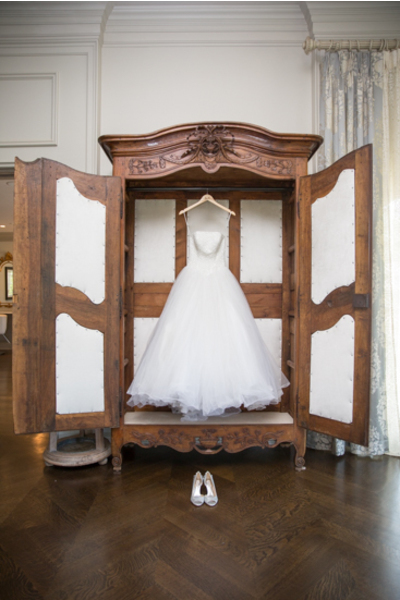 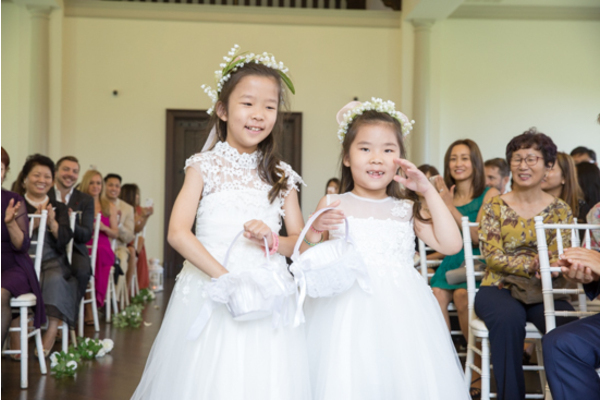 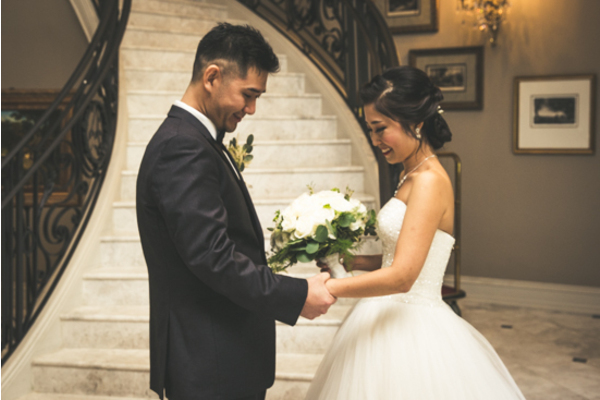 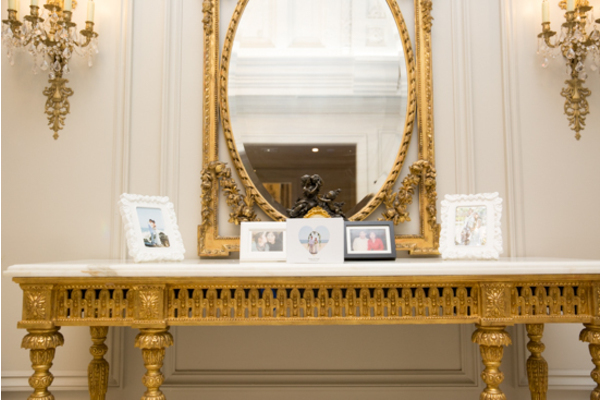 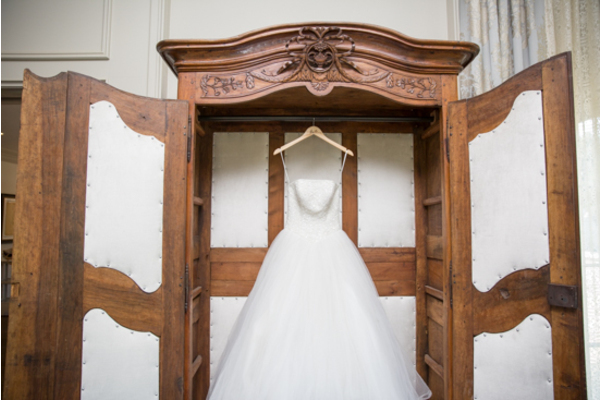 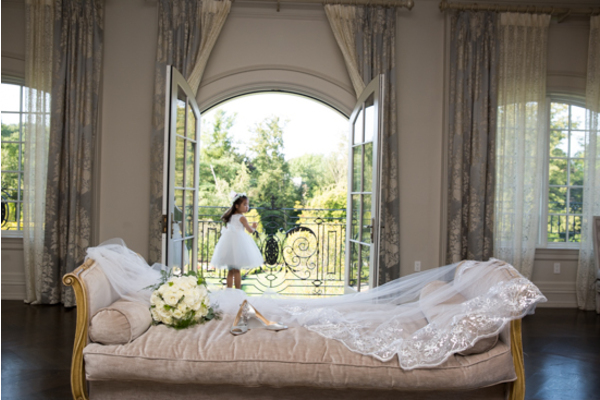 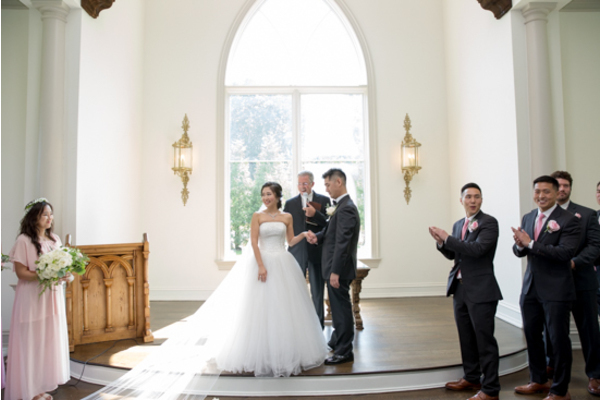 This castle-like venue was the perfect venue for their fairytale to unfold! 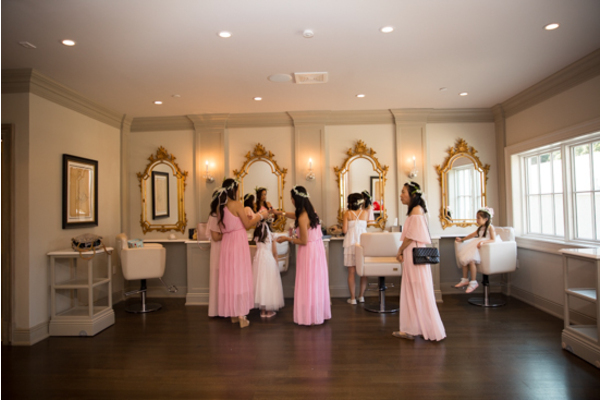 First off, Irene spent the morning getting pampered with her girls by her side. 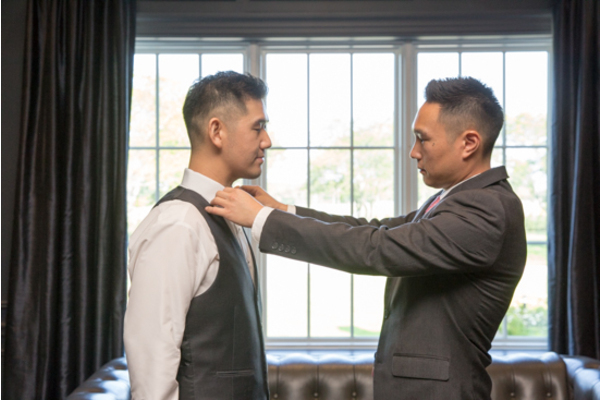 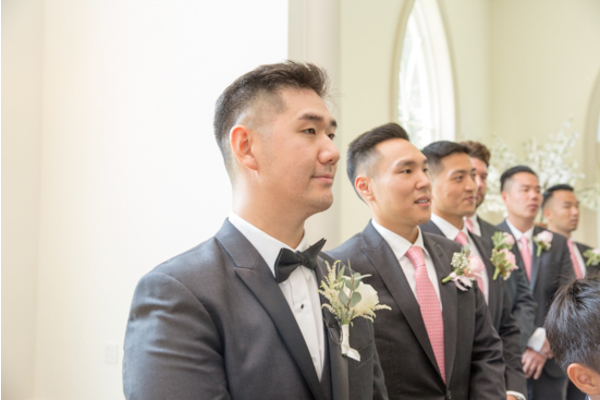 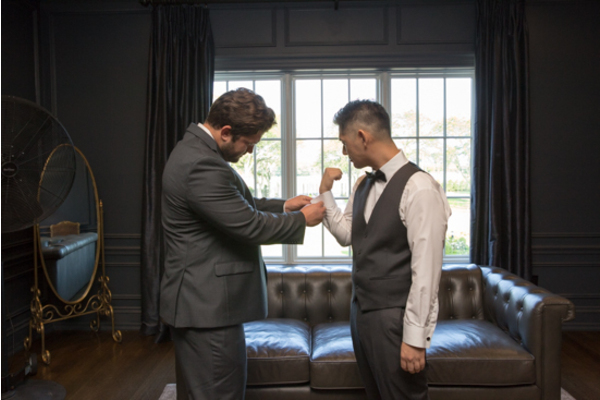 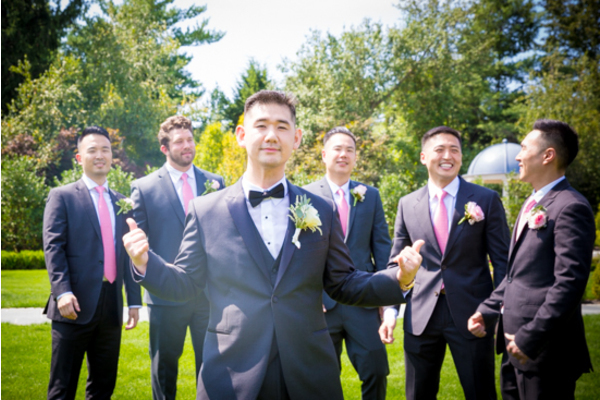 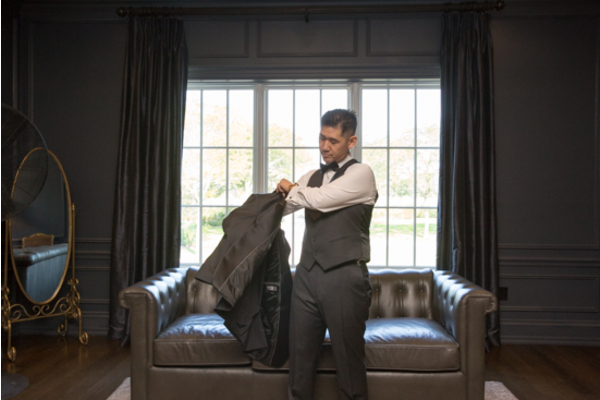 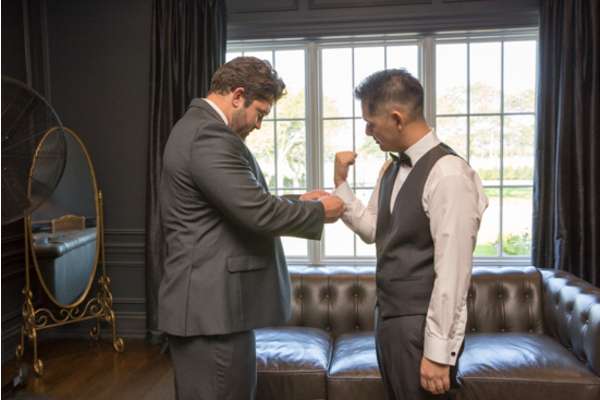 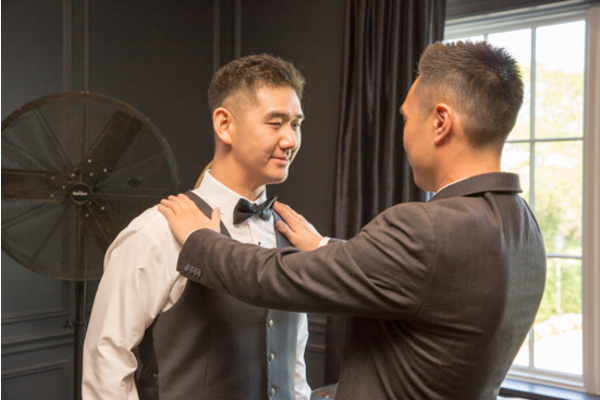 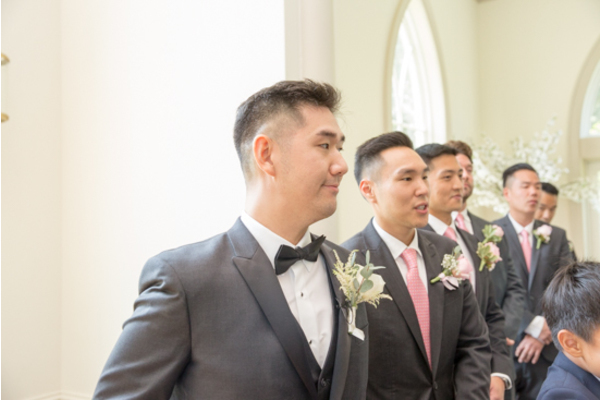 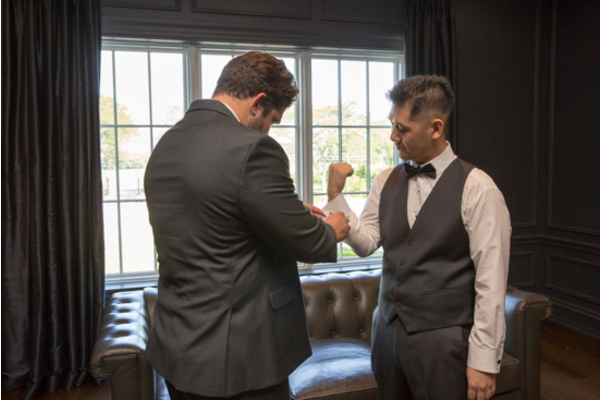 Across the way, Neil was getting ready with his groomsmen, too. 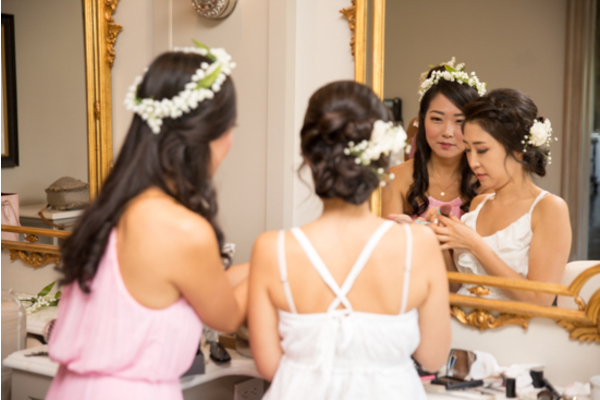 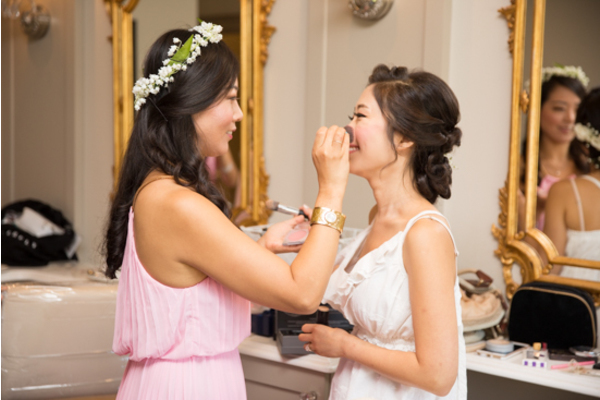 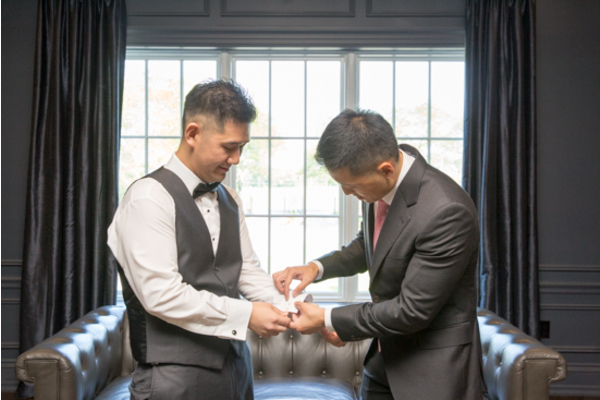 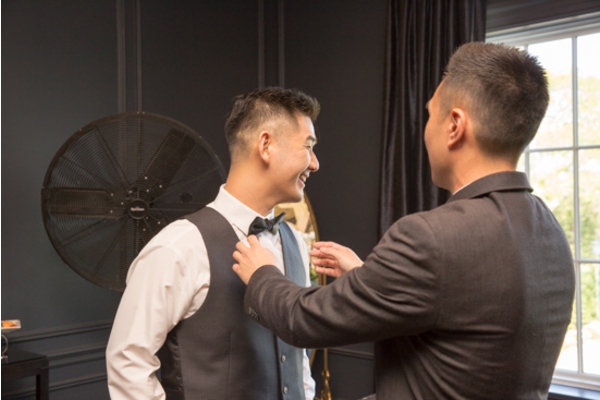 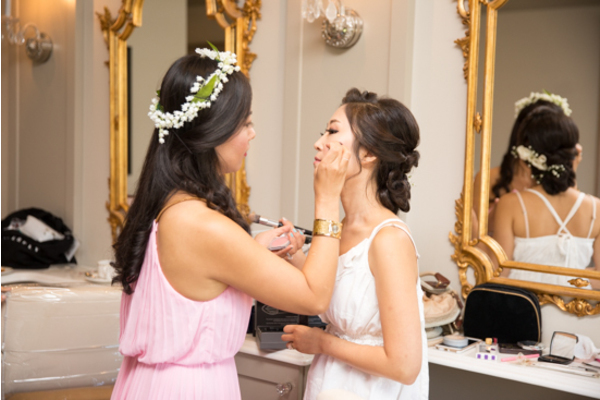 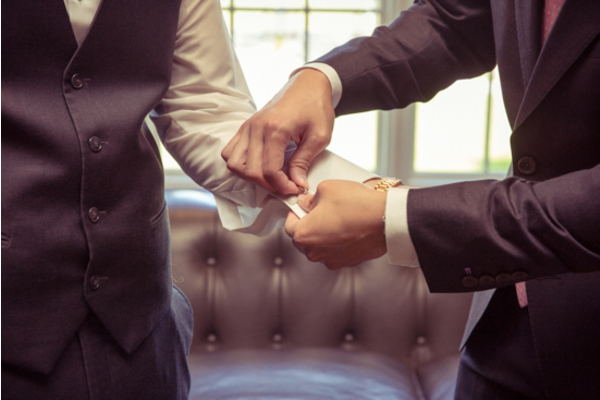 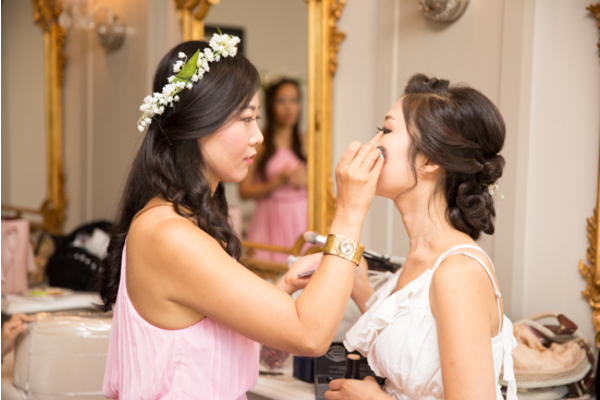 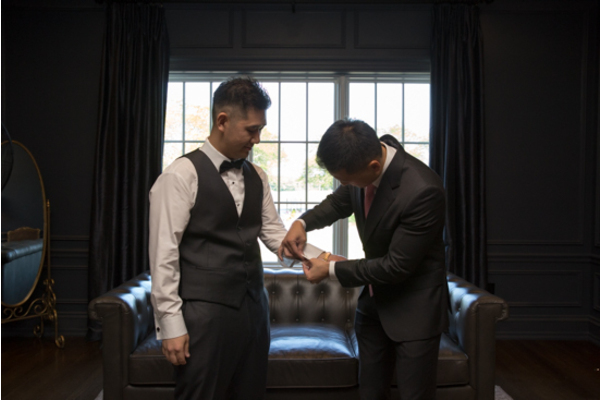 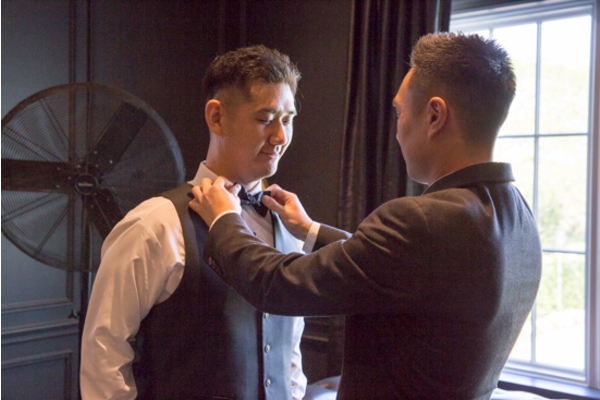 Our NJ Wedding Photographer captured the mother of the bride and her maid of honor helping with the final touches of Irene’s dress. 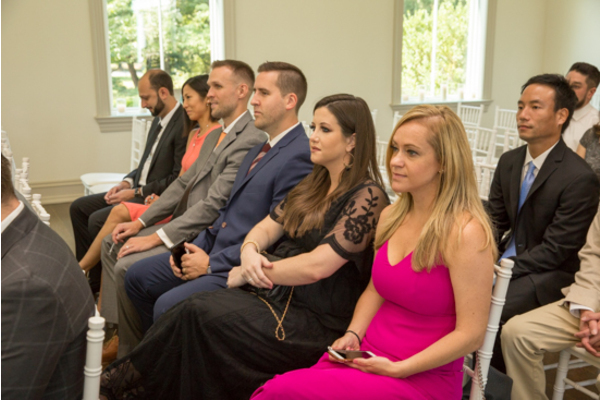 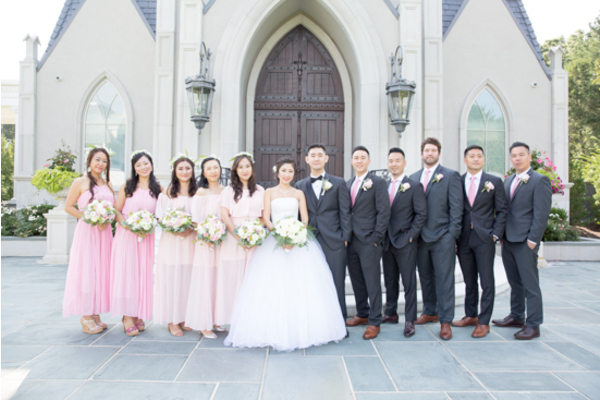 In addition, the bridal party posed for pictures before the ceremony. 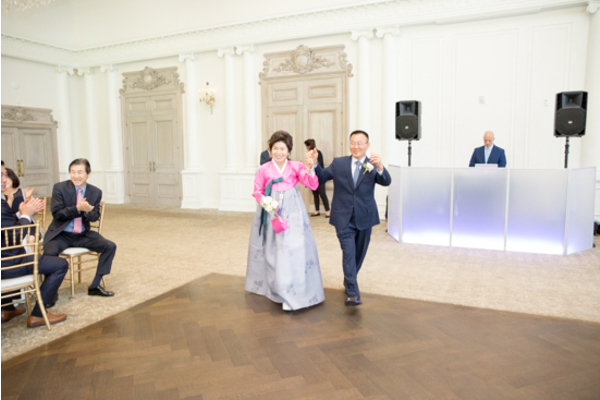 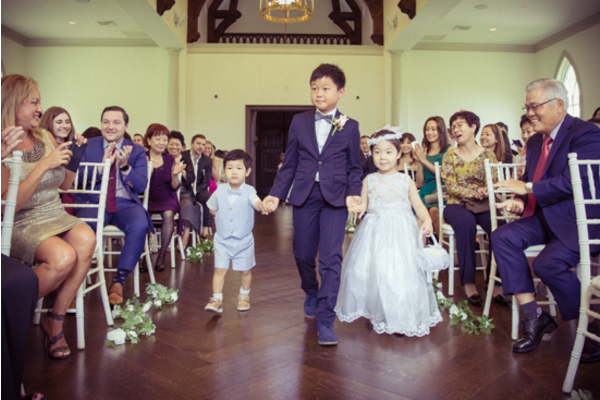 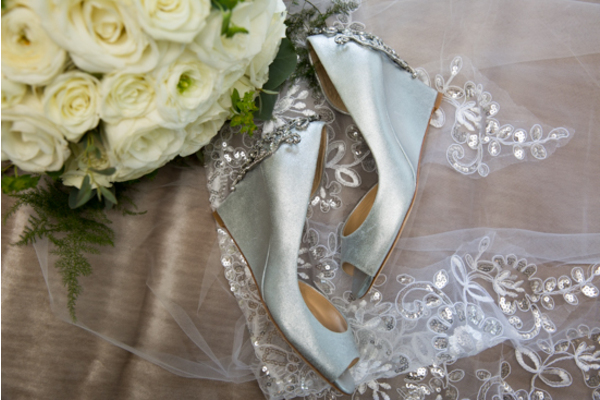 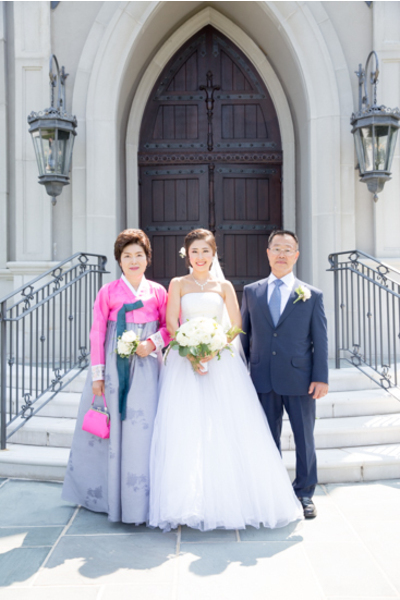 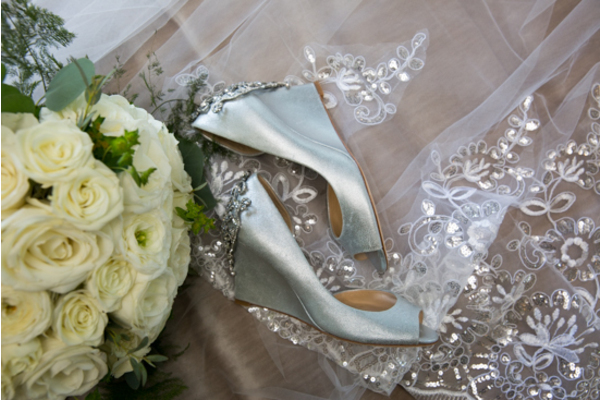 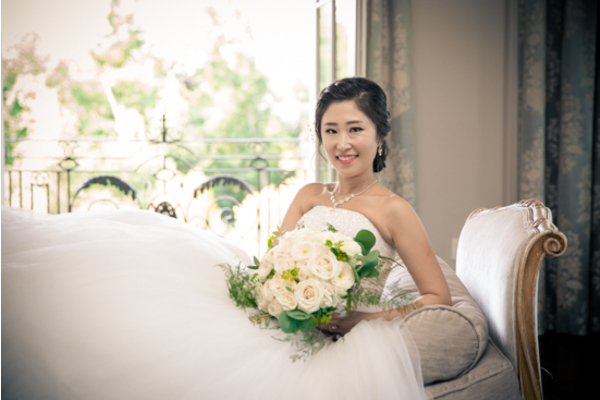 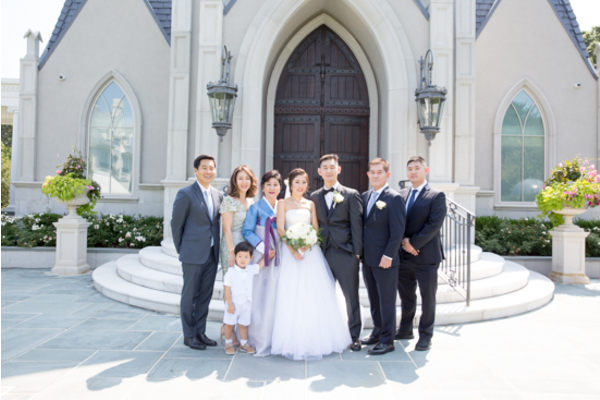 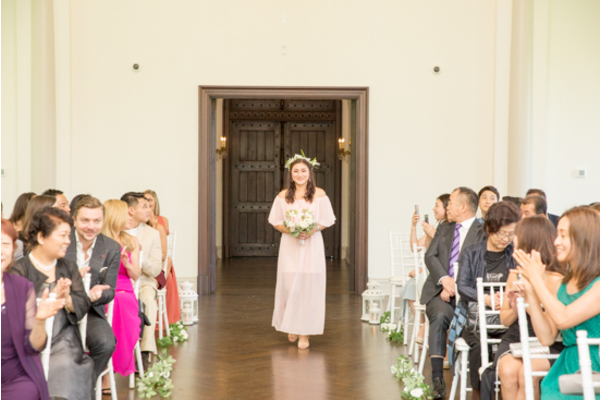 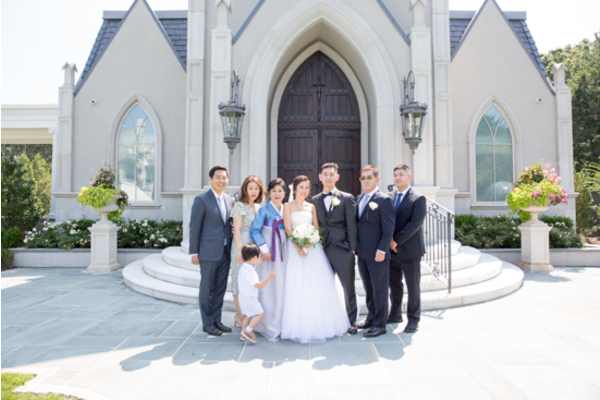 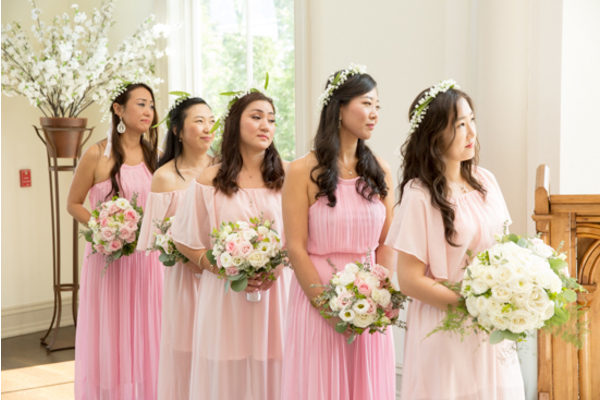 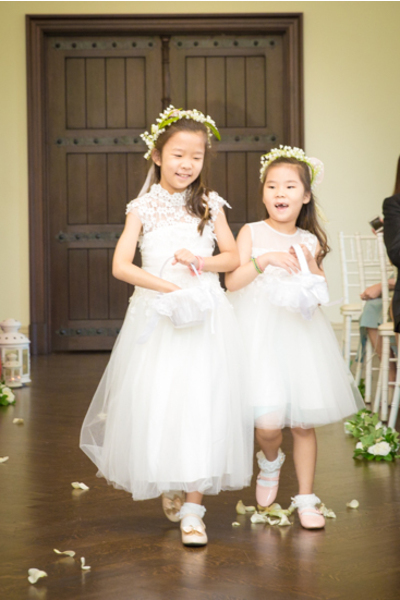 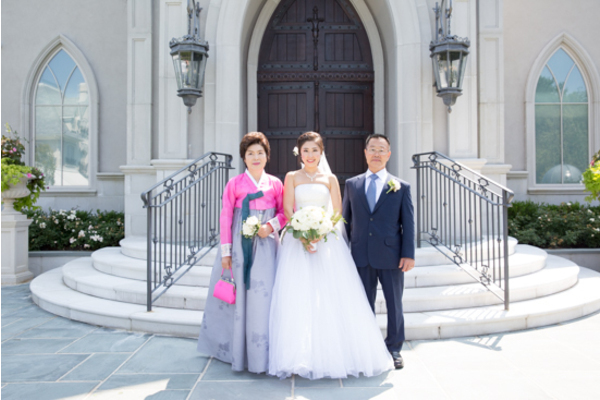 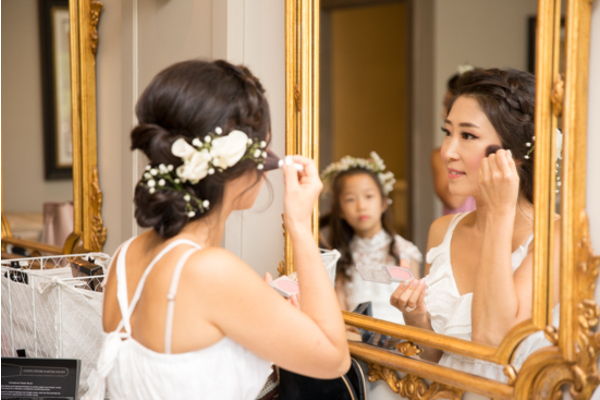 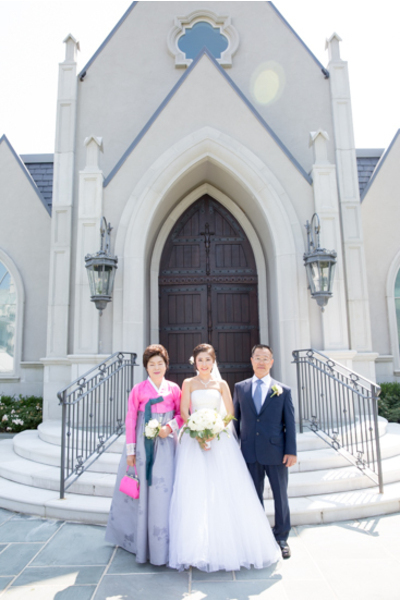 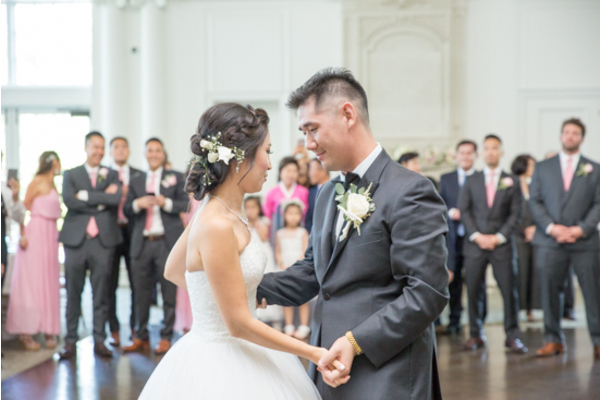 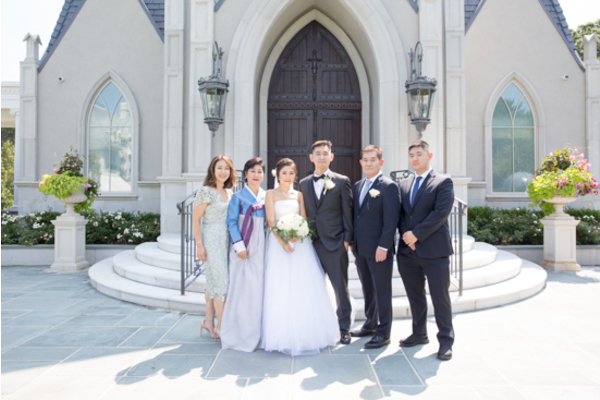 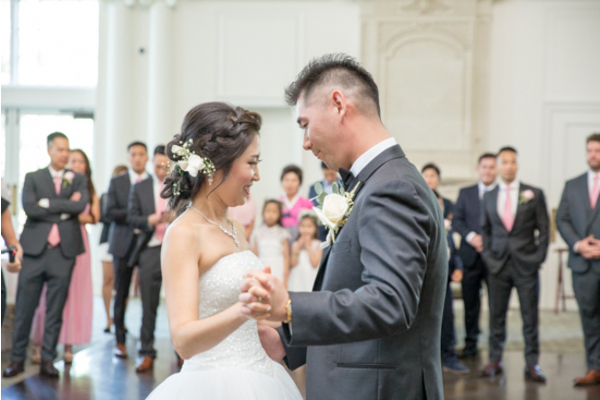 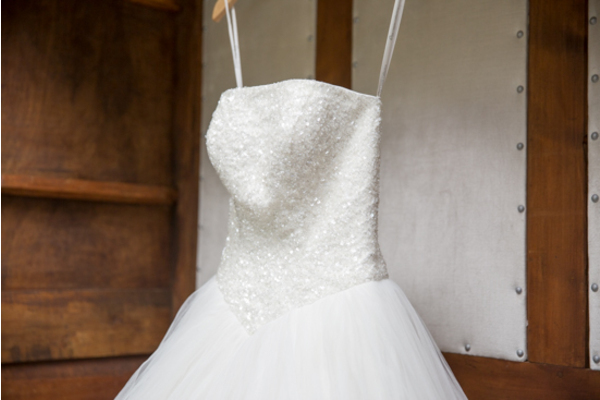 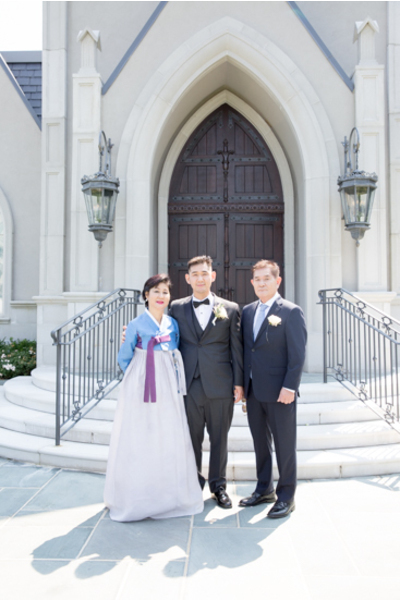 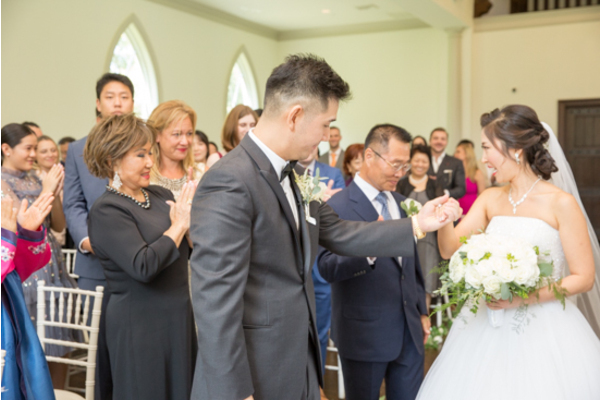 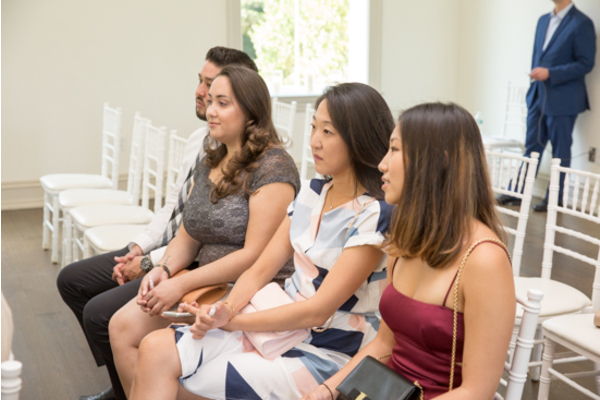 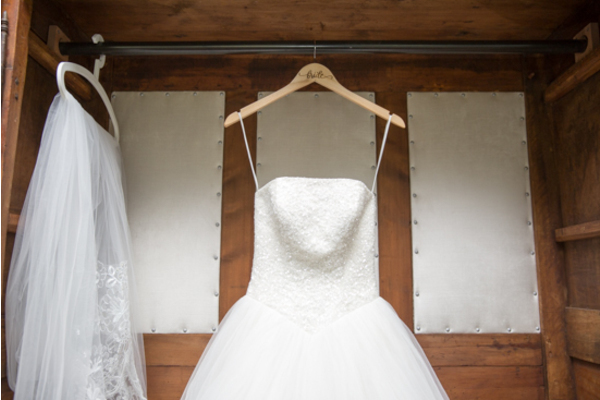 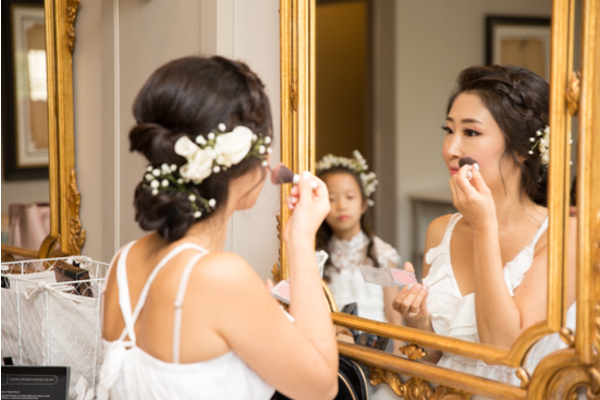 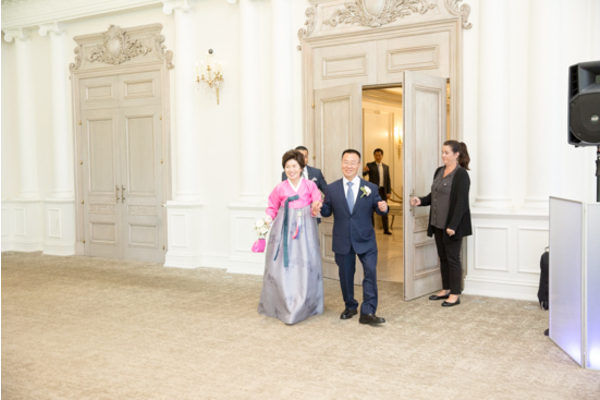 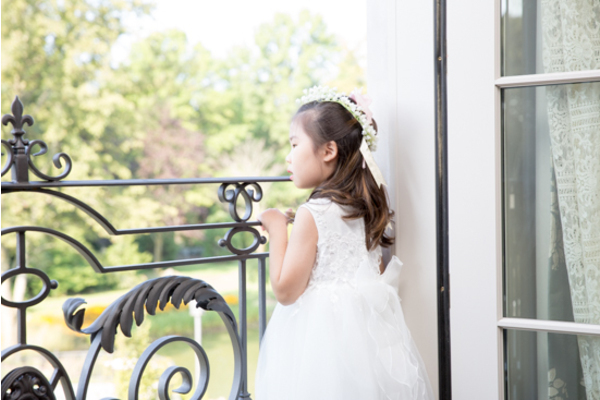 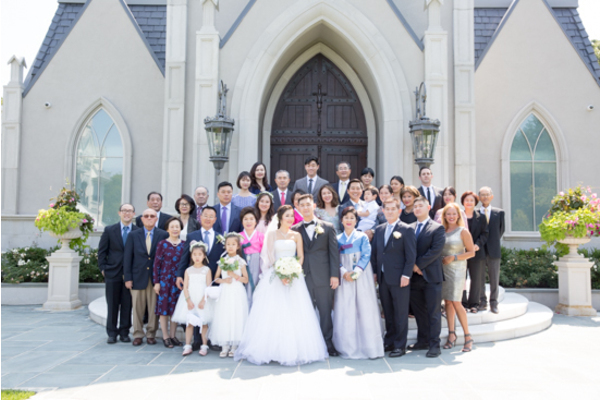 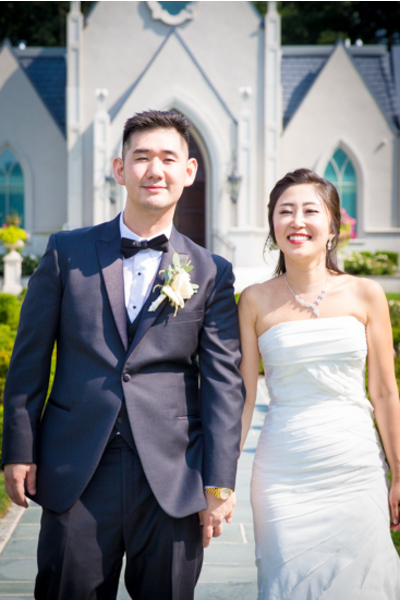 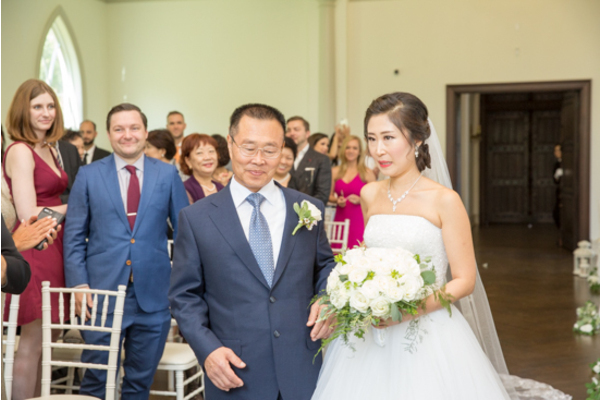 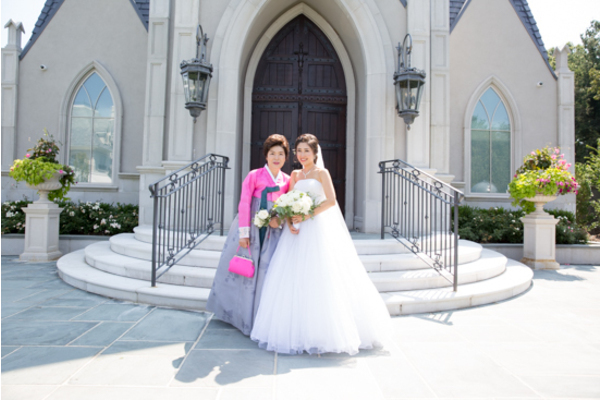 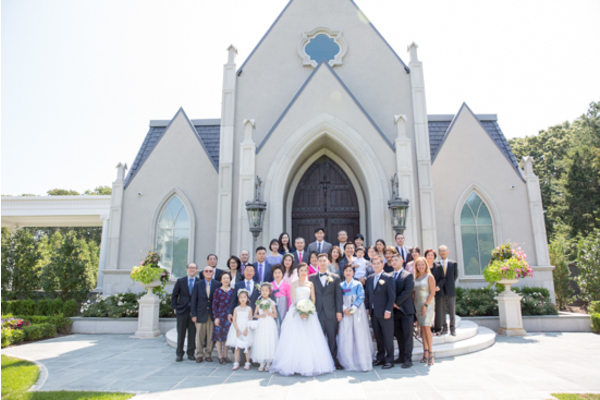 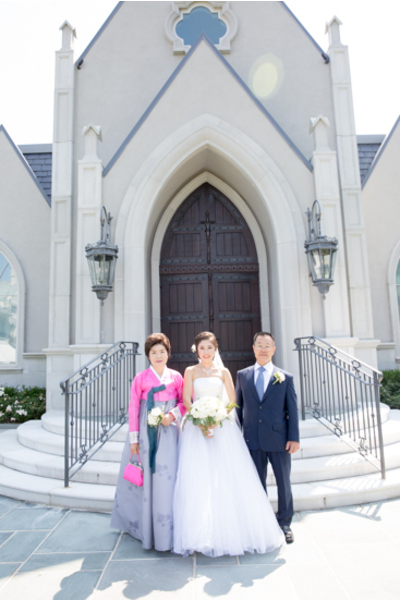 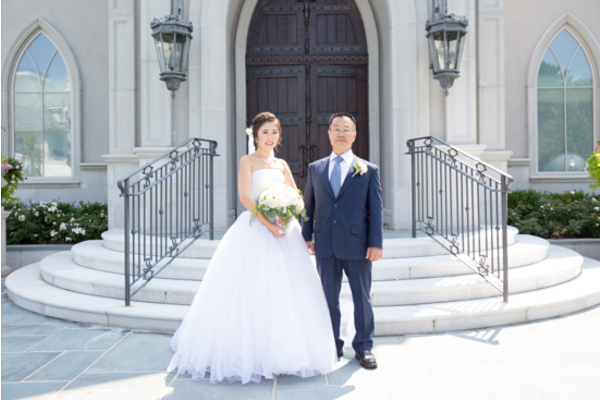 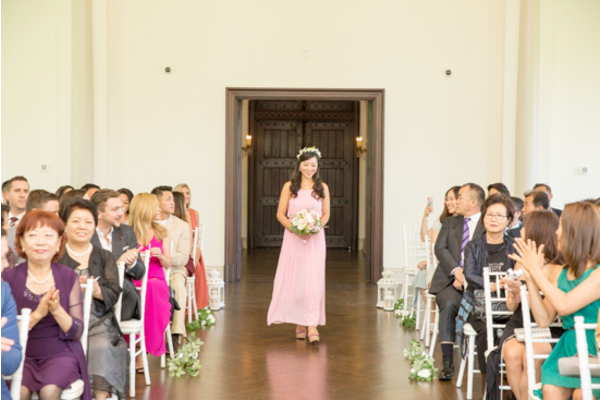 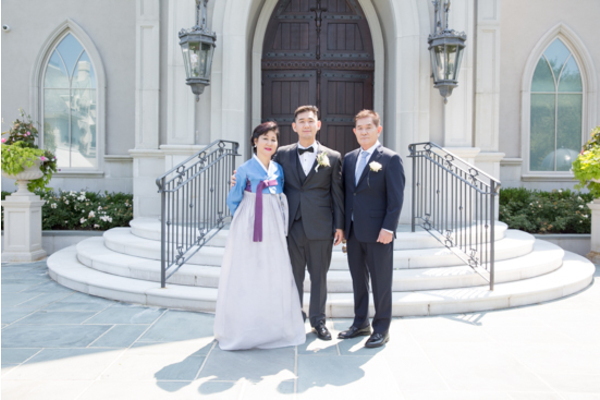 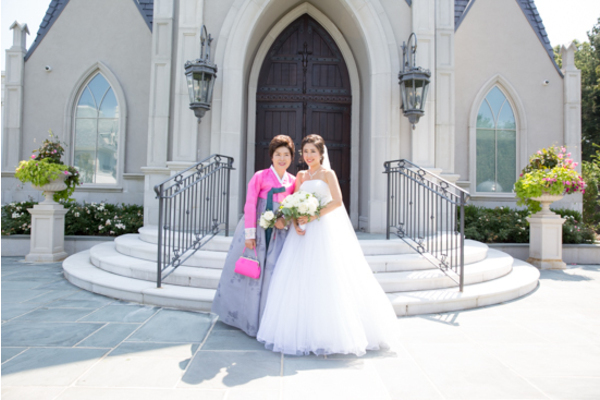 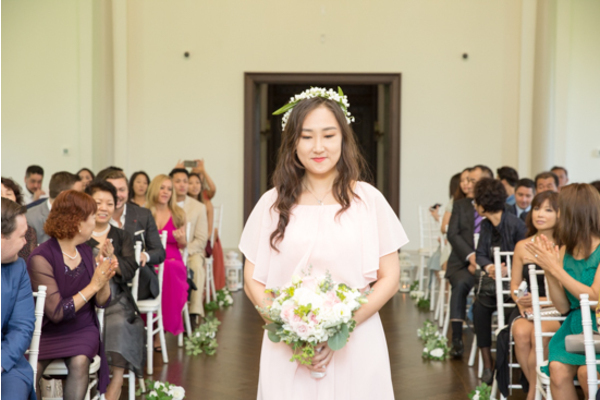 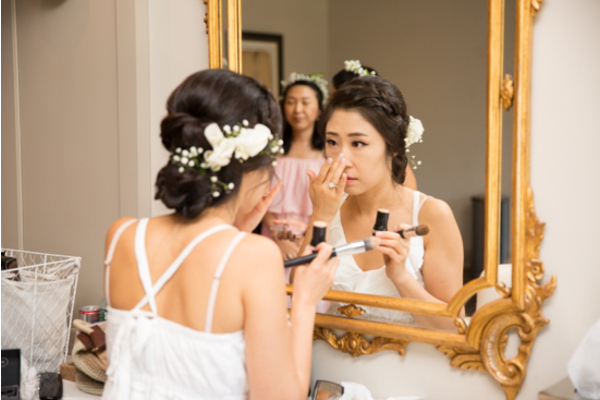 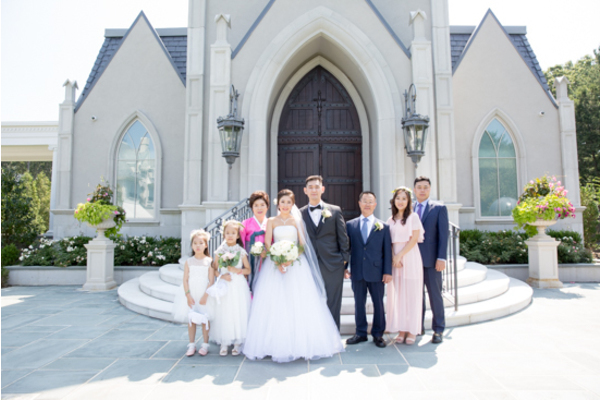 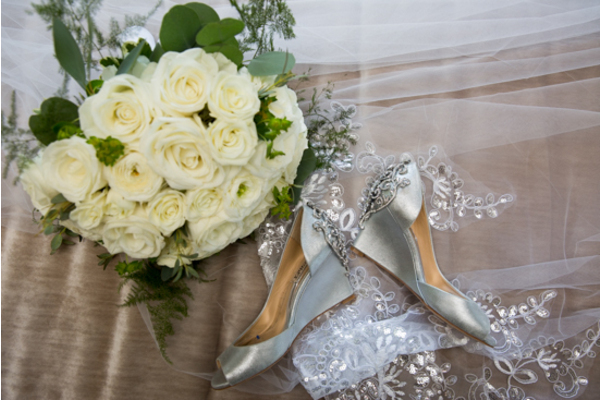 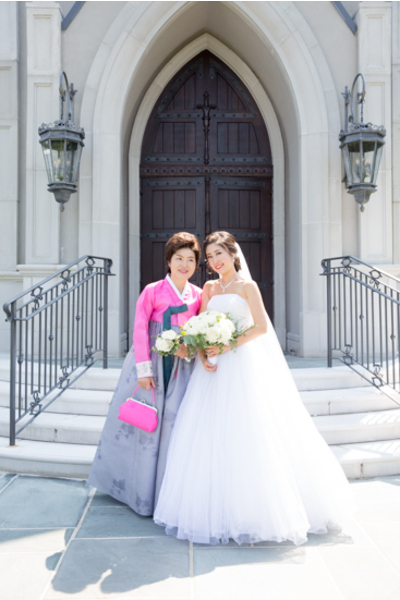 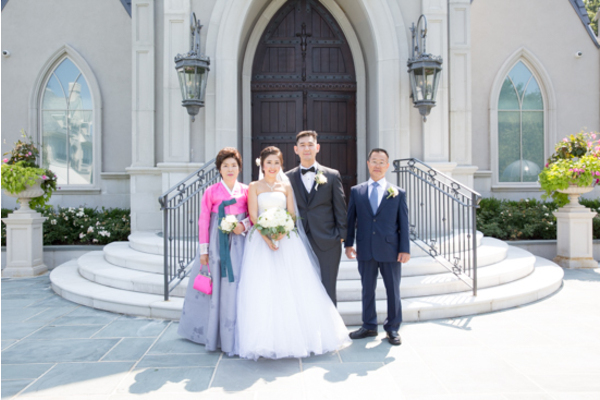 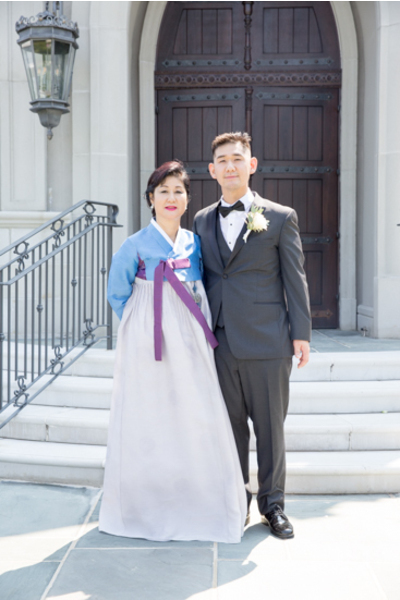 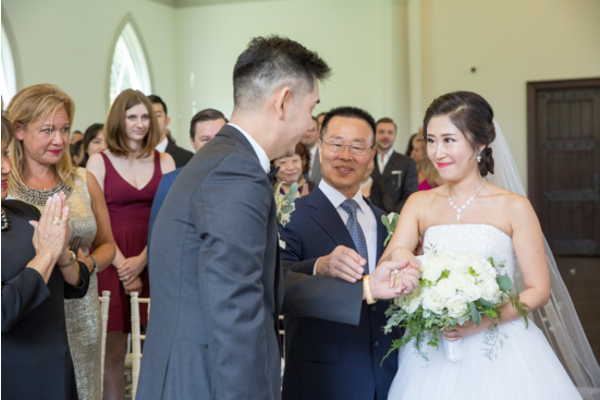 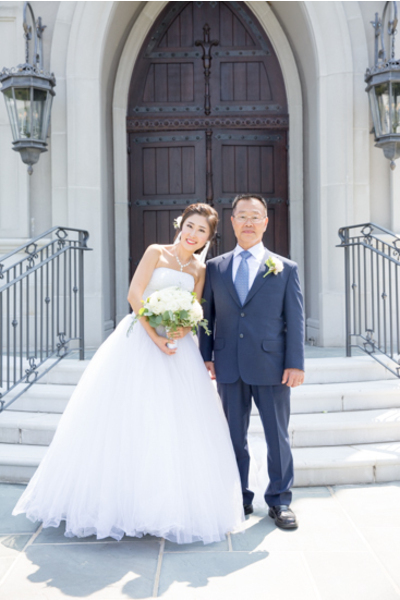 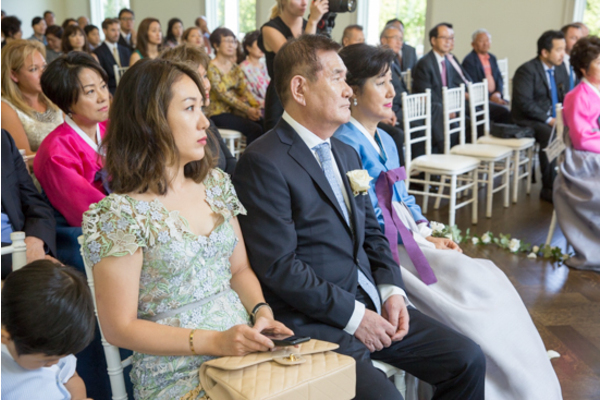 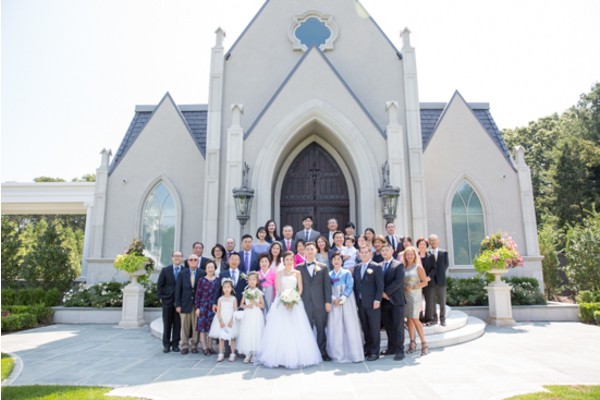 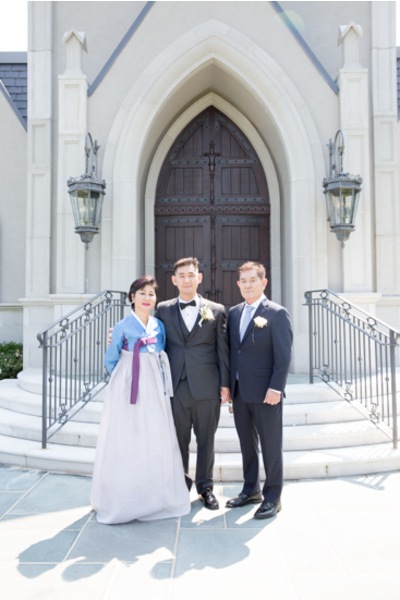 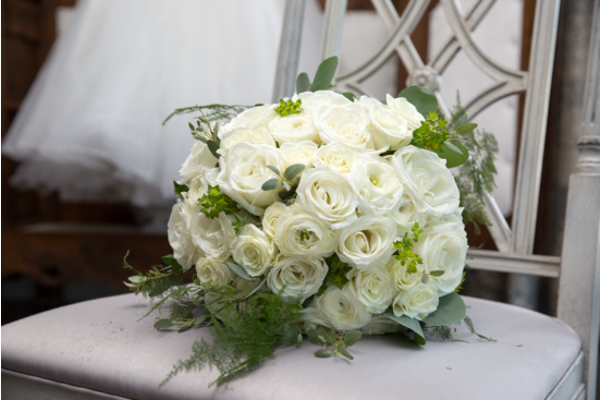 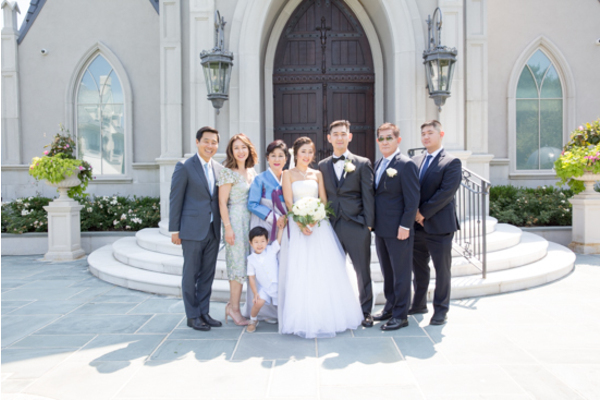 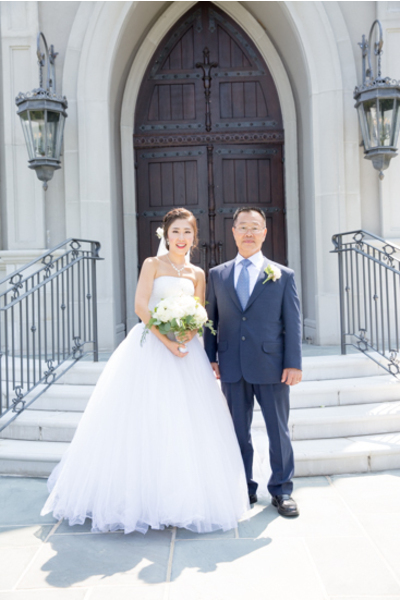 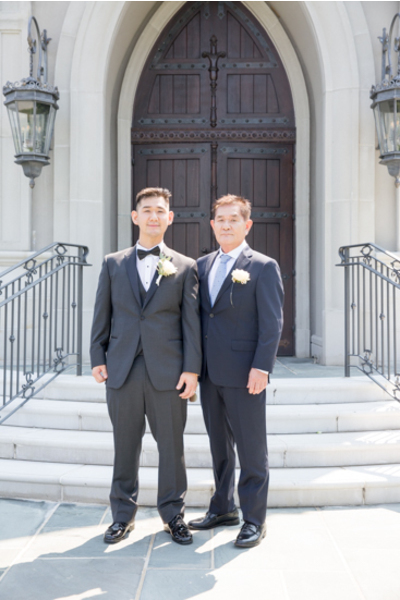 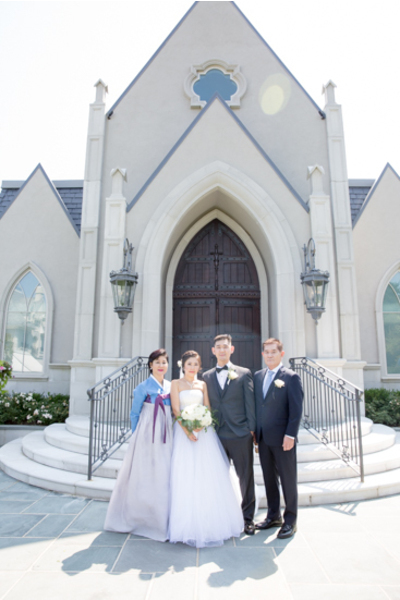 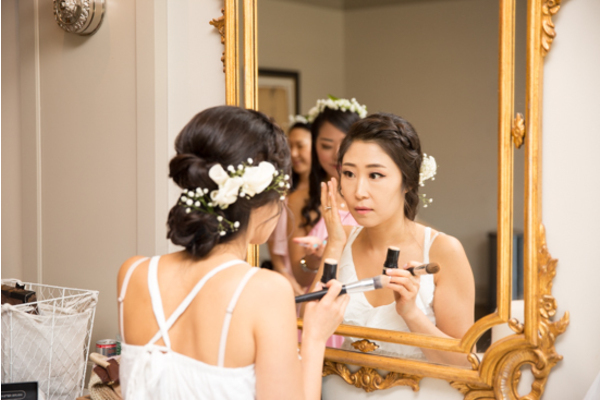 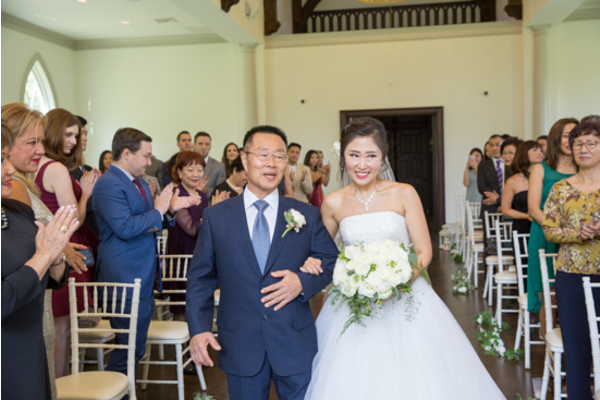 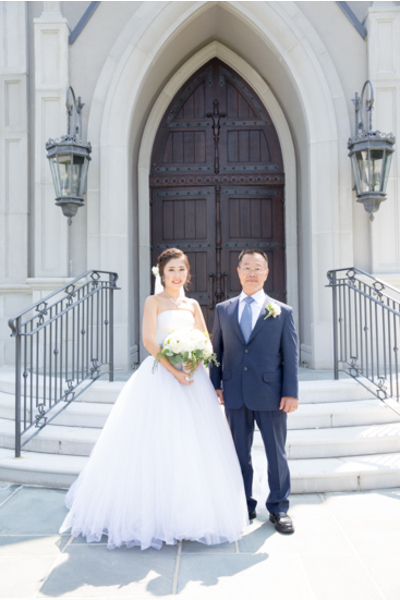 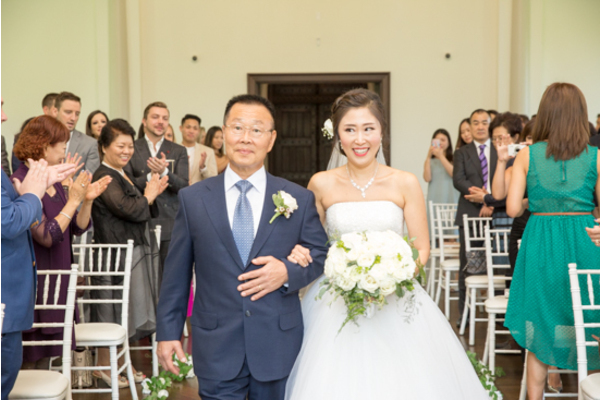 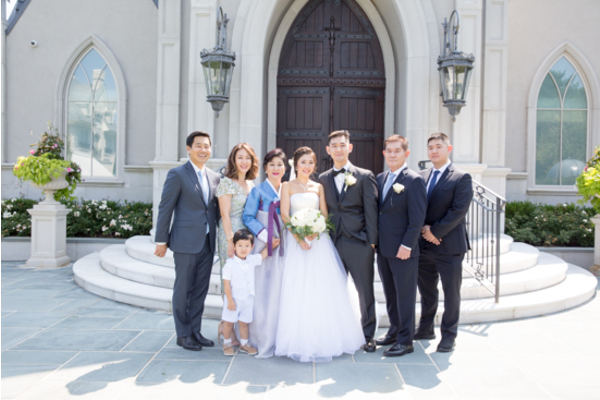 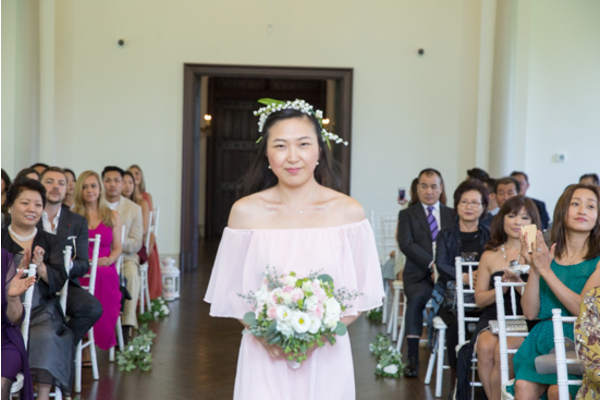 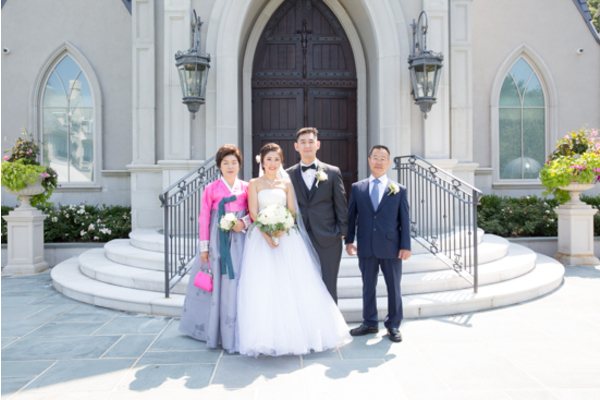 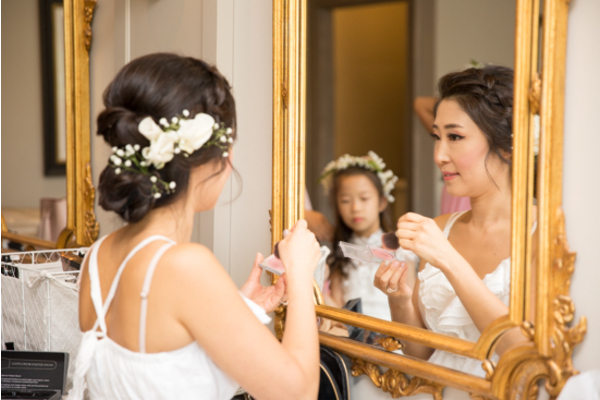 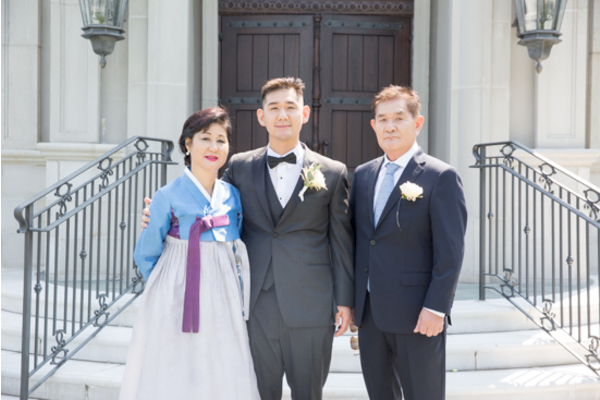 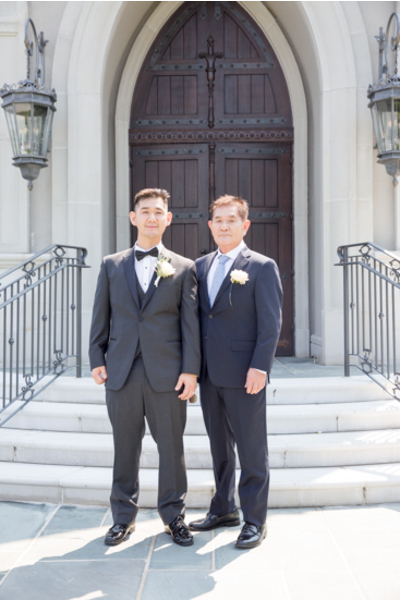 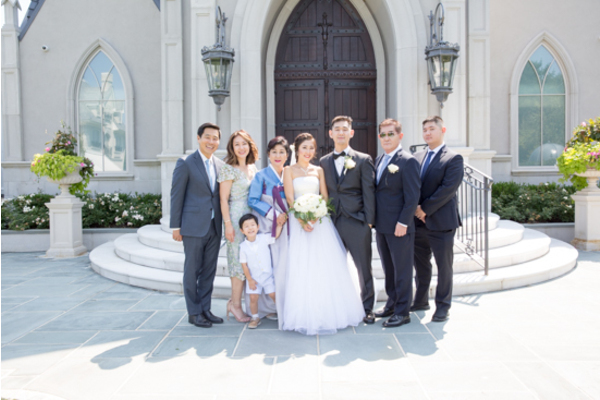 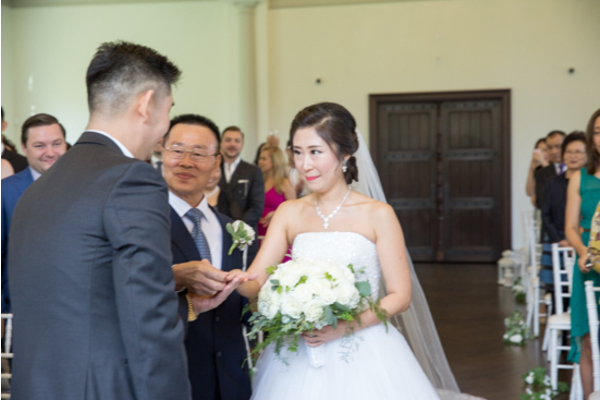 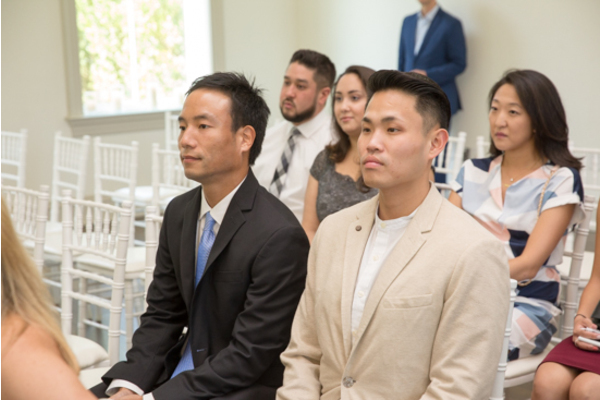 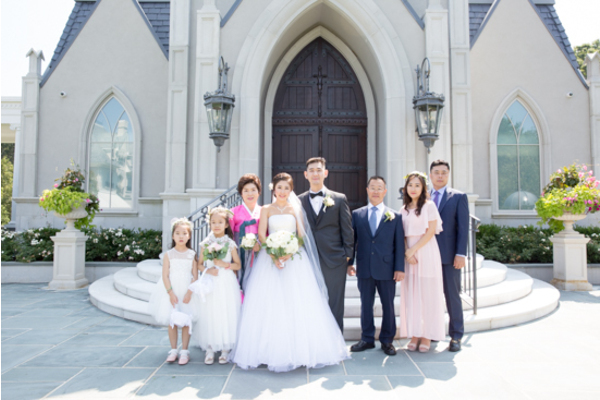 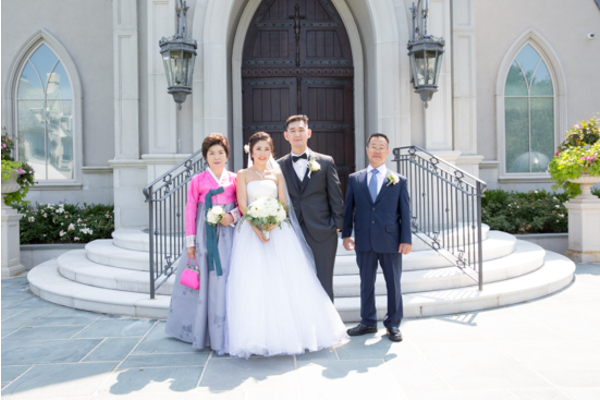 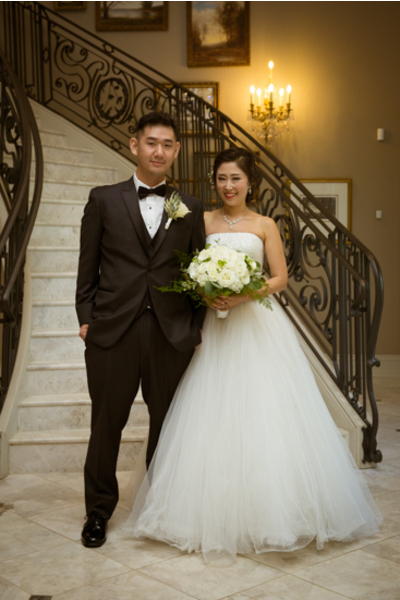 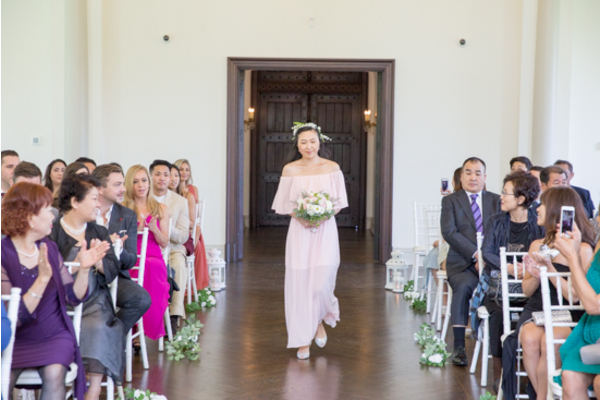 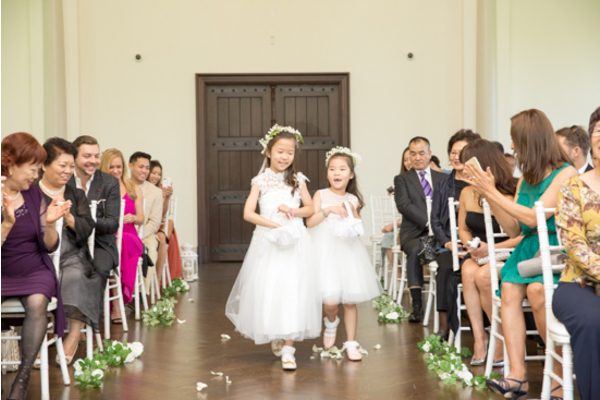 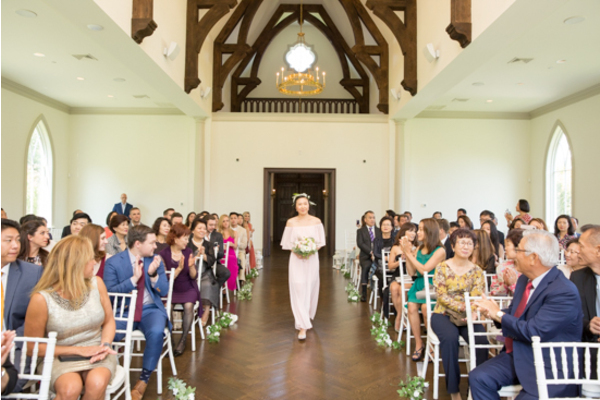 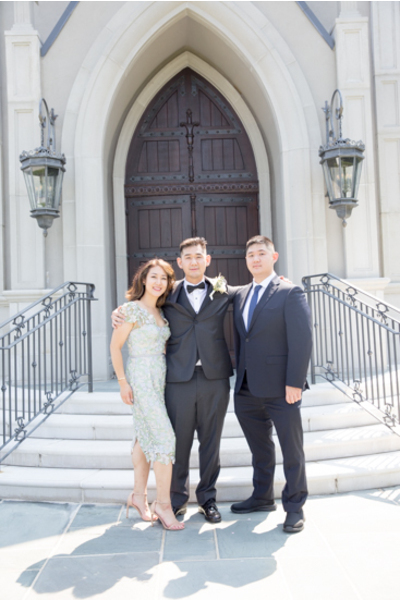 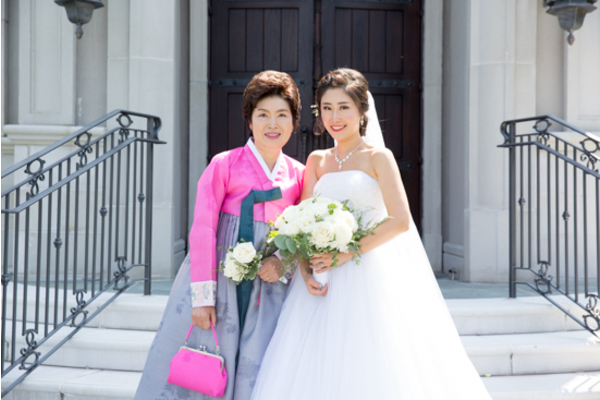 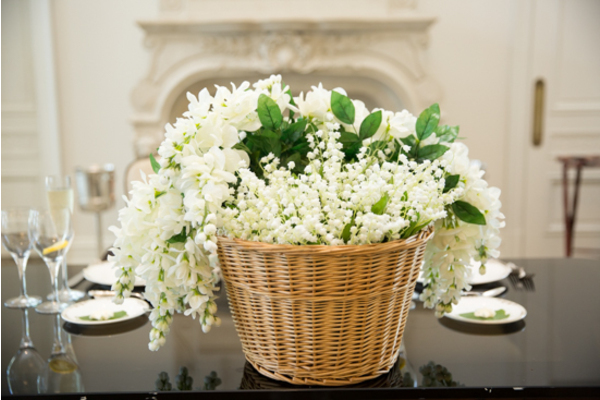 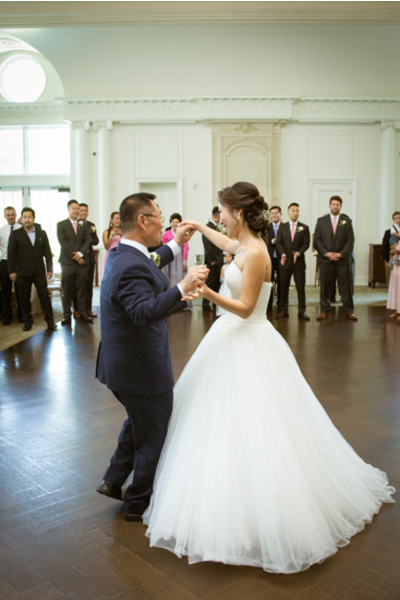 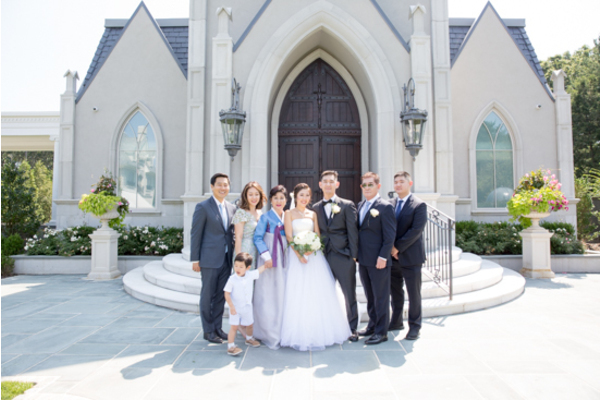 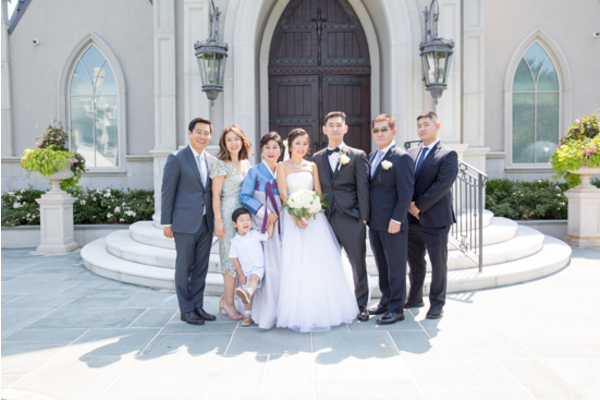 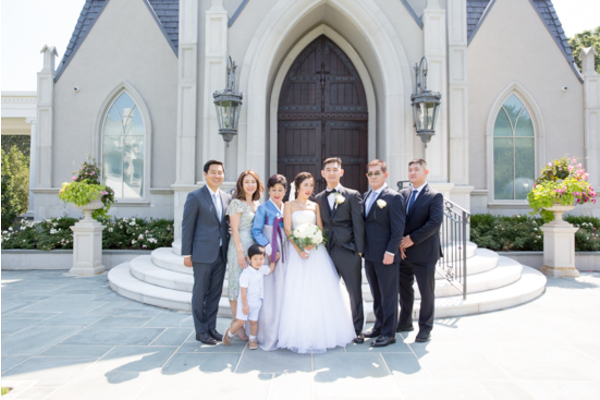 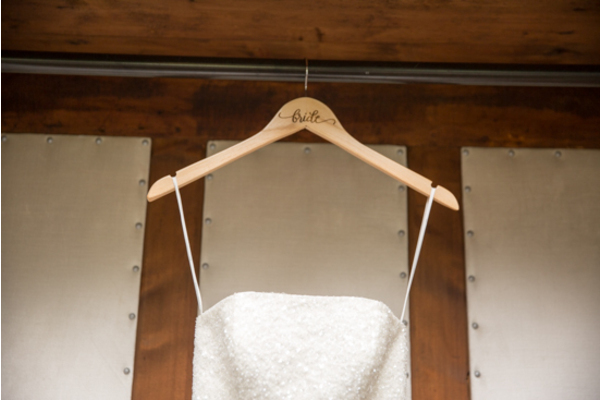 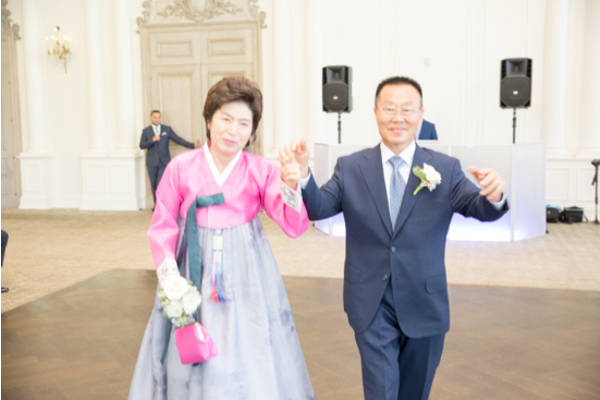 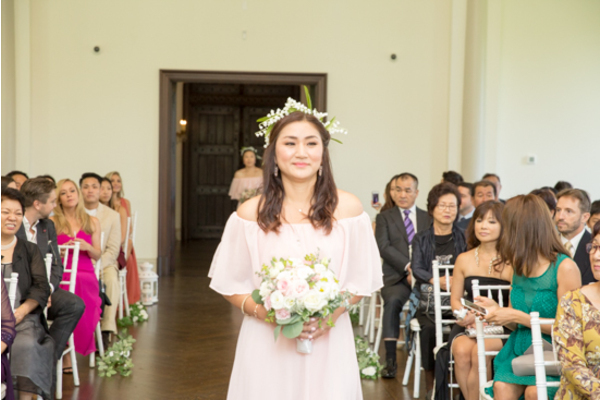 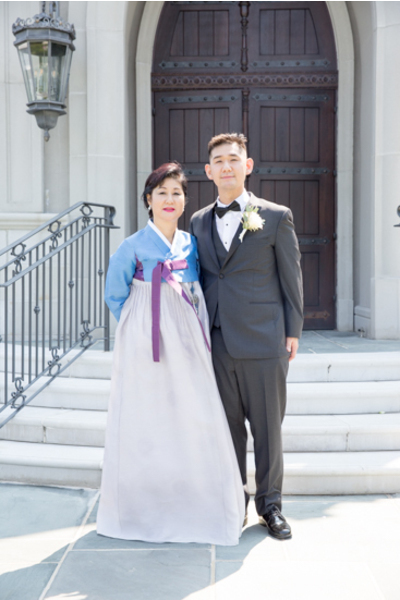 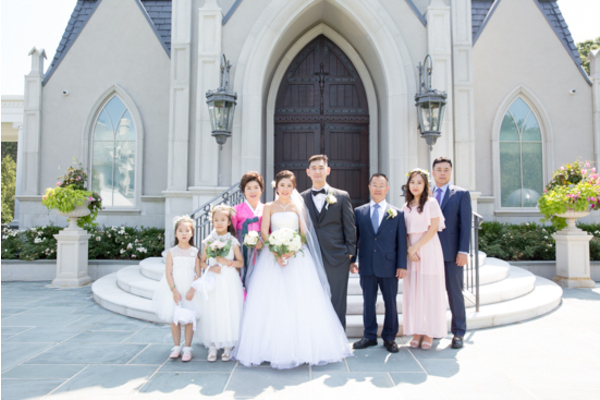 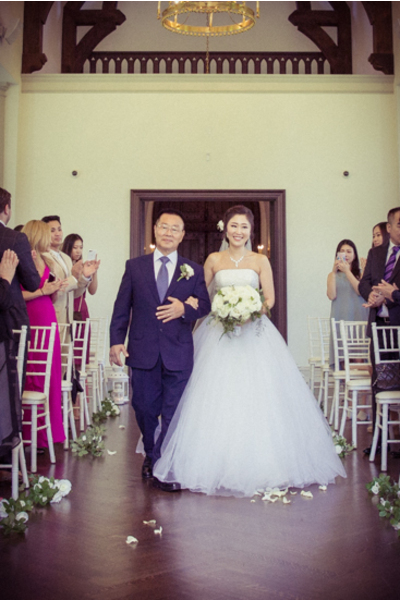 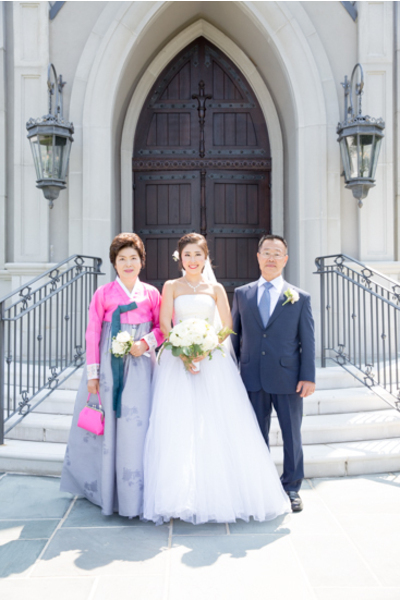 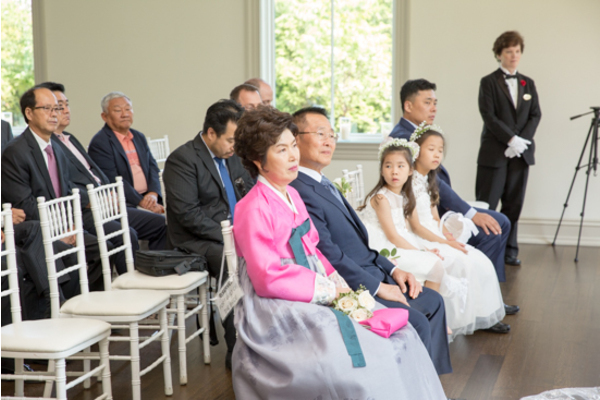 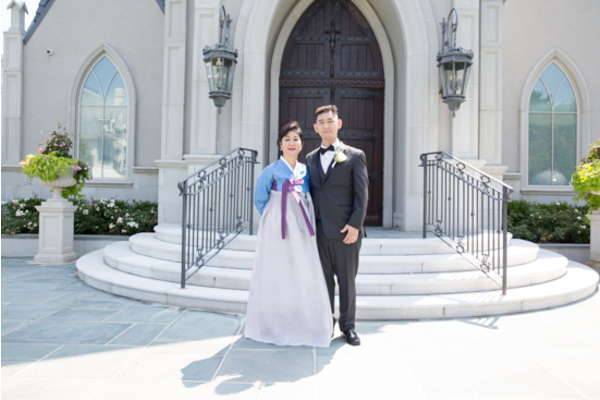 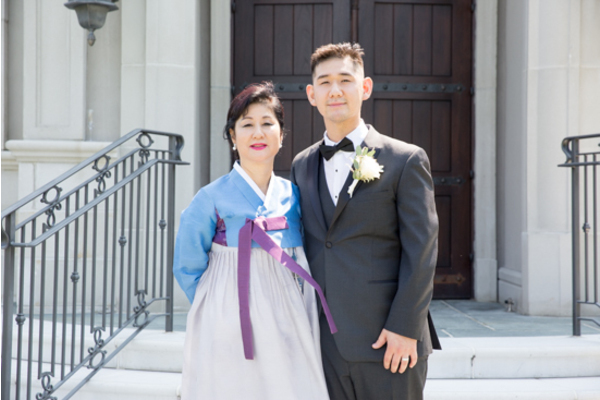 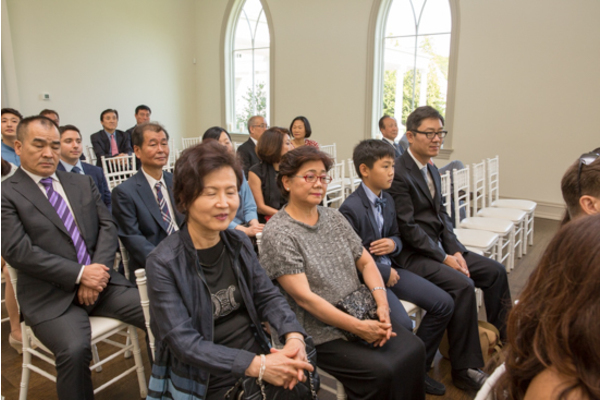 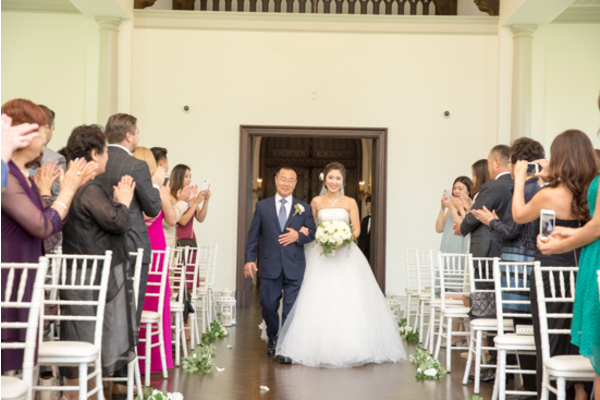 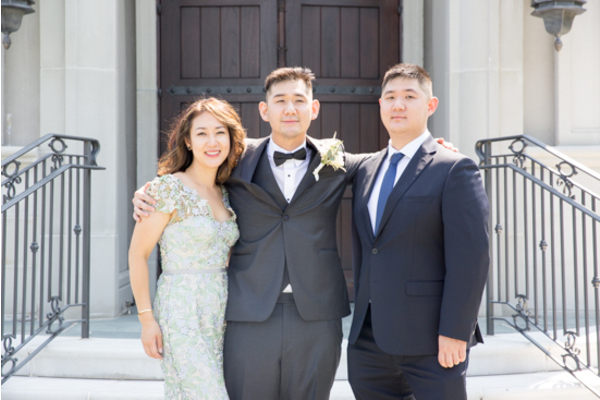 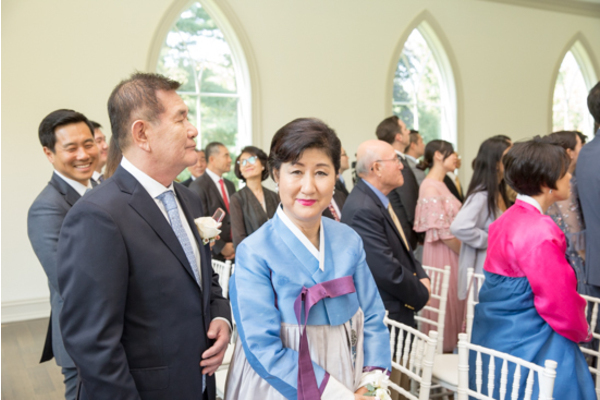 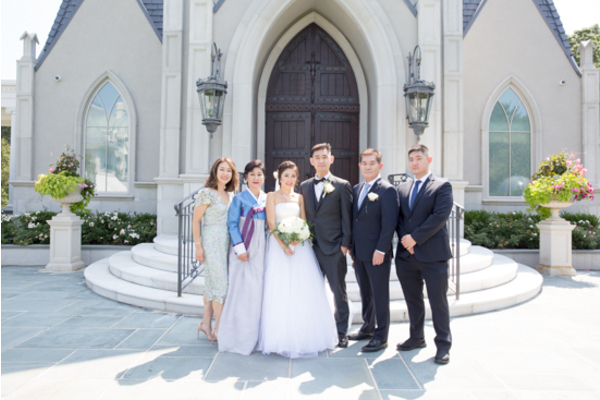 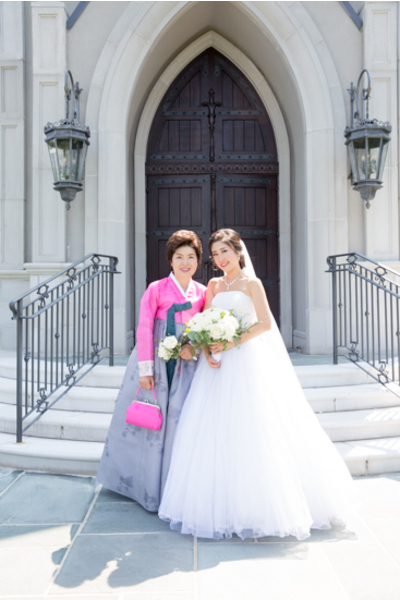 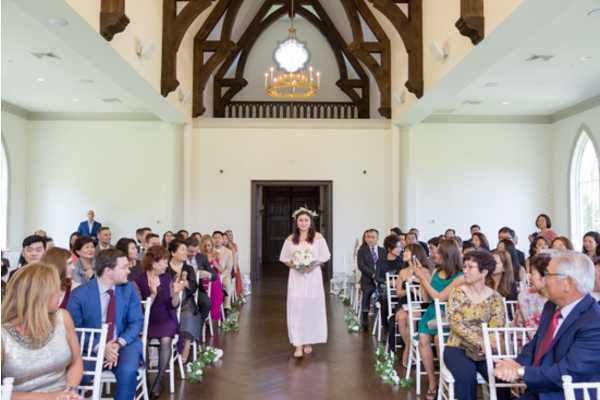 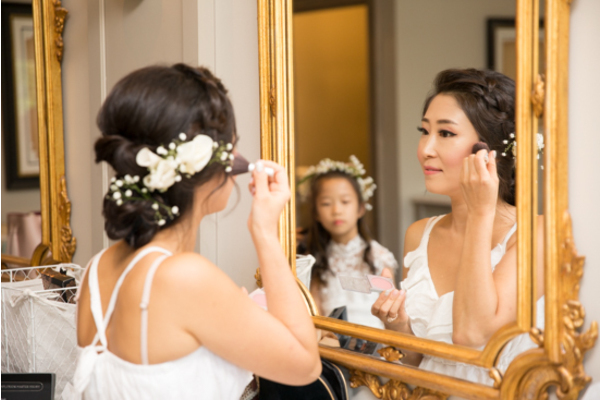 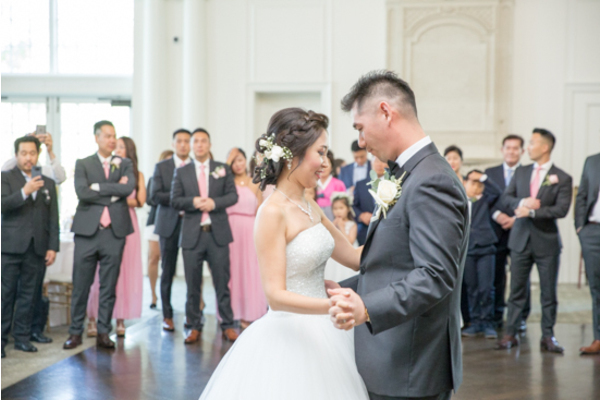 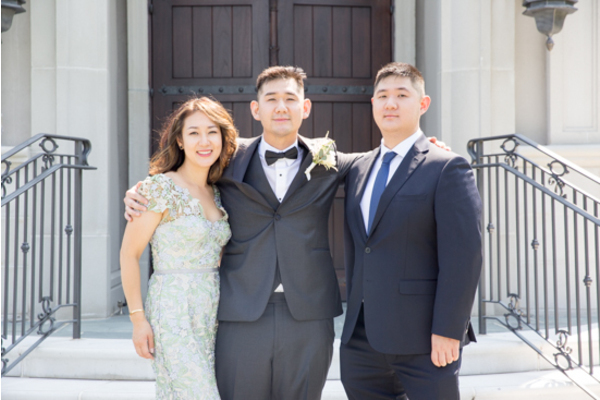 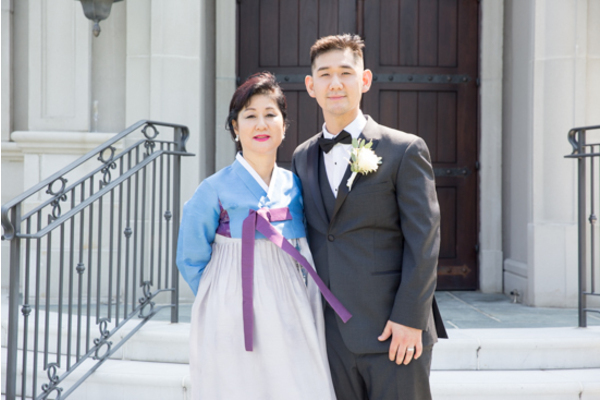 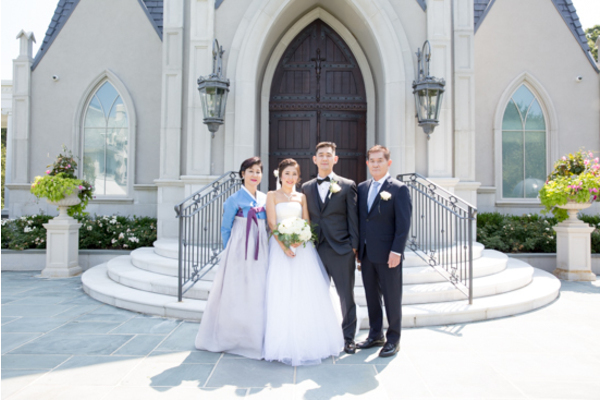 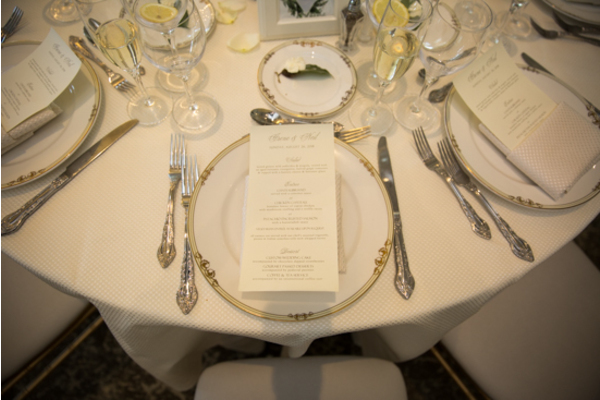 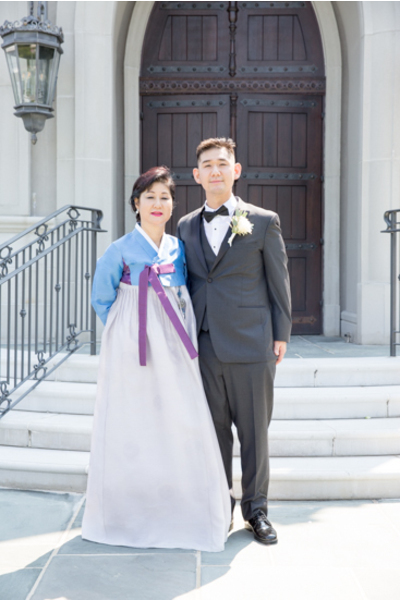 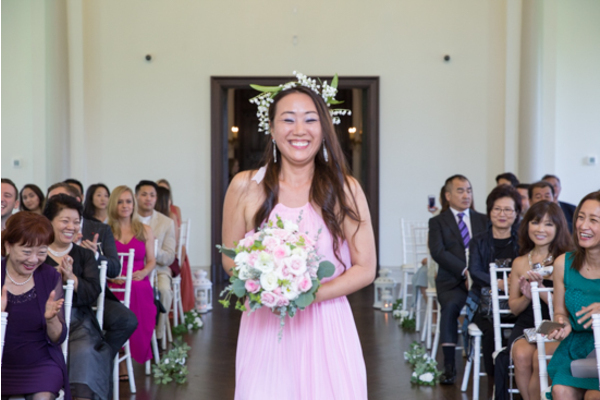 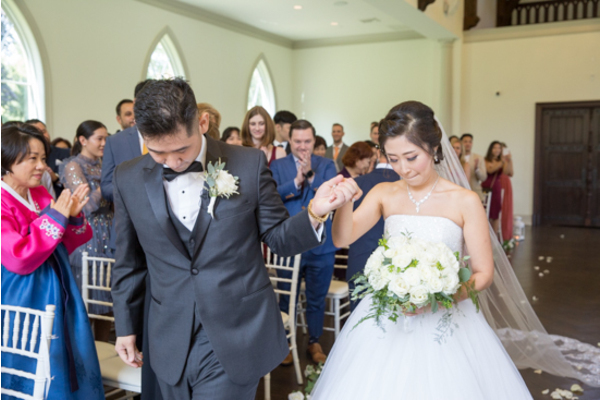 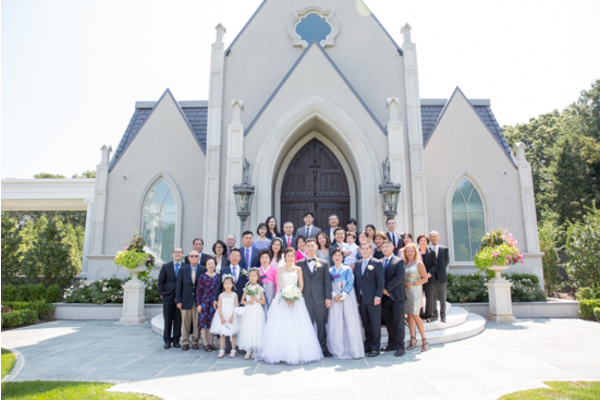 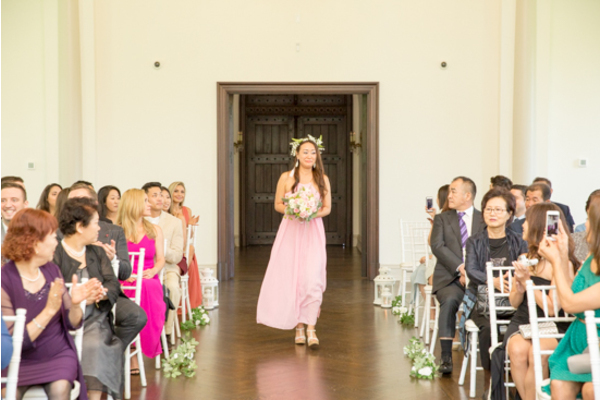 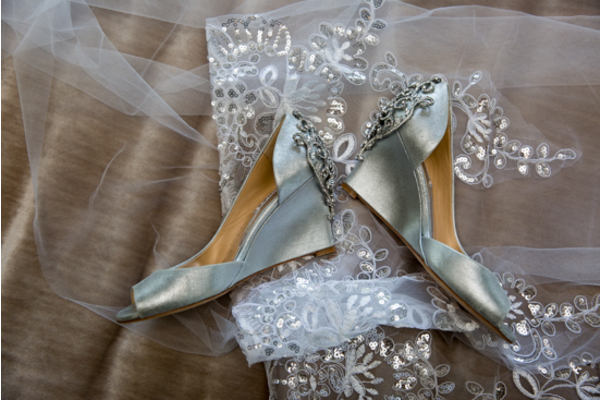 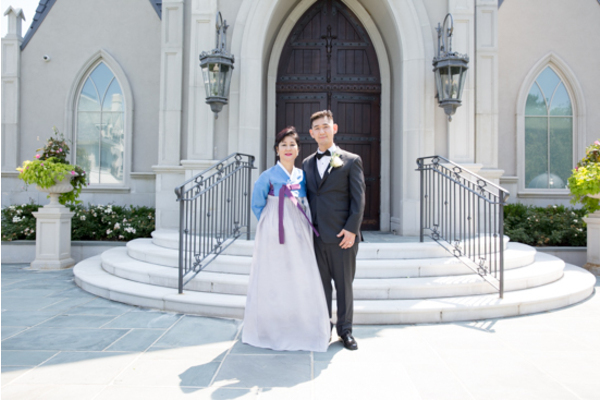 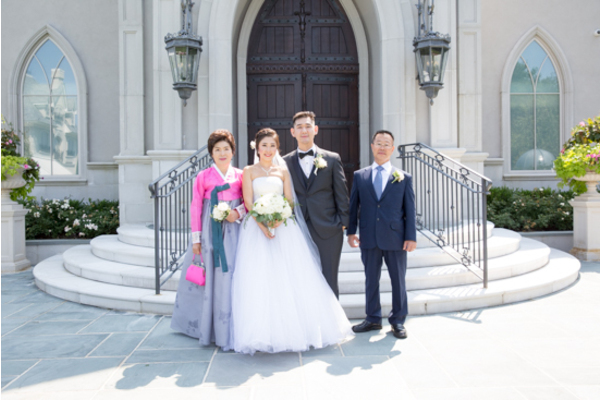 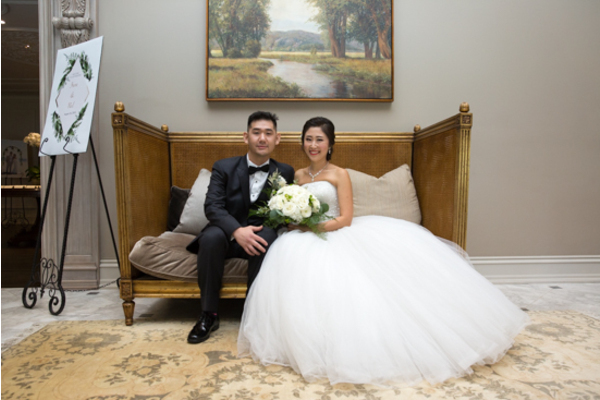 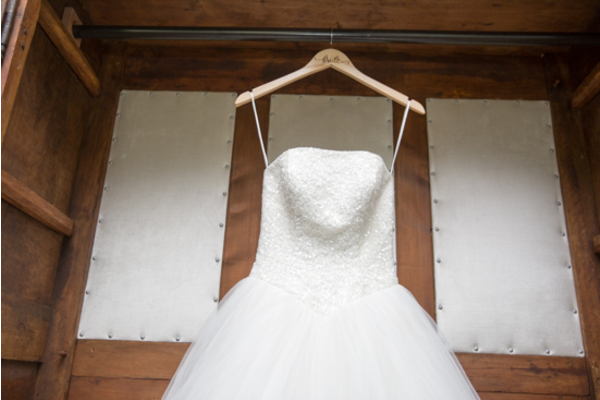 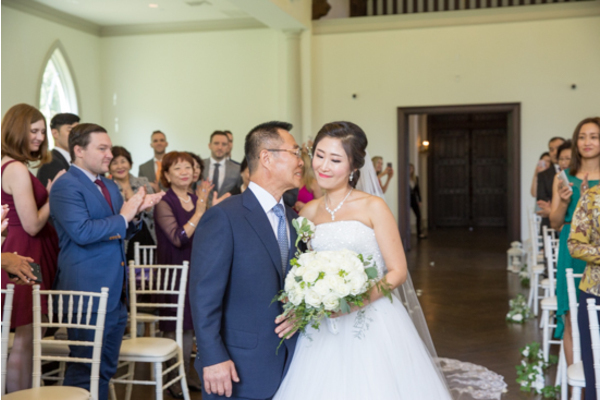 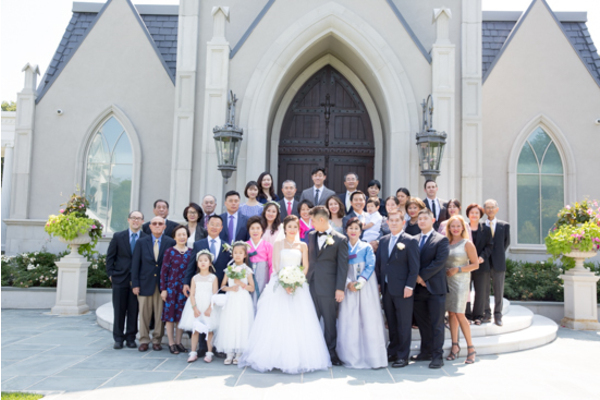 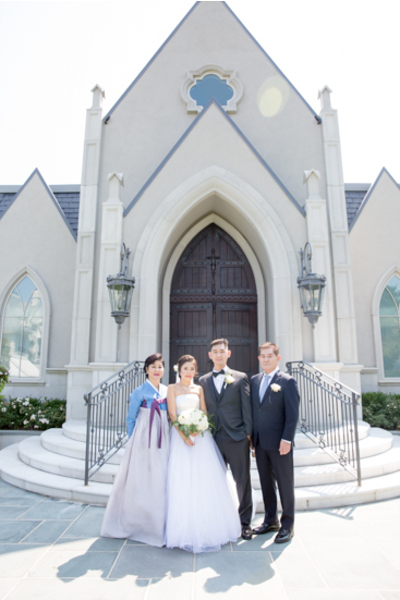 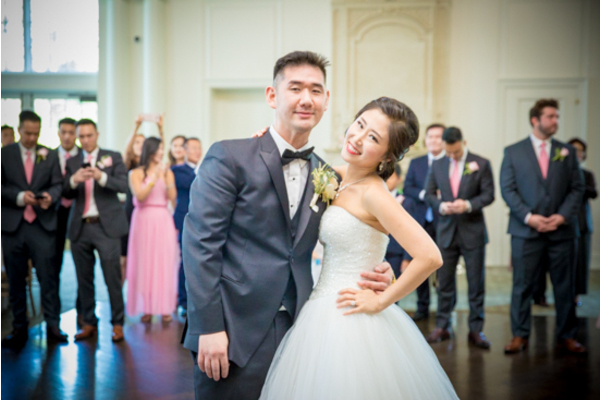 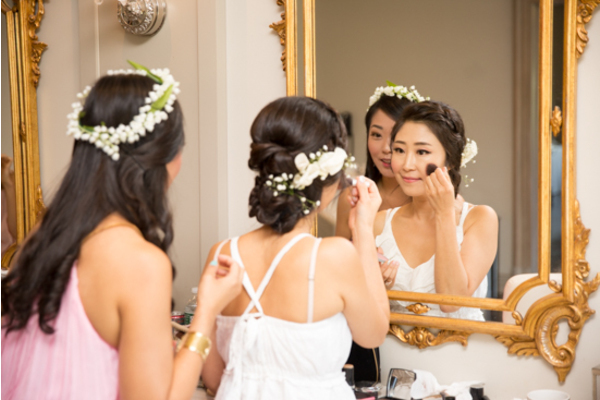 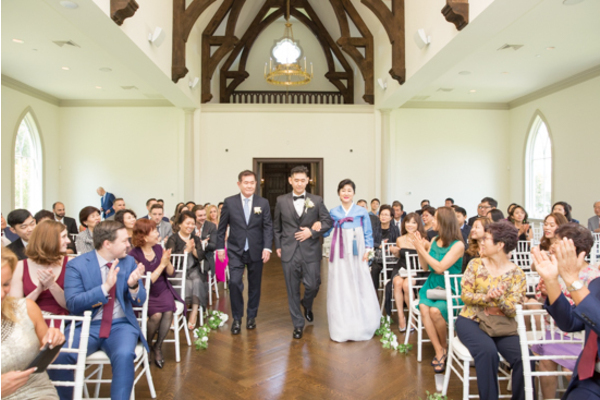 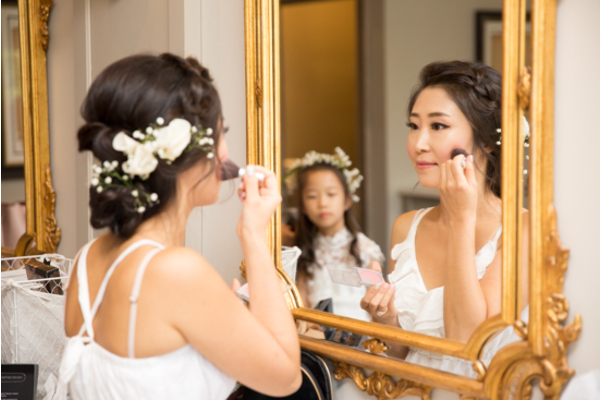 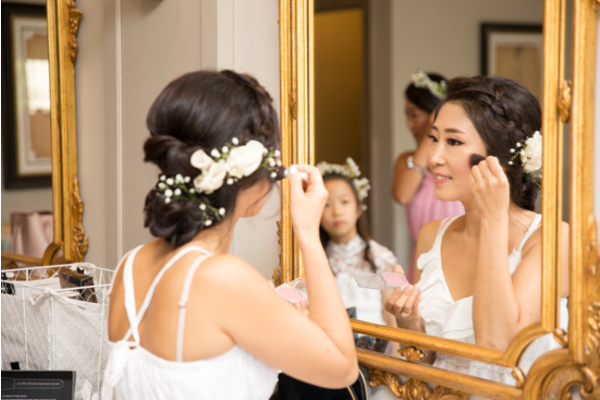 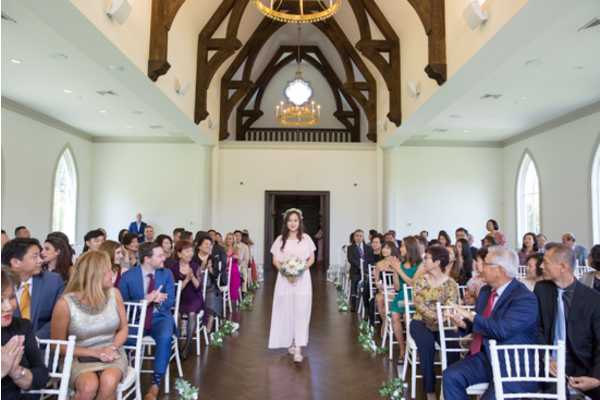 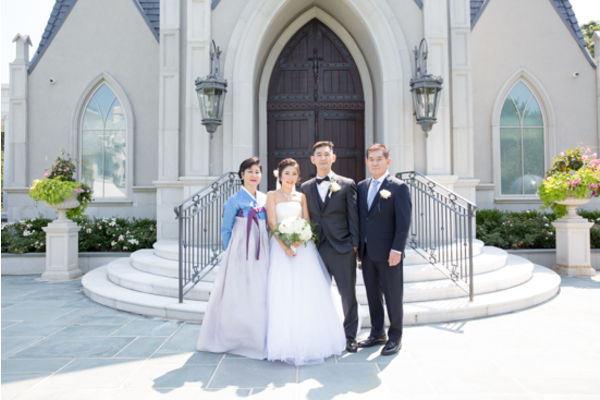 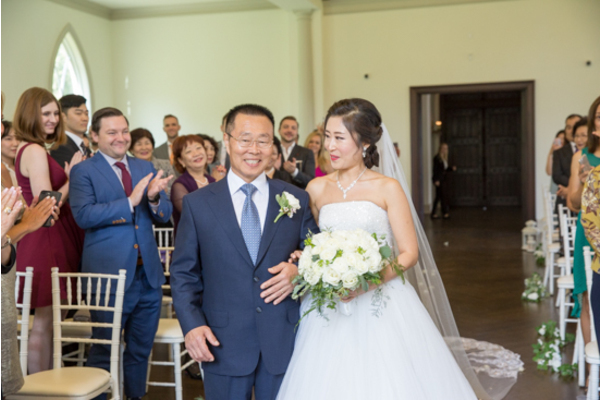 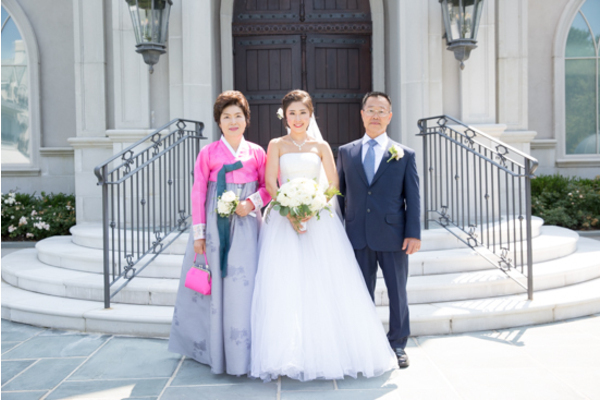 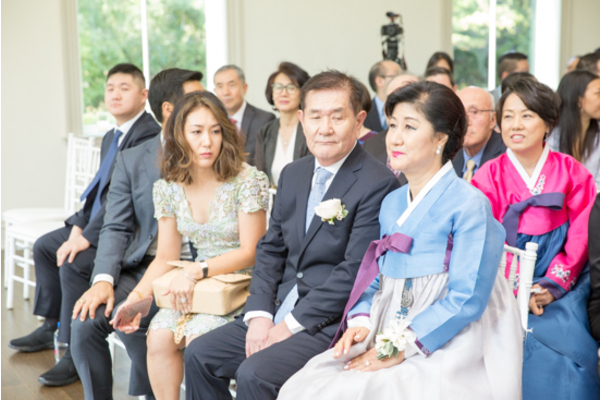 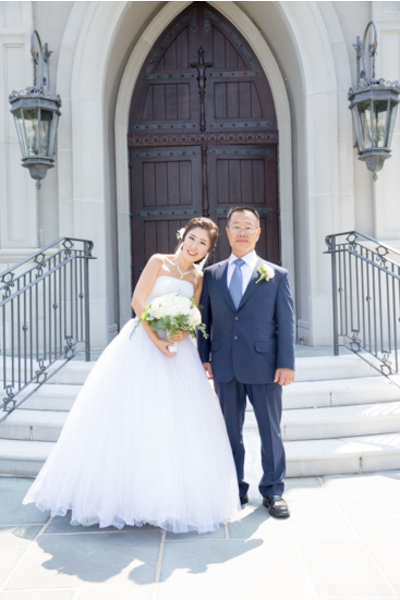 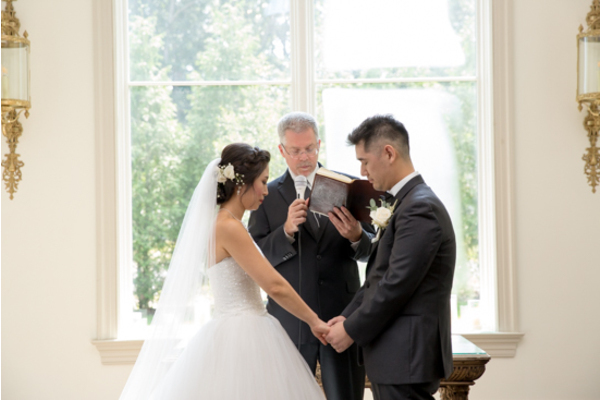 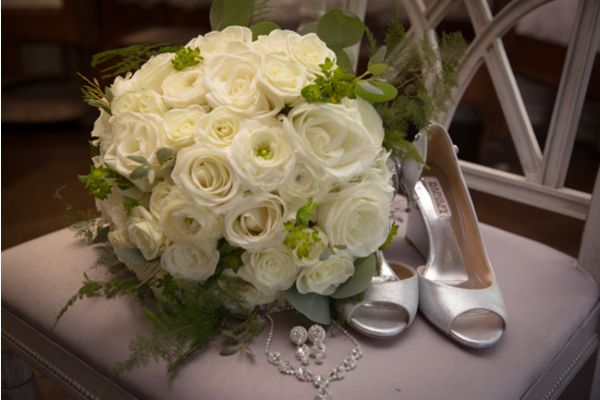 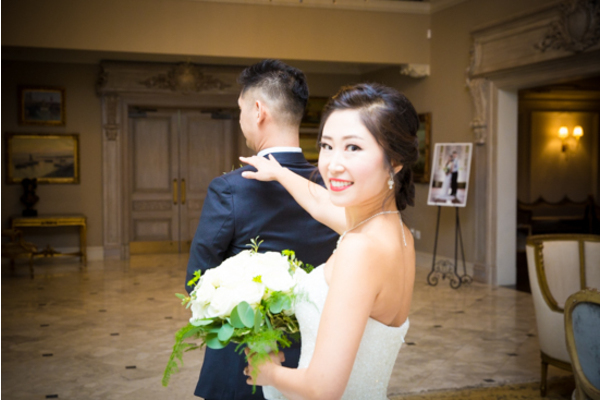 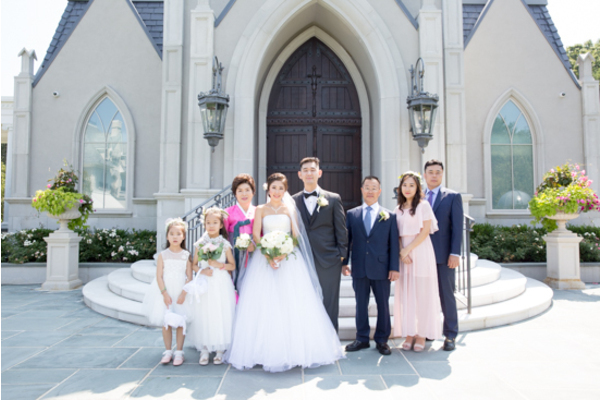 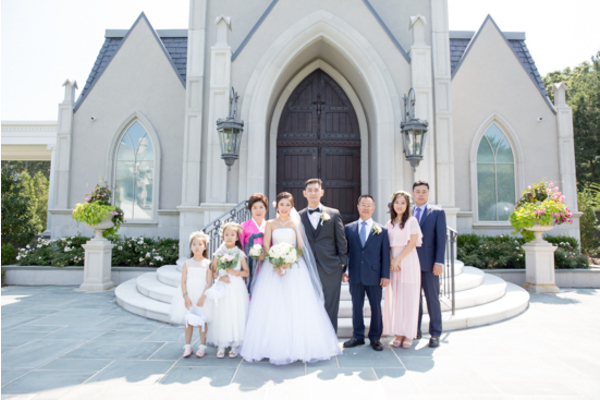 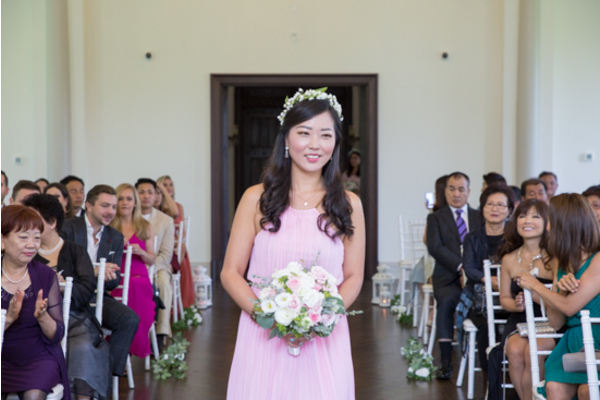 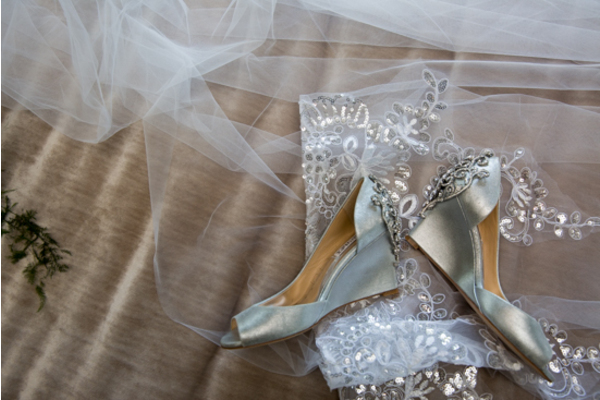 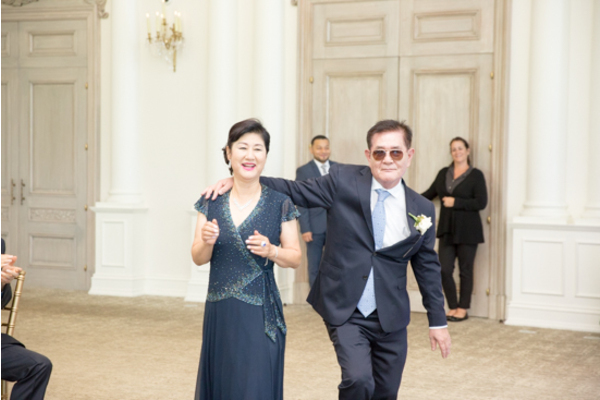 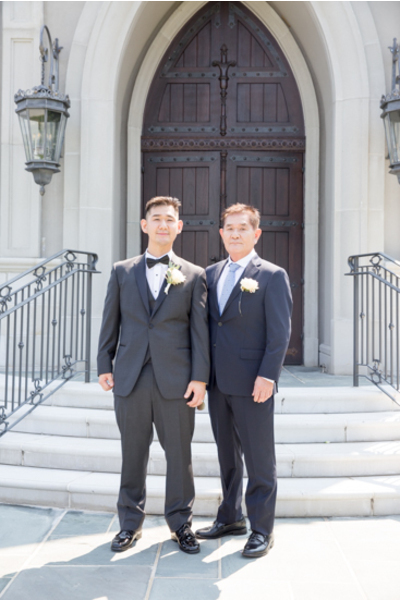 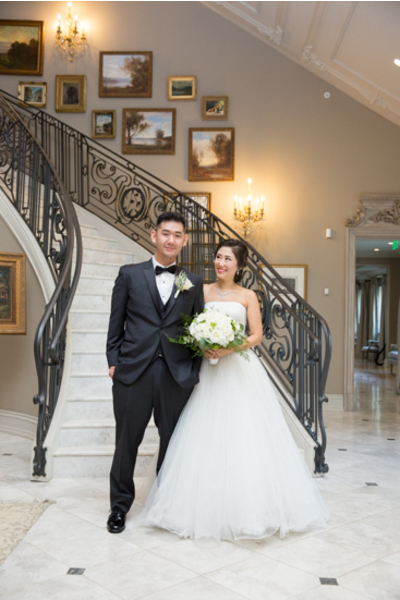 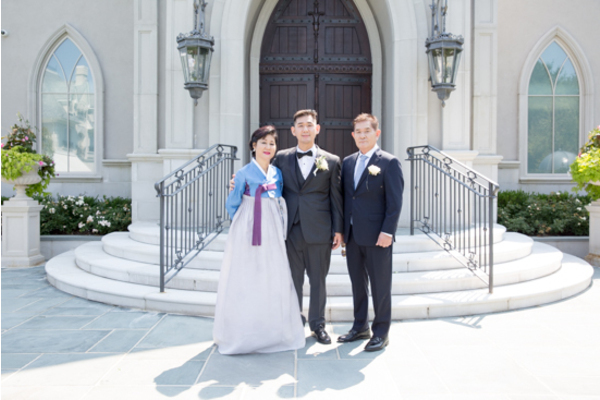 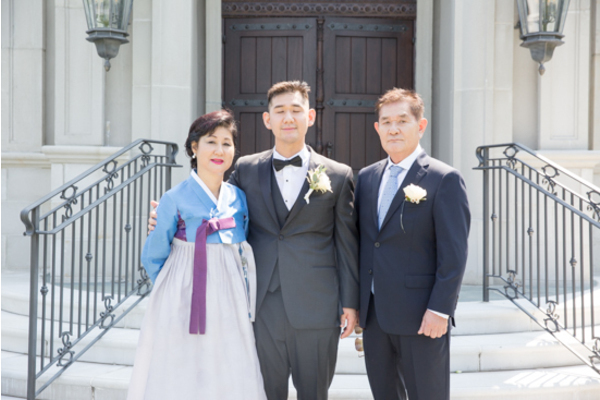 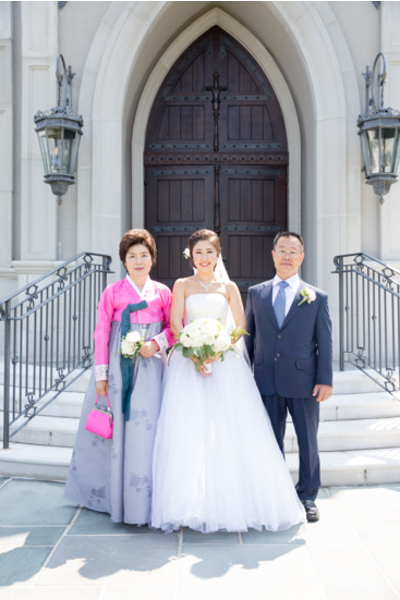 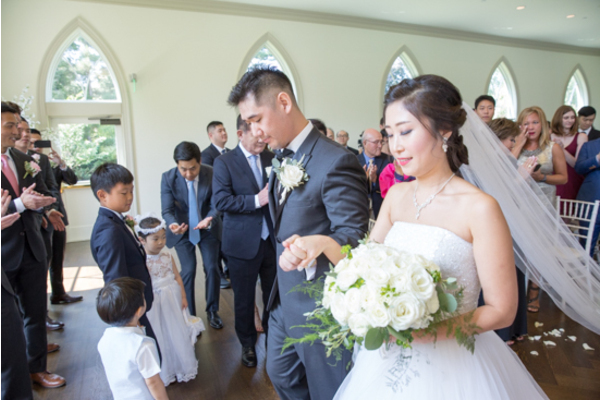 The bride’s parents were also captivated by the look of Irene dressed in her wedding whites! 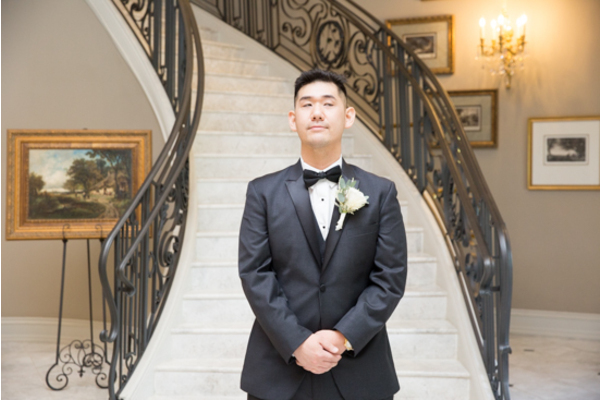 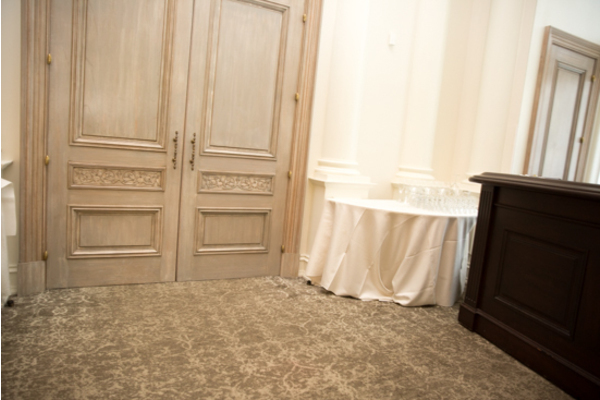 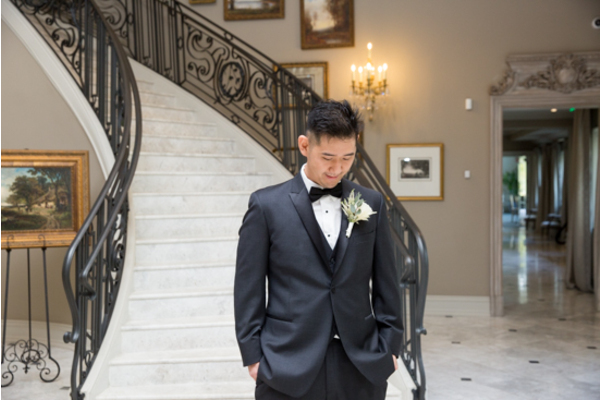 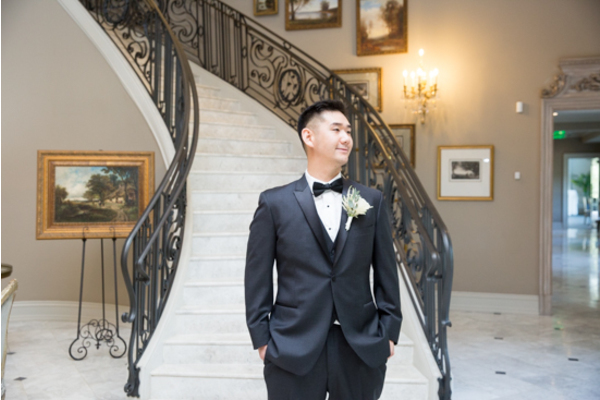 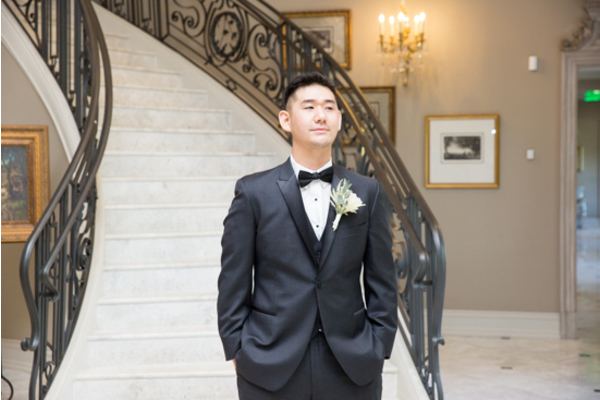 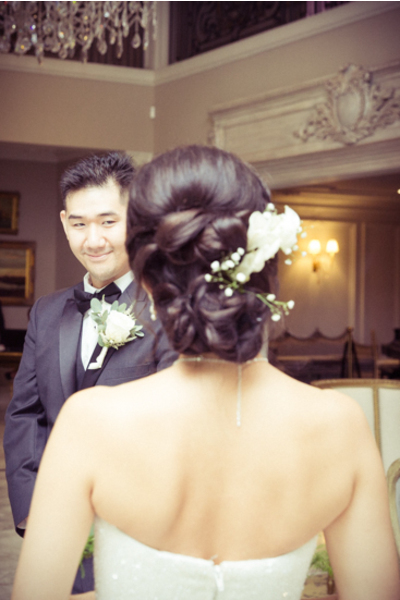 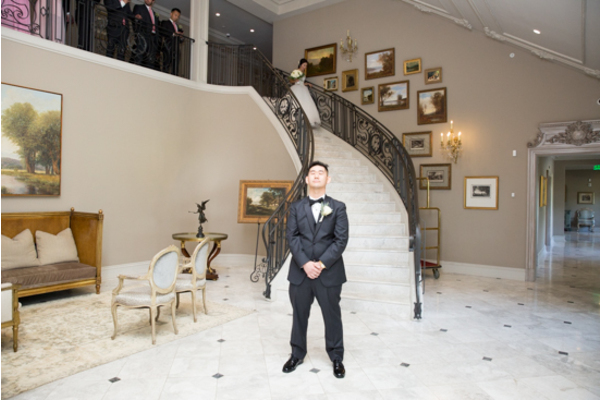 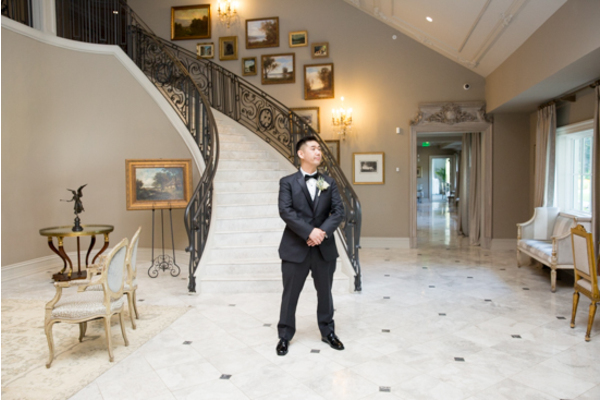 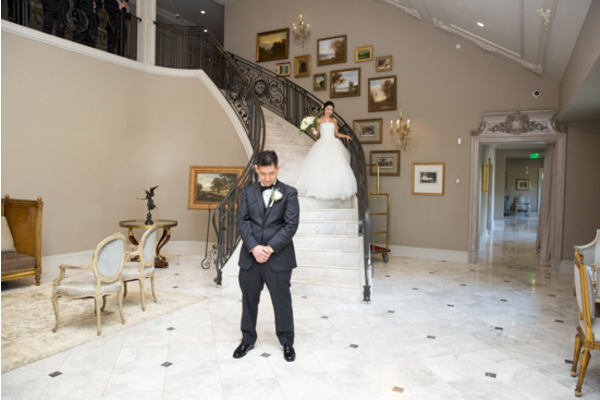 Before the ceremony, Neil took his first look at Irene at the bottom of the grand staircase. 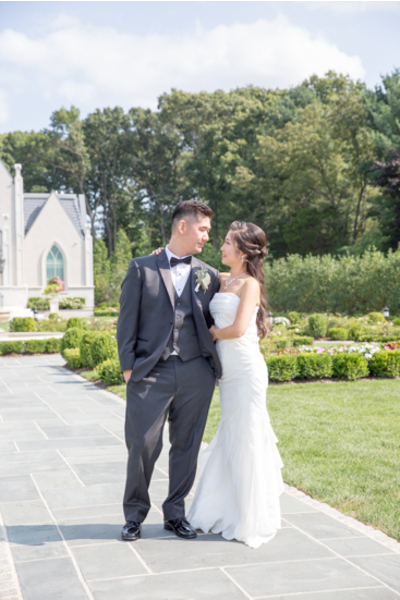 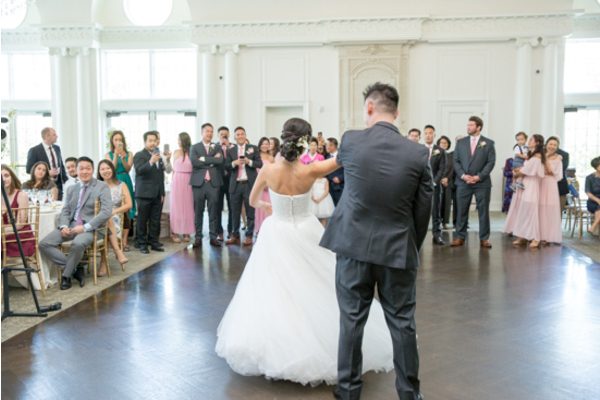 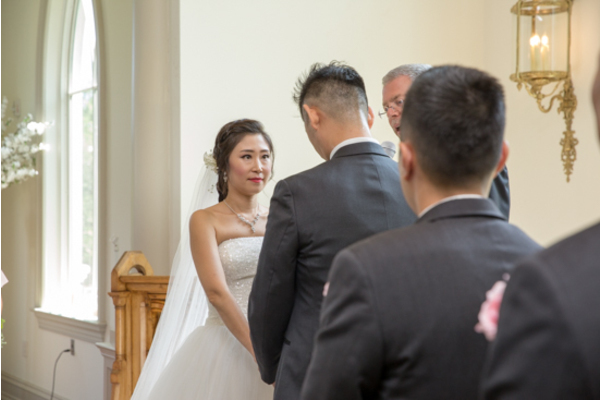 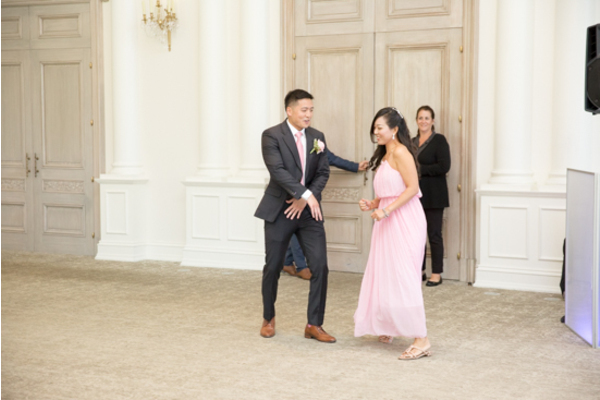 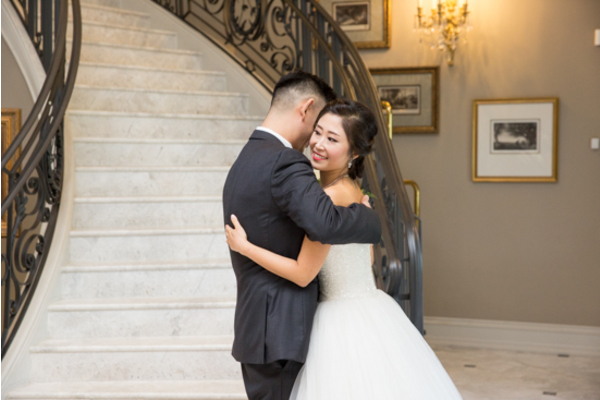 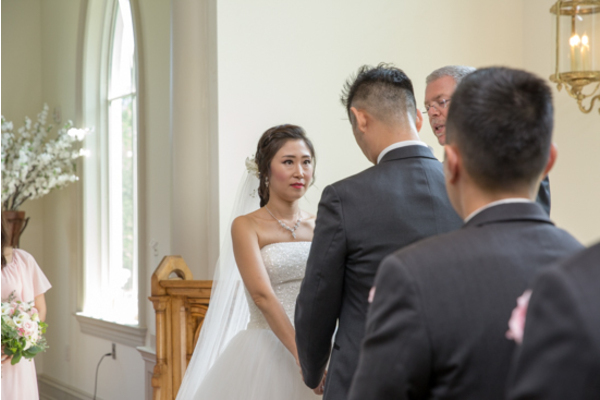 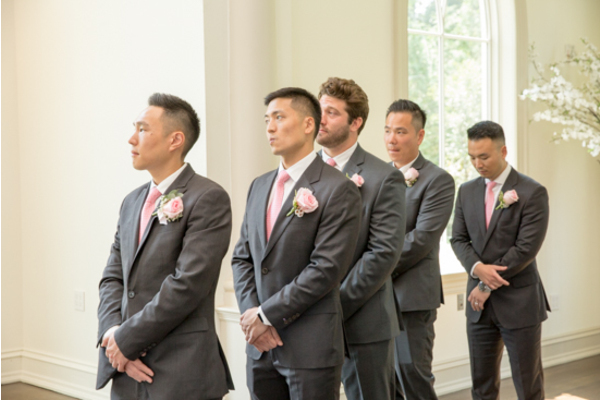 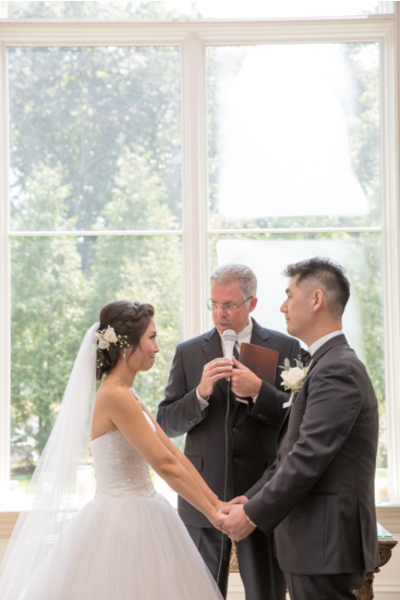 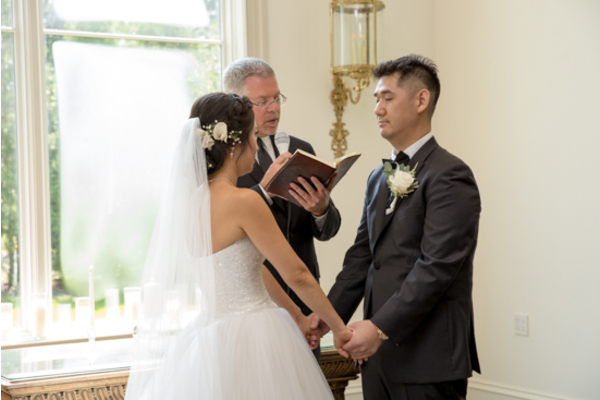 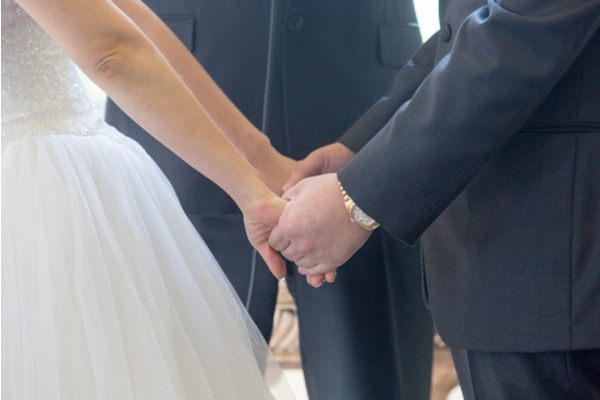 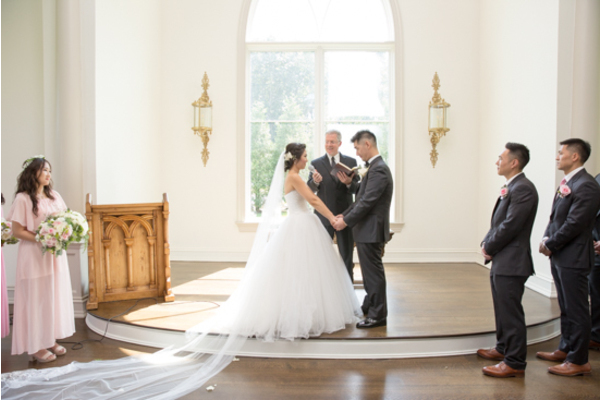 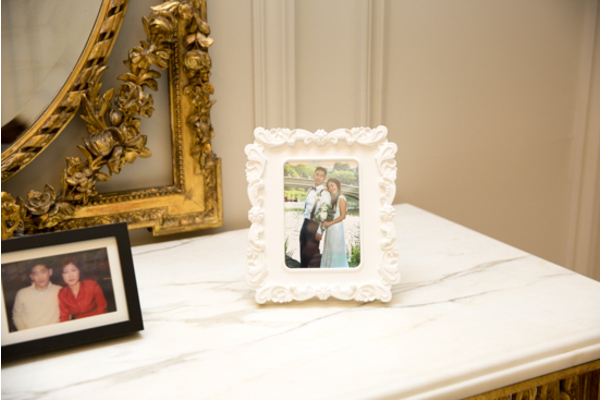 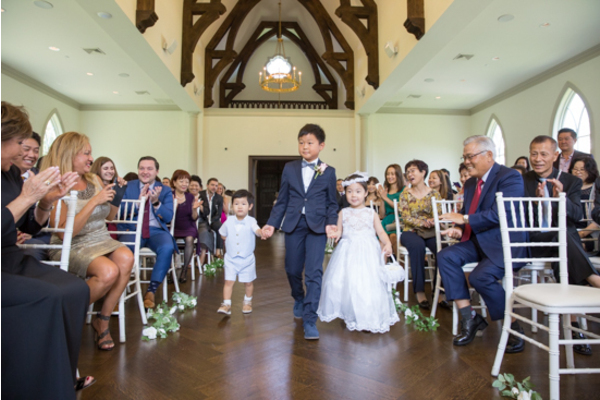 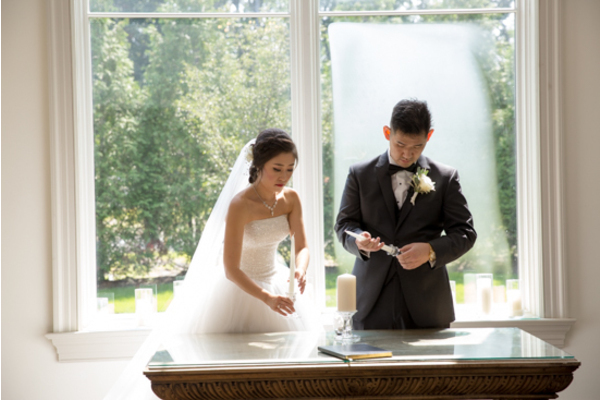 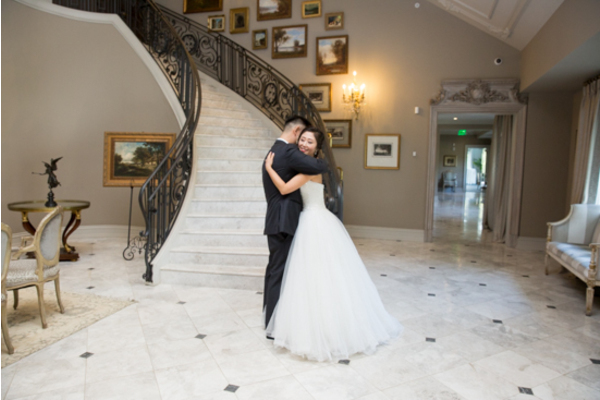 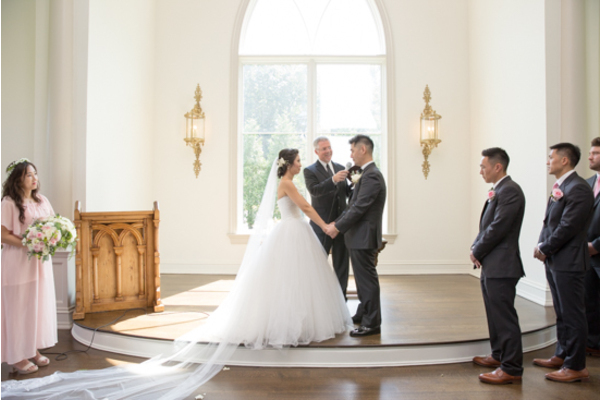 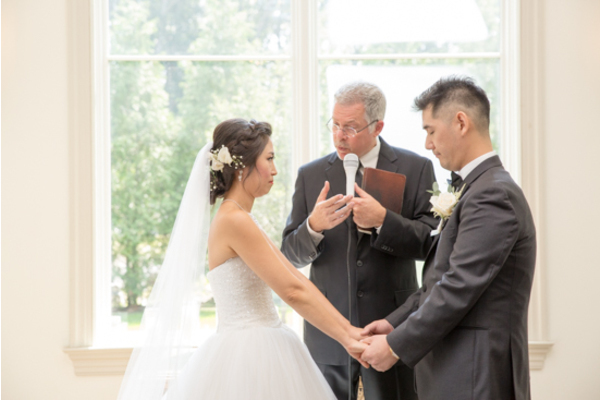 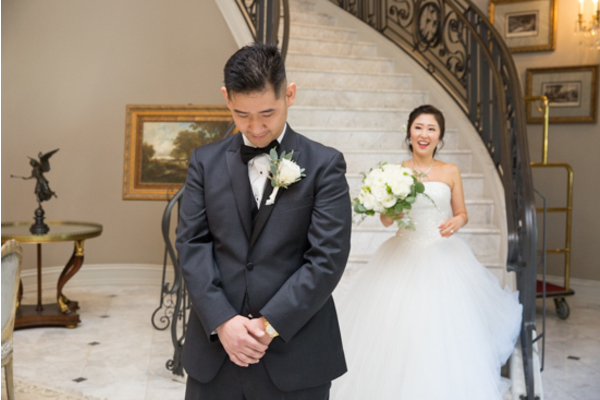 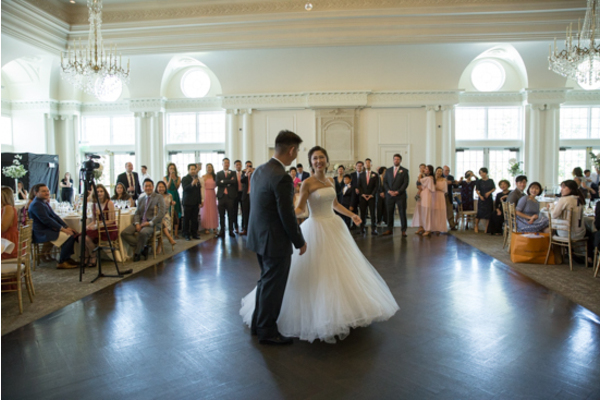 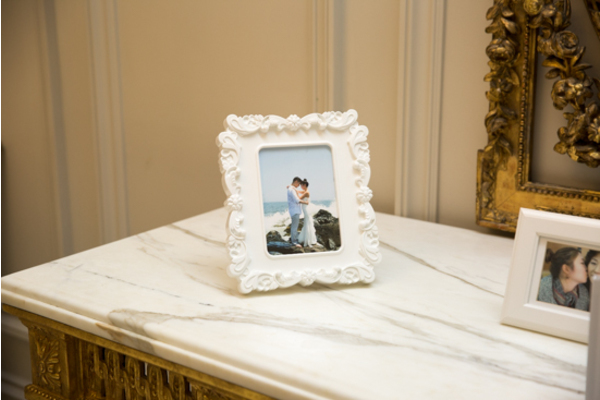 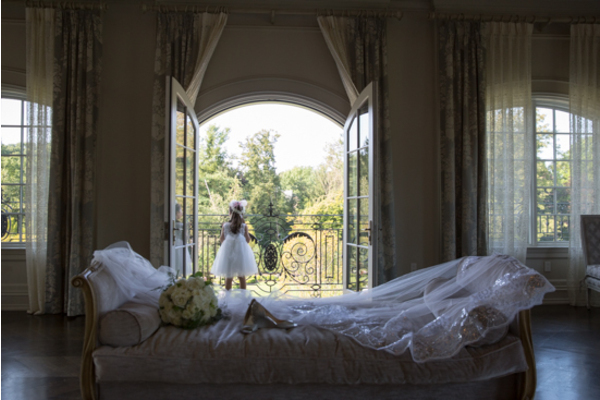 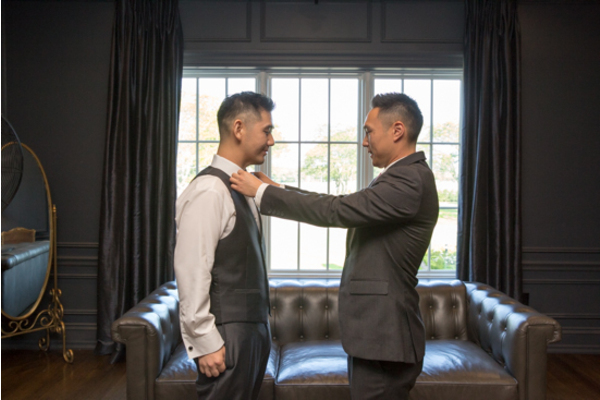 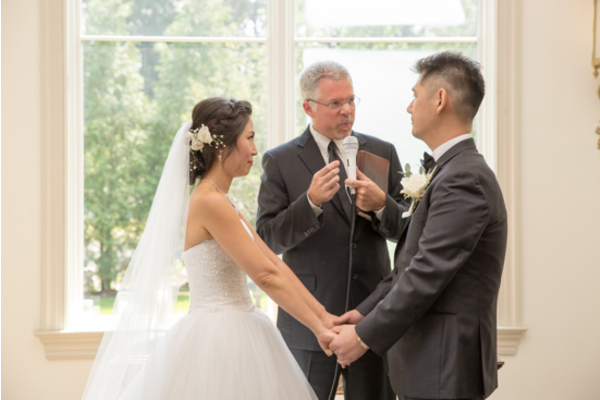 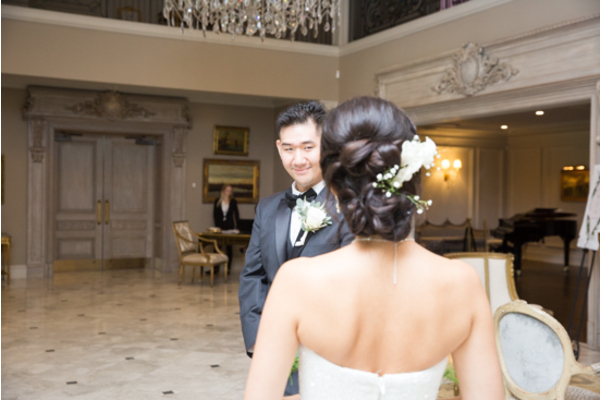 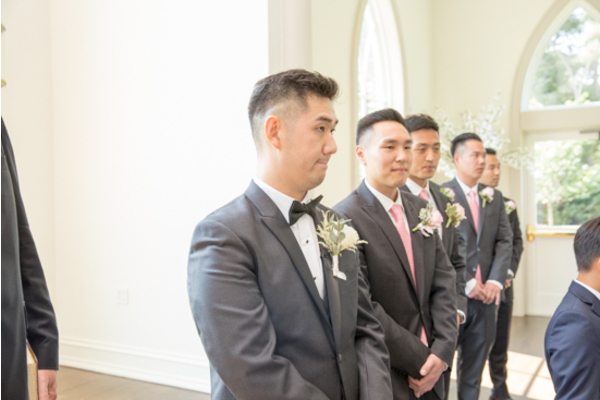 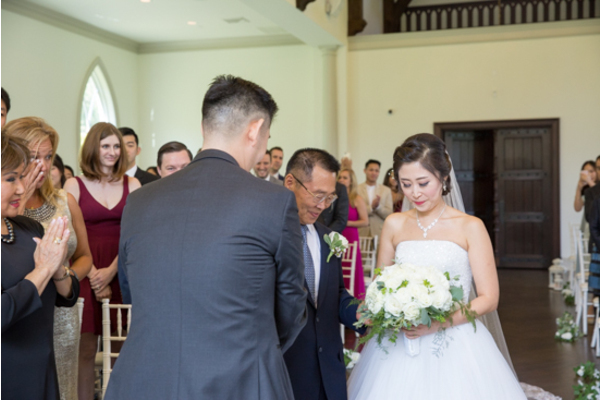 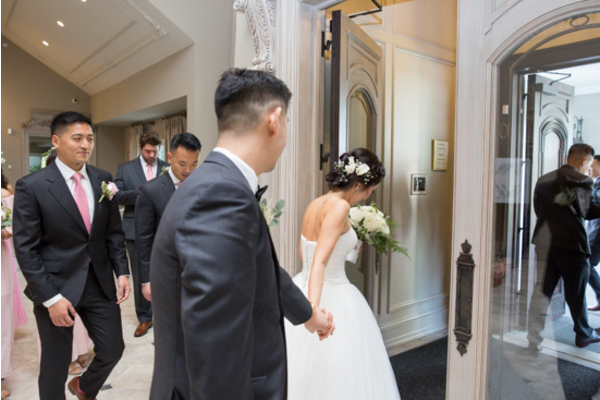 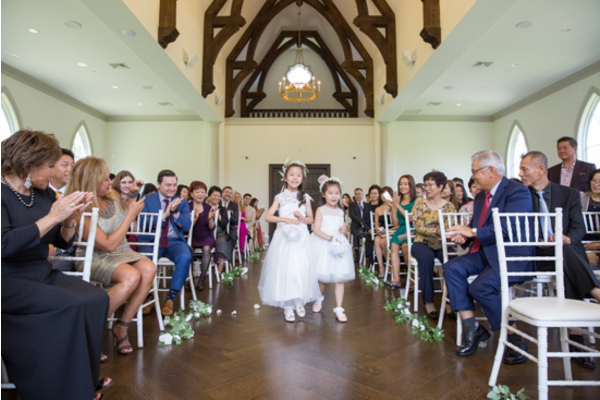 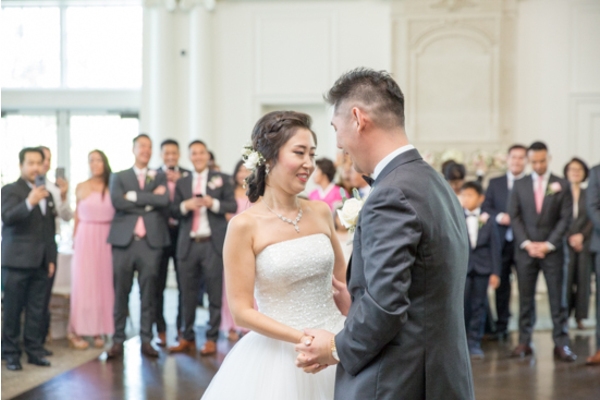 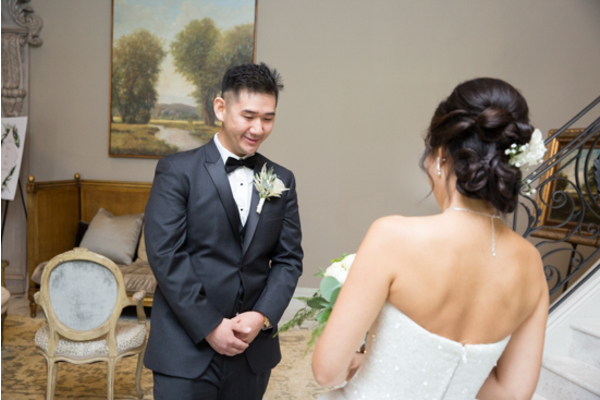 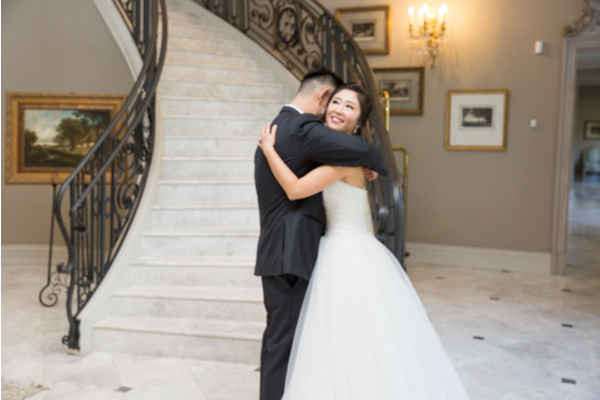 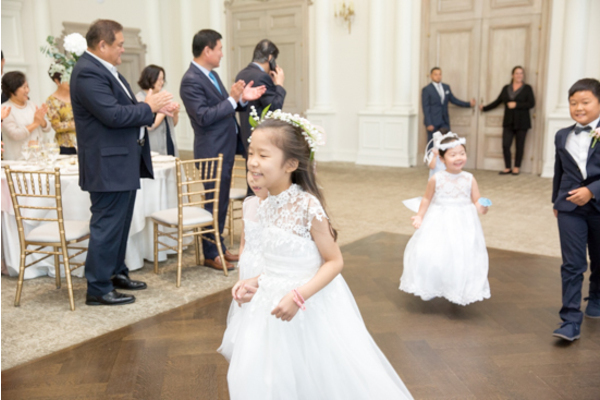 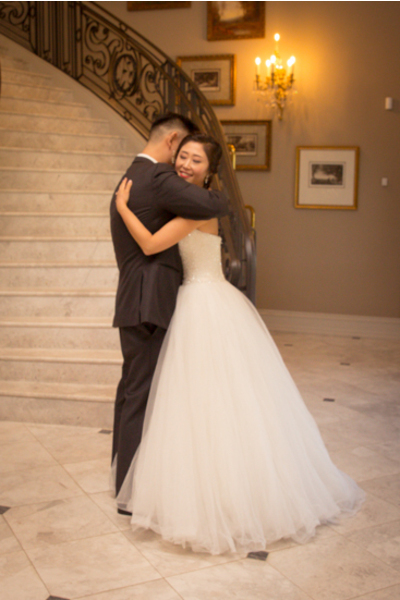 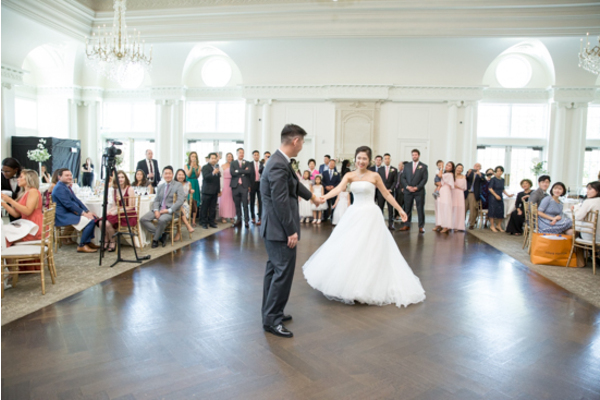 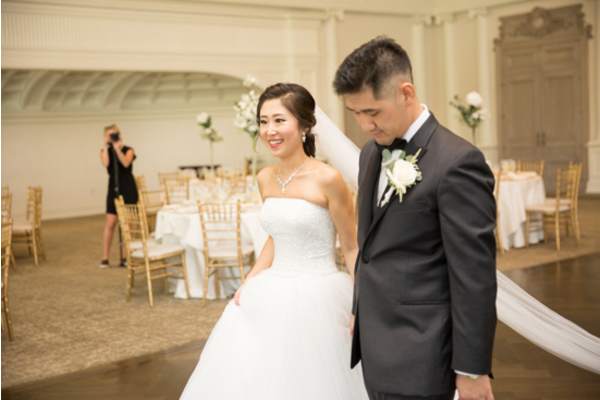 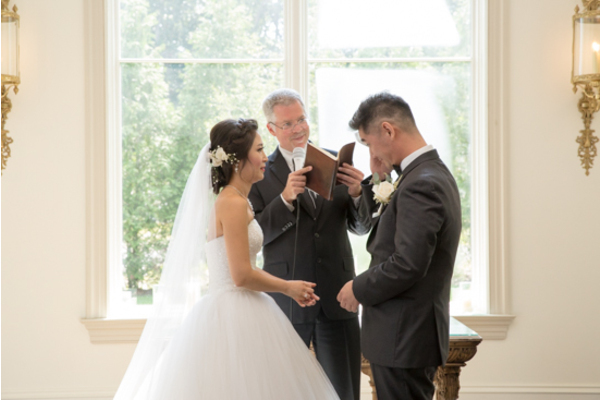 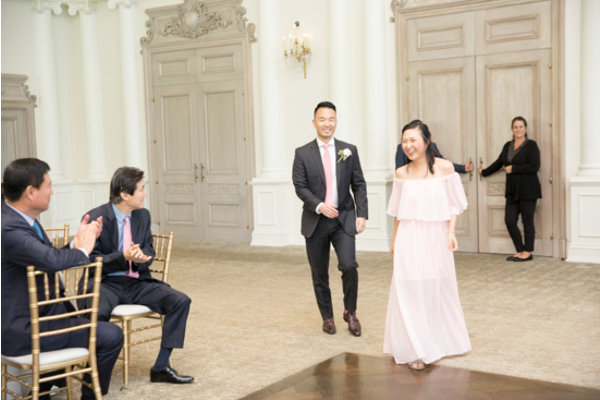 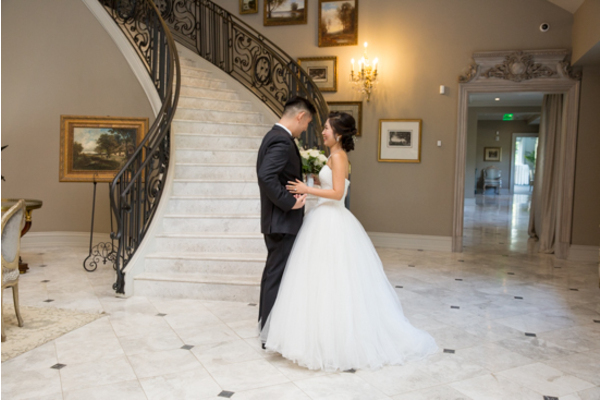 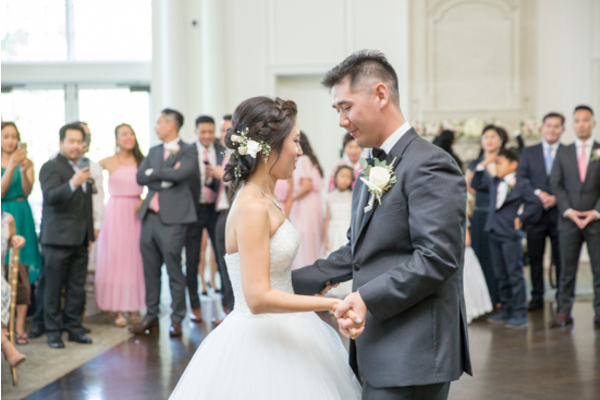 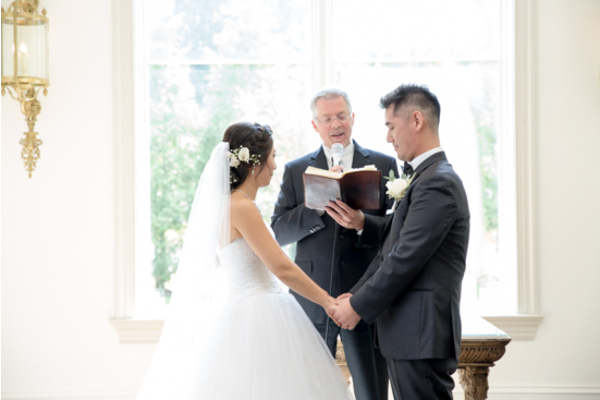 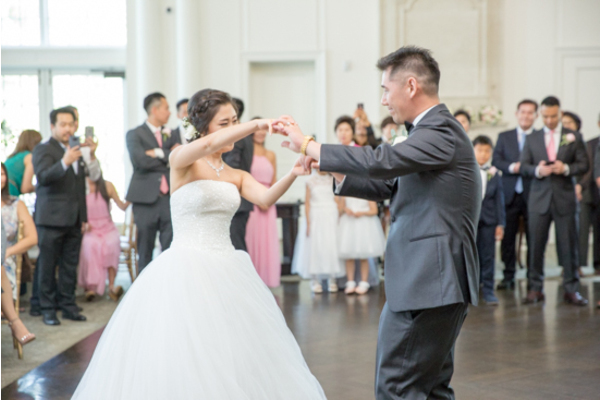 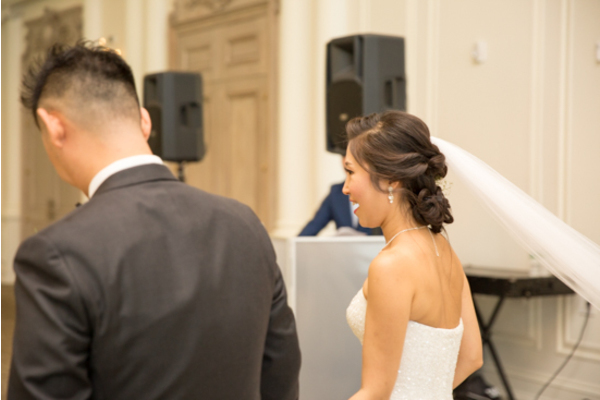 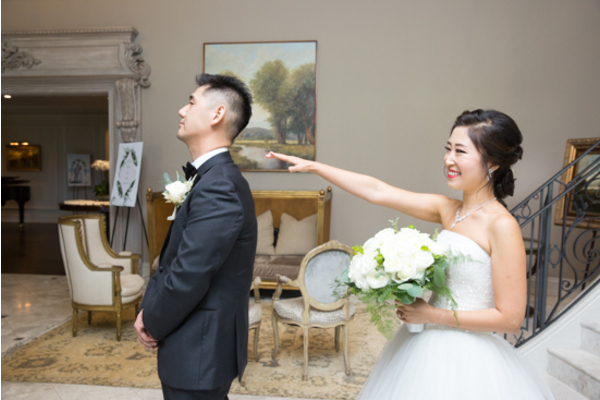 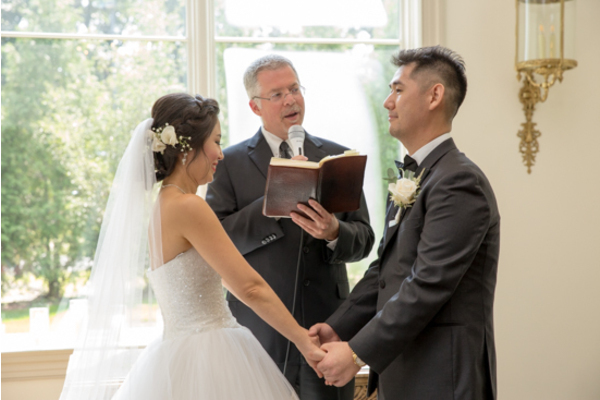 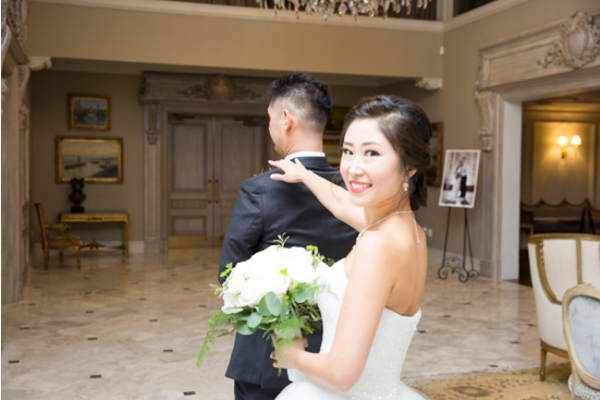 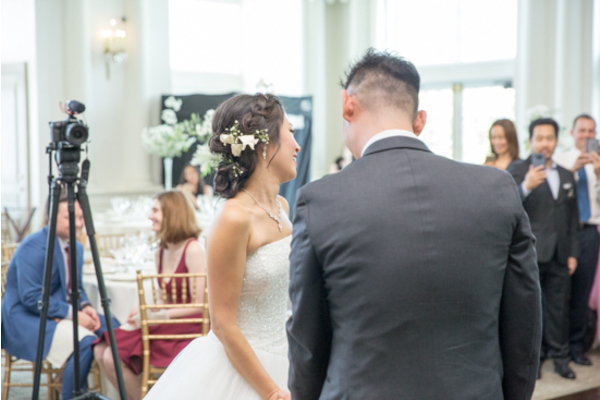 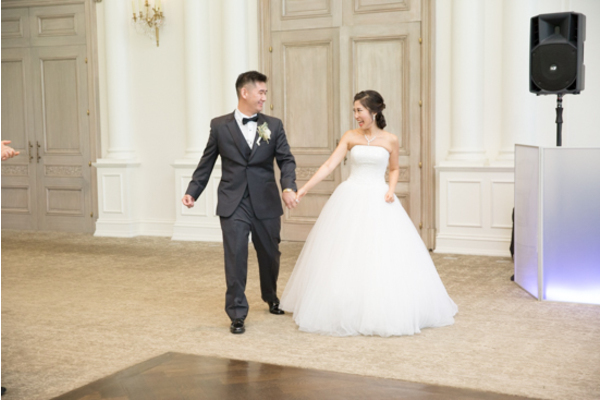 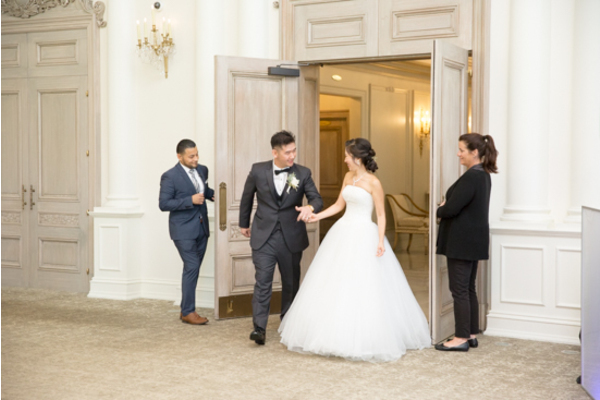 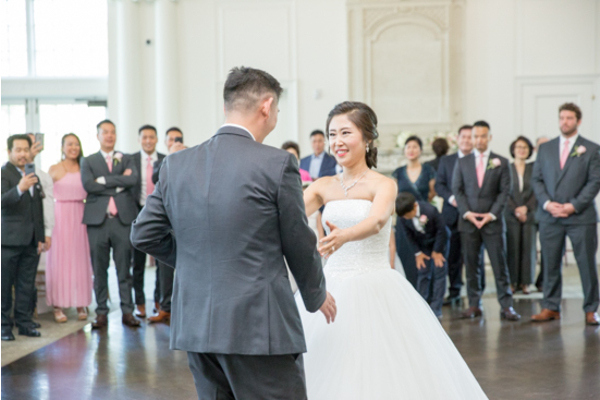 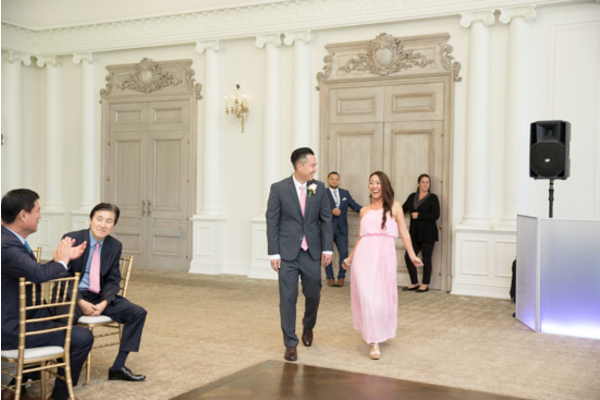 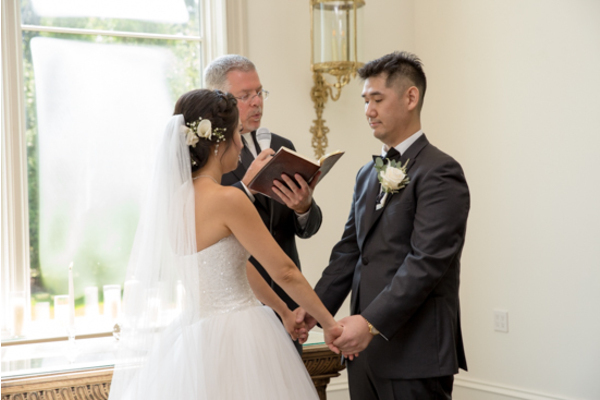 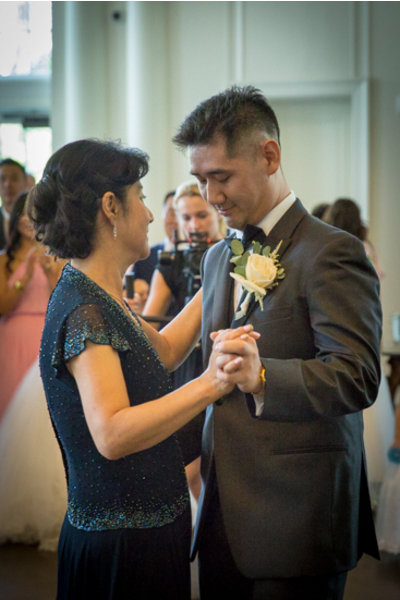 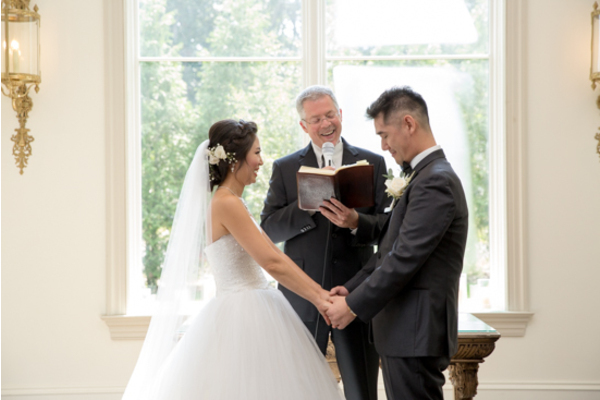 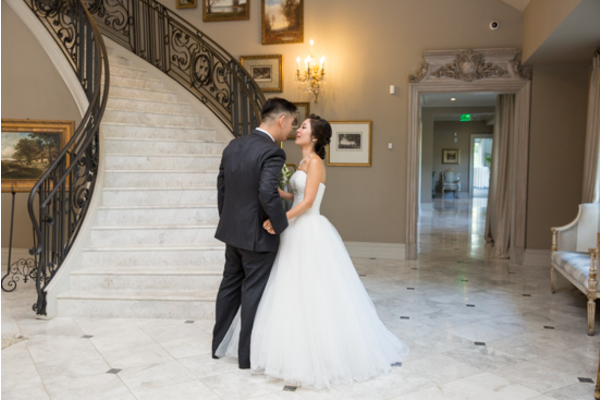 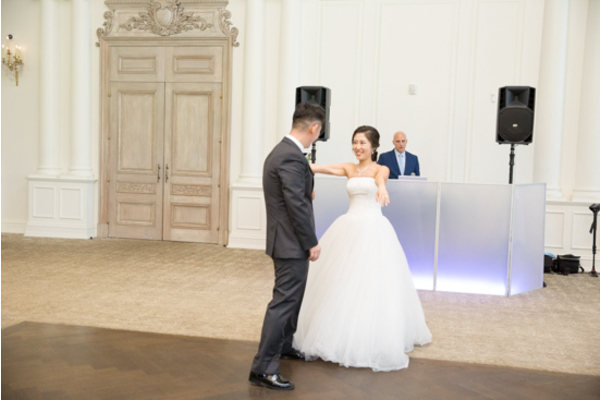 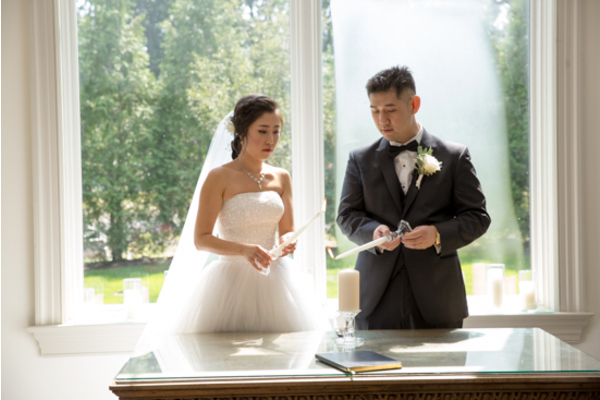 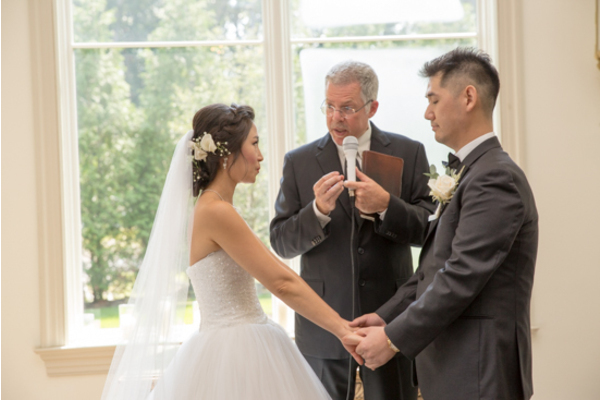 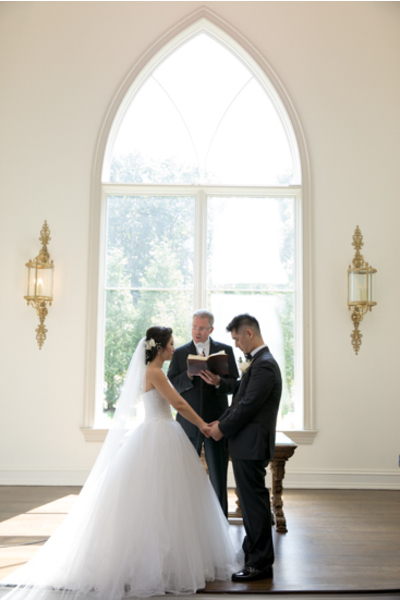 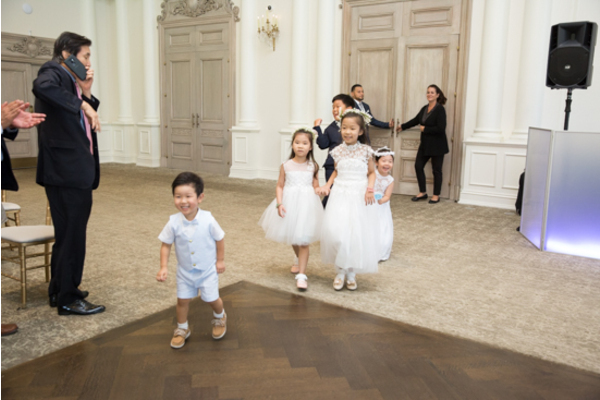 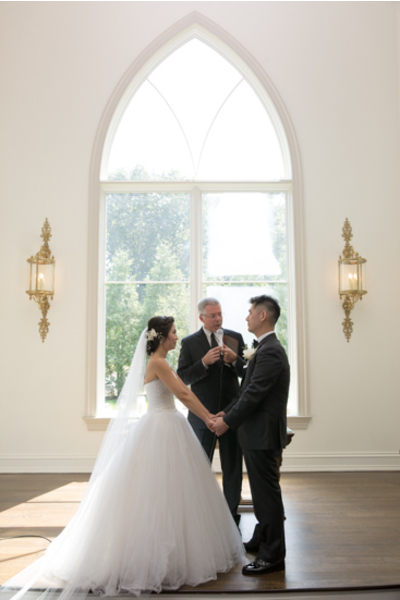 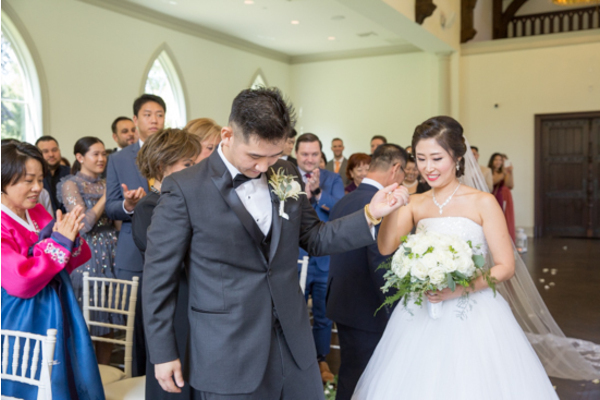 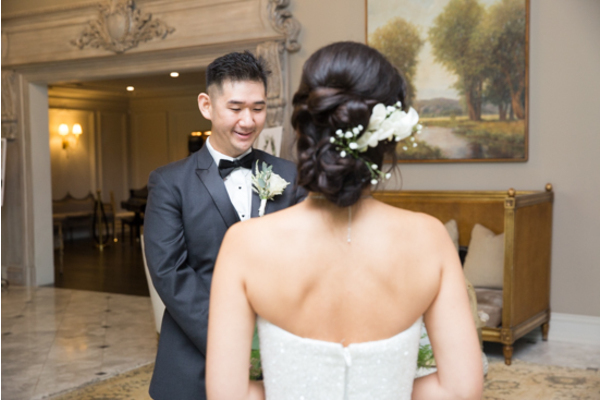 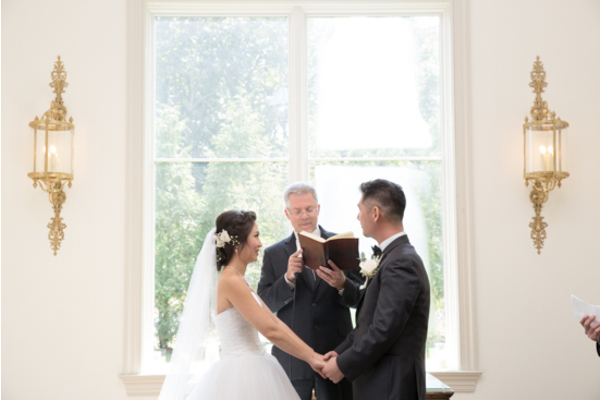 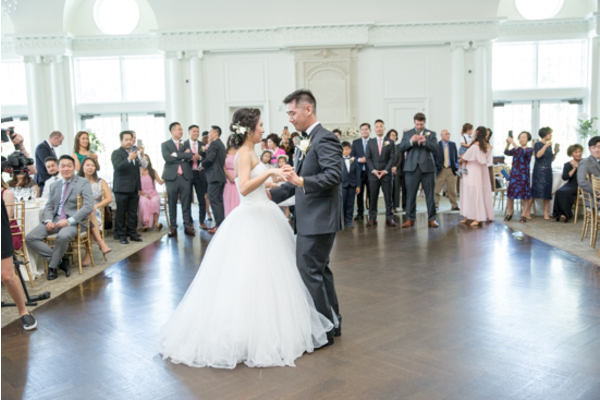 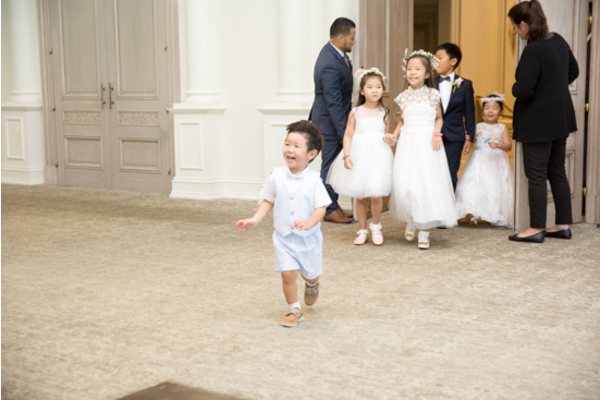 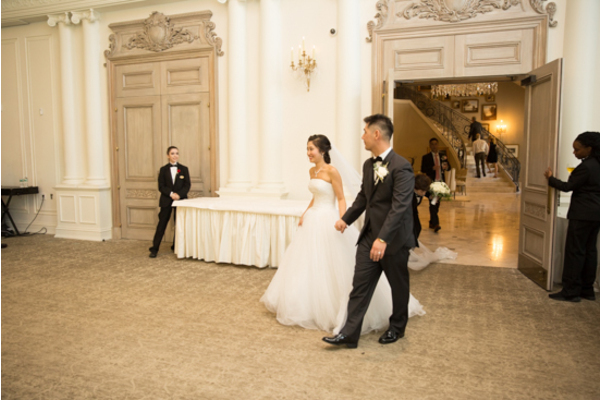 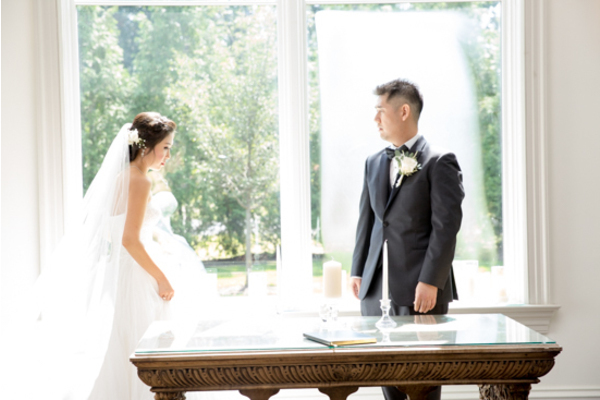 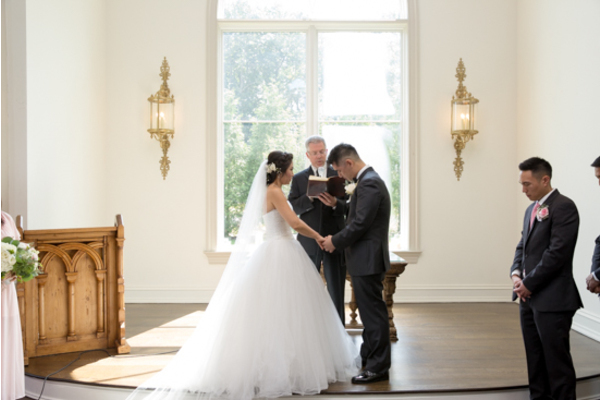 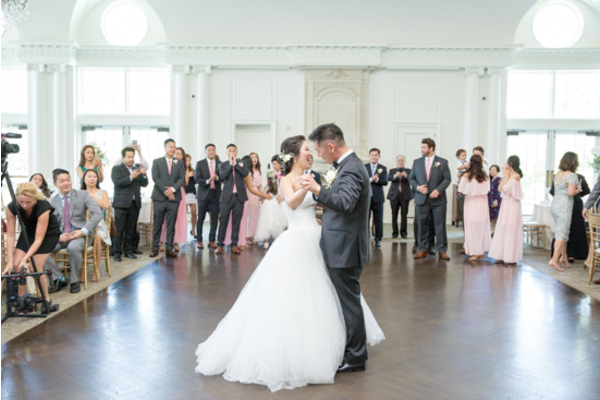 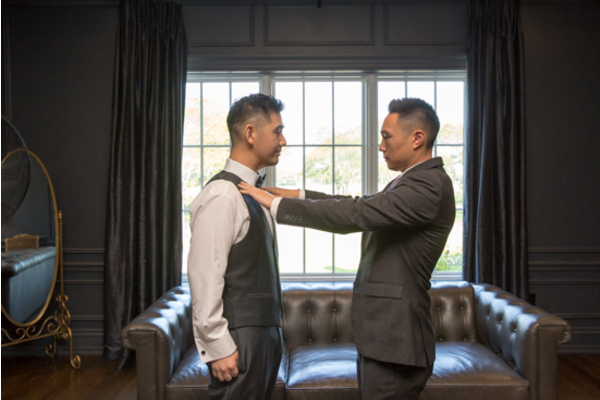 Thanks to our NJ Wedding Videographer, this lovely moment will be cherished forever! 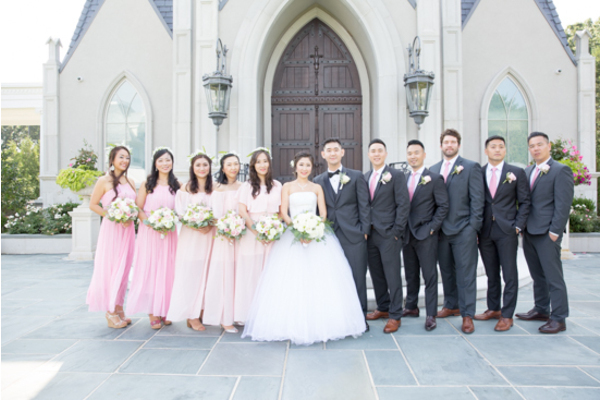 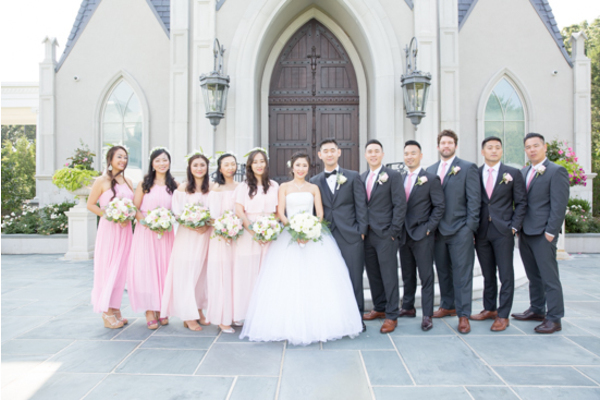 Outside the chapel, the bridal party lined up for more breathtaking photos in the natural sunlight! 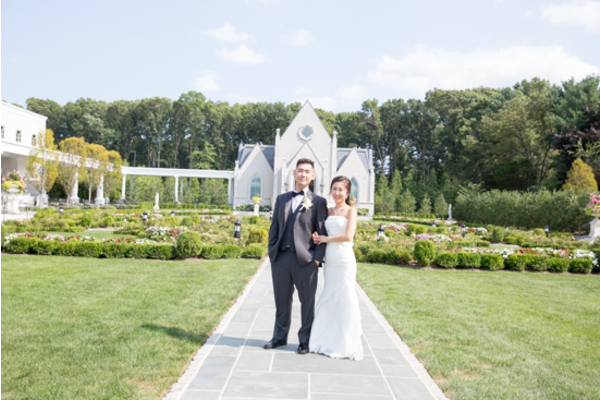 The gardens of the venue made for a stunning backdrop to every photograph. 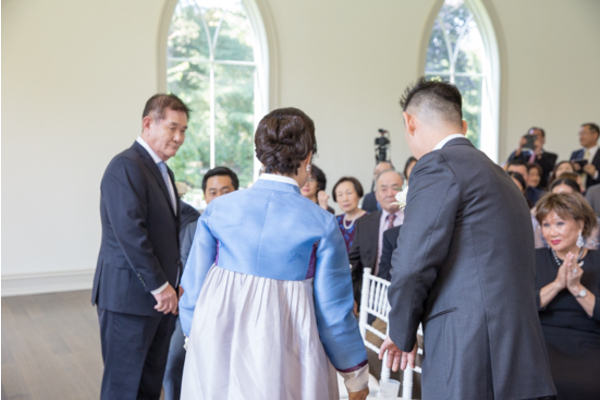 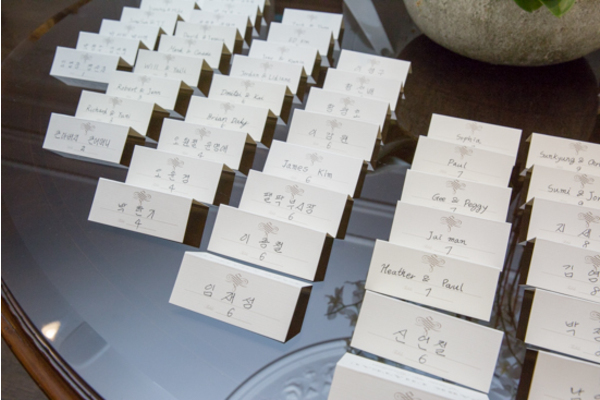 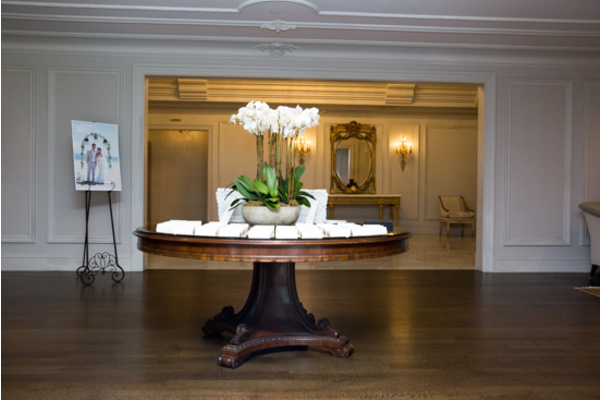 Inside, guests awaited to see Irene dressed in white for the first time! 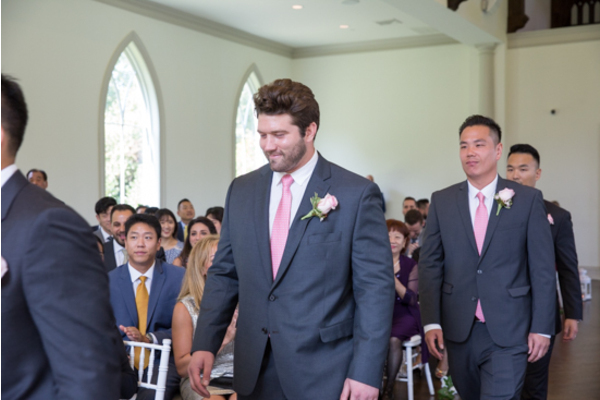 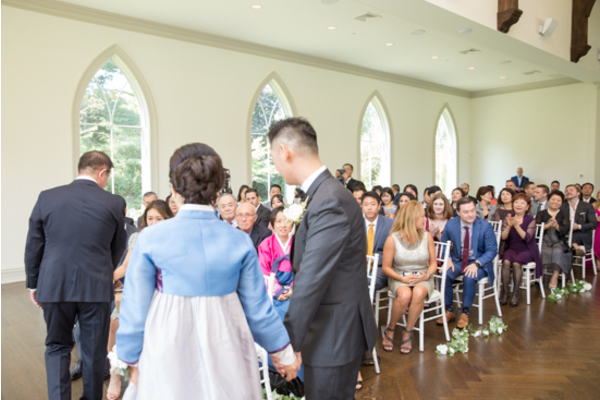 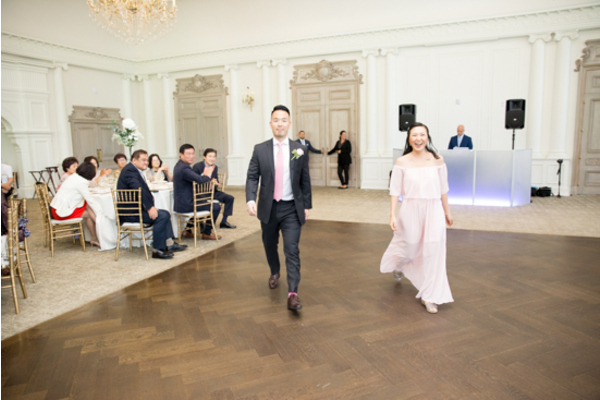 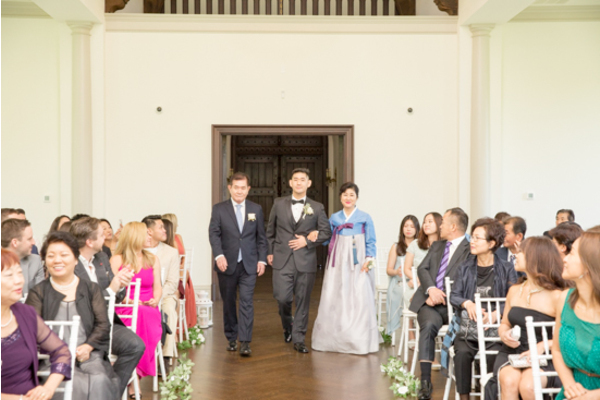 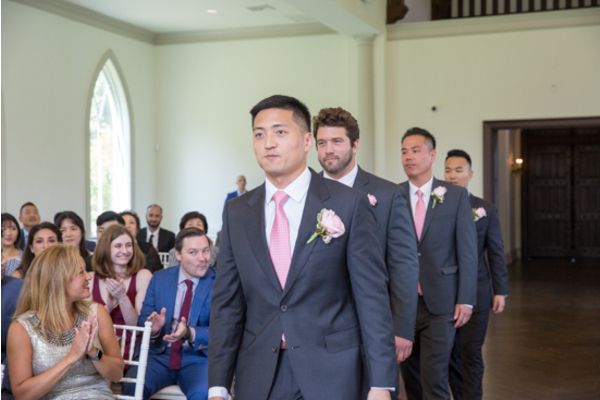 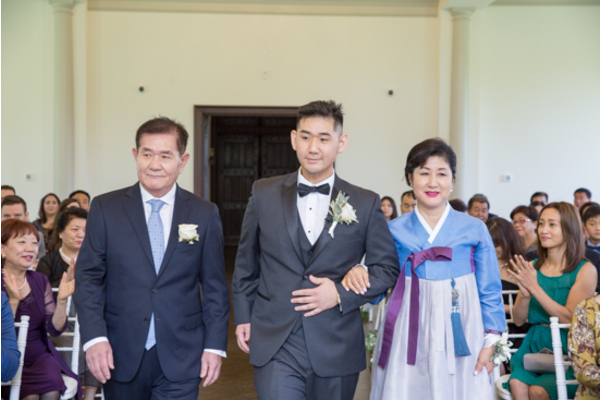 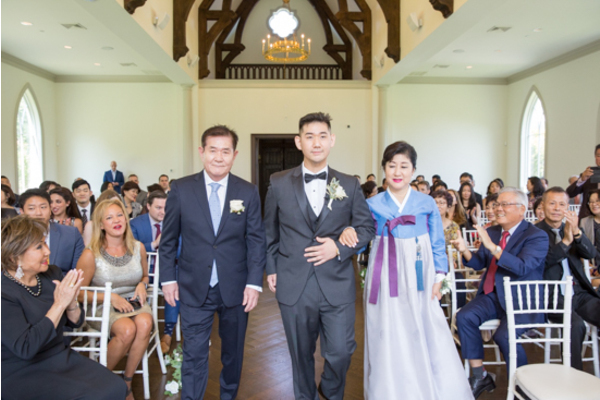 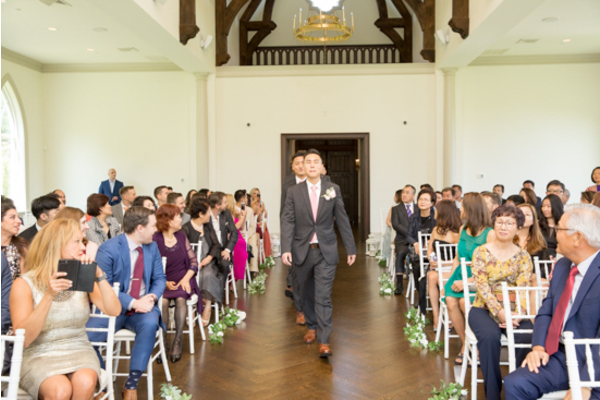 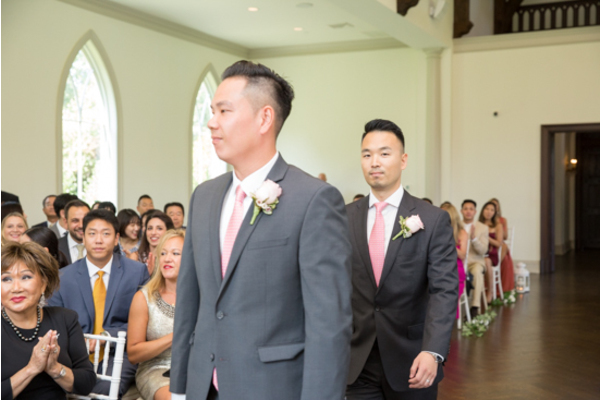 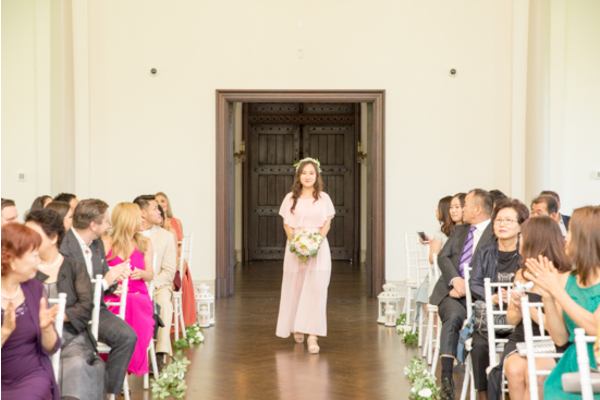 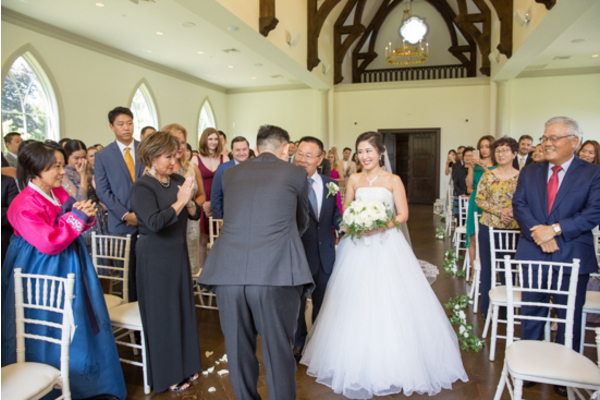 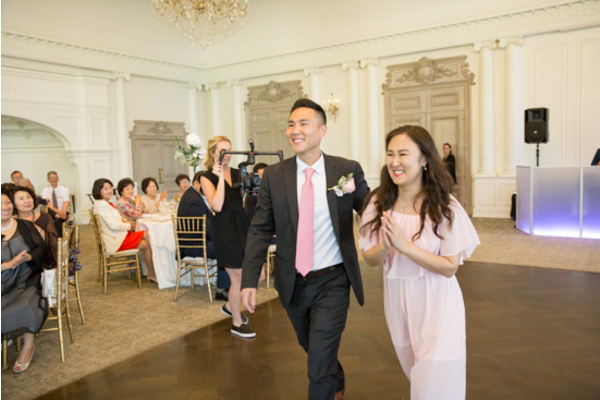 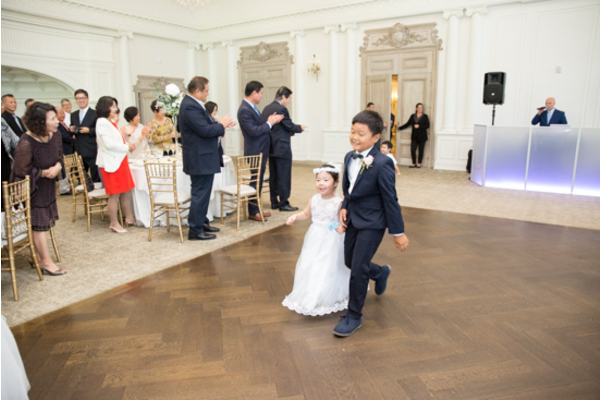 Finally, Irene walked down the aisle to greet her prince! 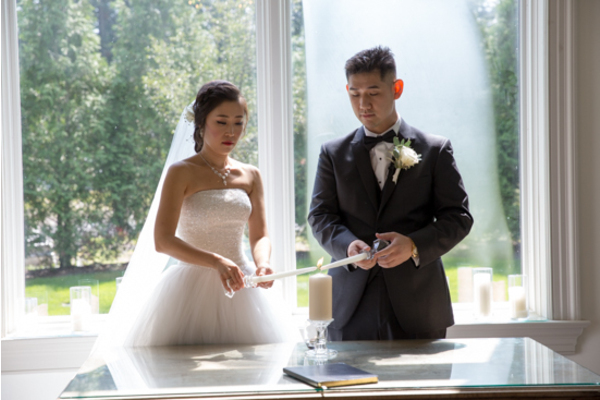 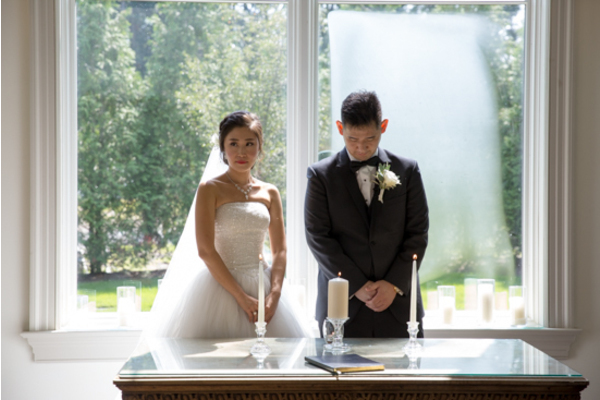 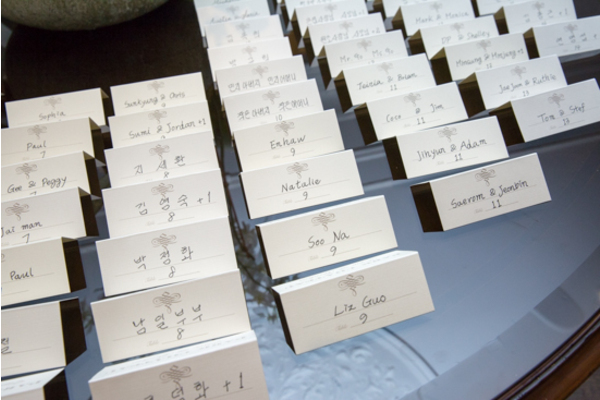 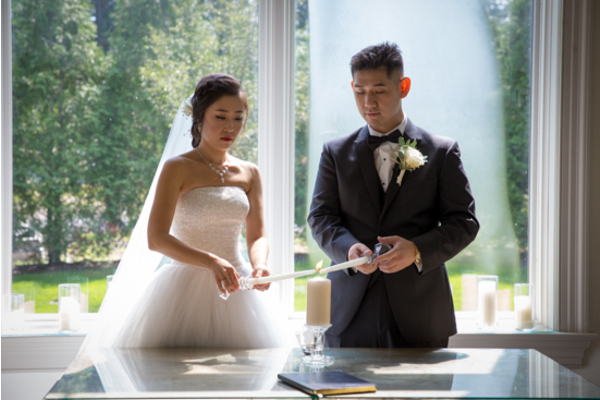 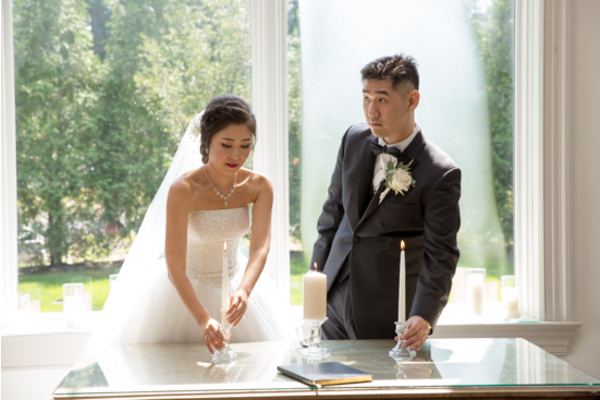 The couple performed a traditional candle ceremony before they officially became husband and wife. 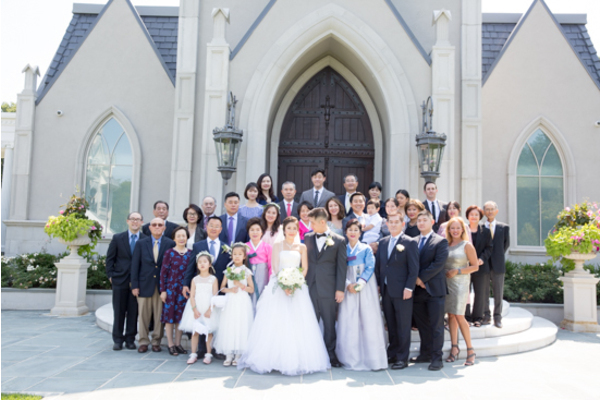 Immediately following the ceremony, the guests gathered for one last group shot until the reception! 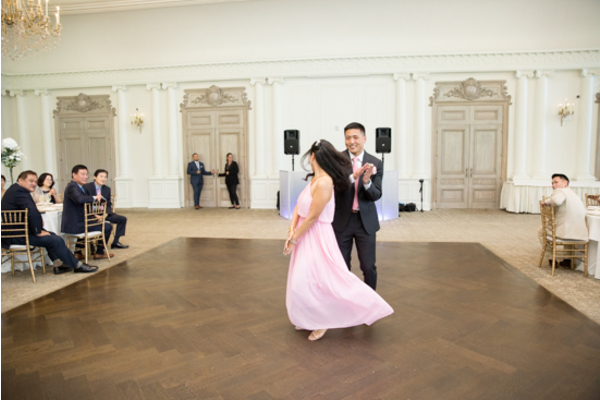 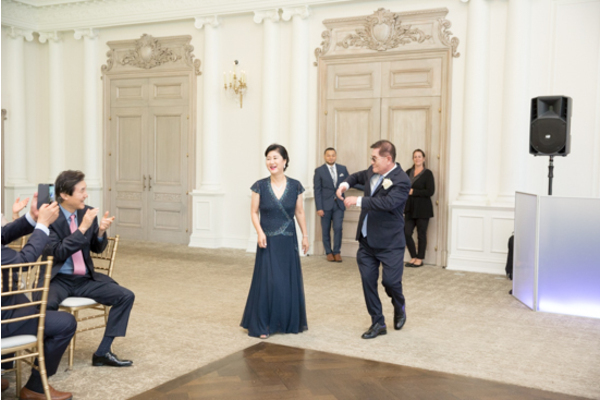 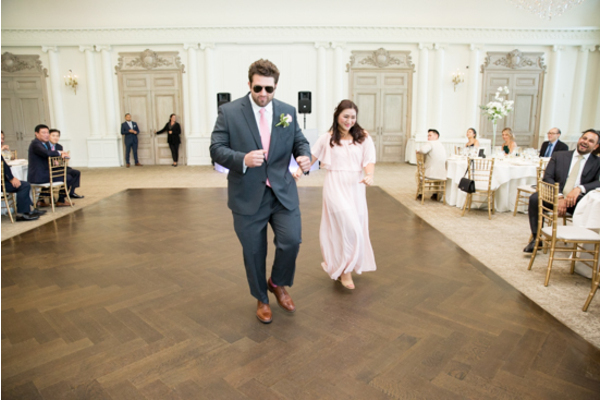 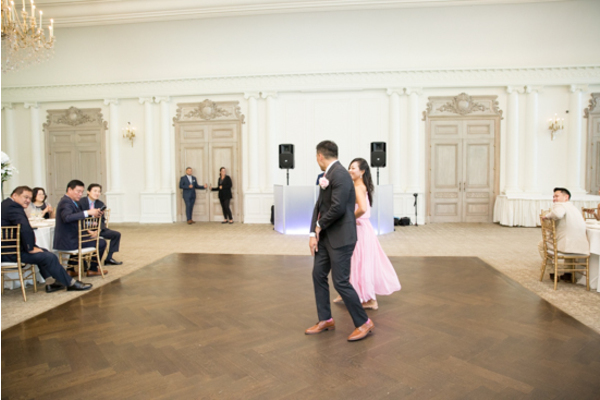 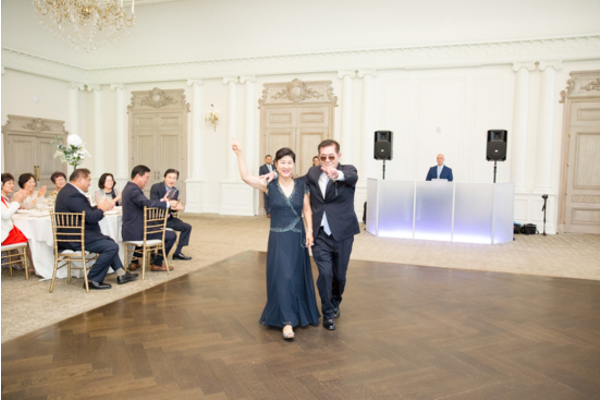 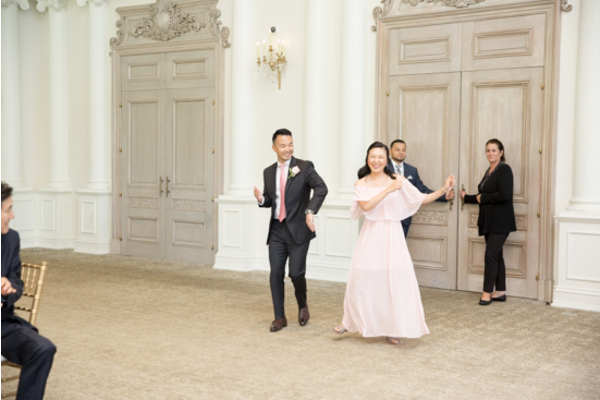 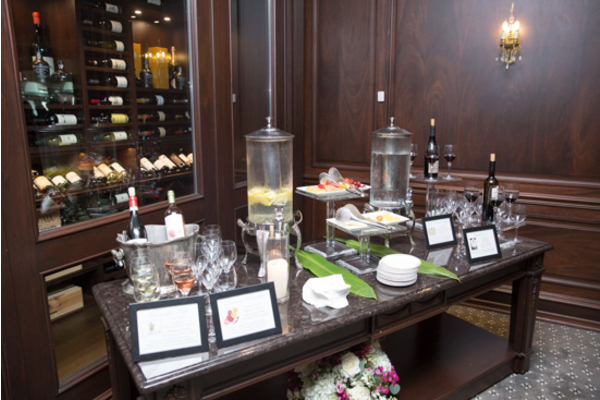 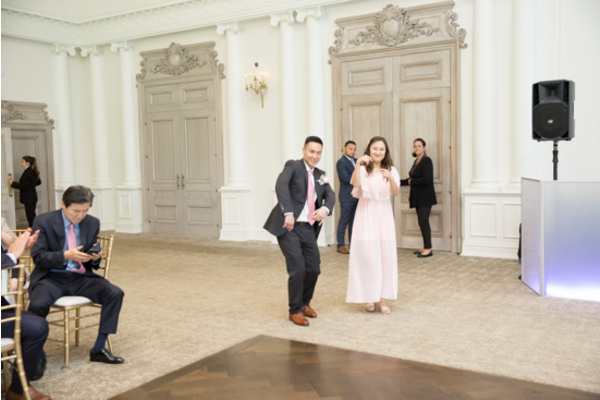 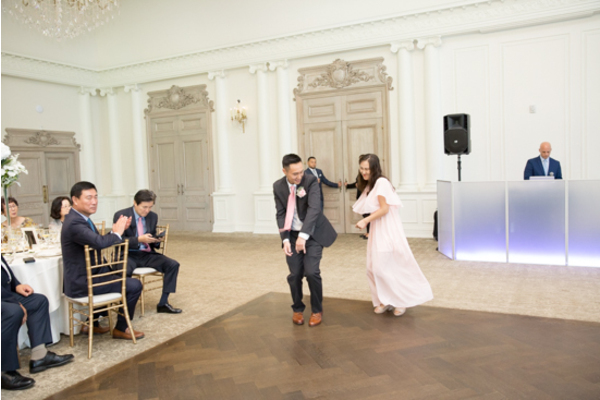 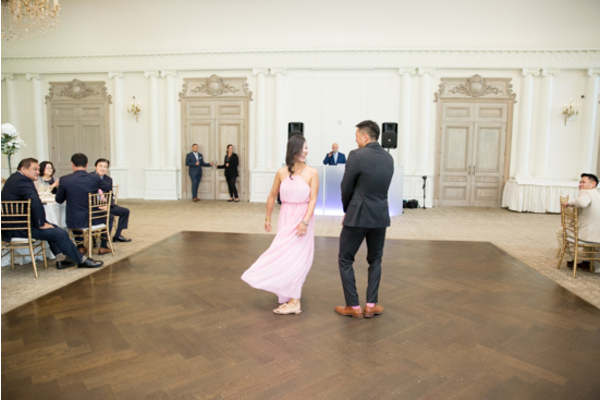 Guests were excited to spend the night out on the dance floor! 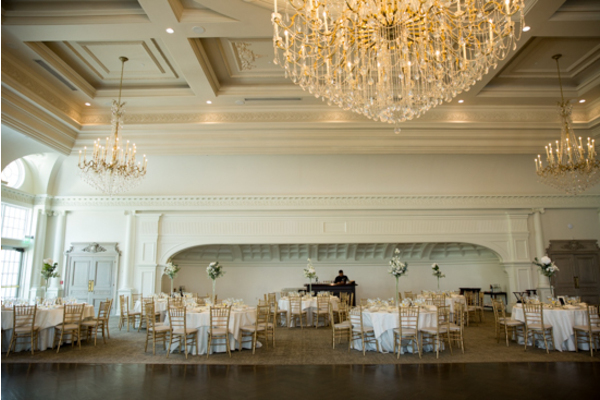 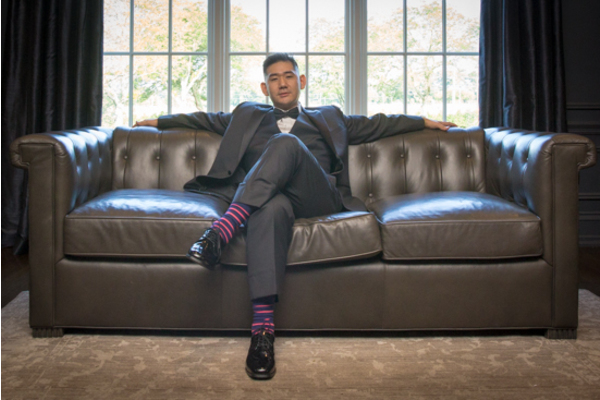 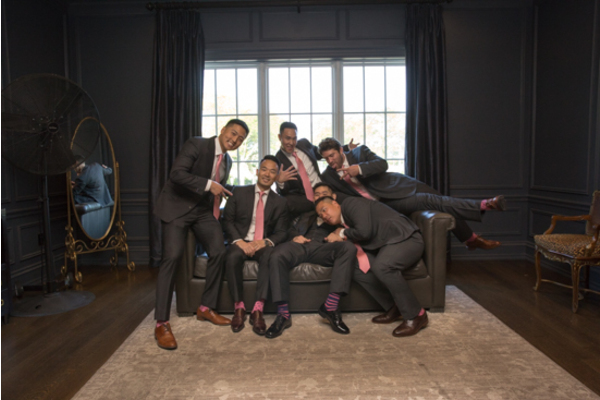 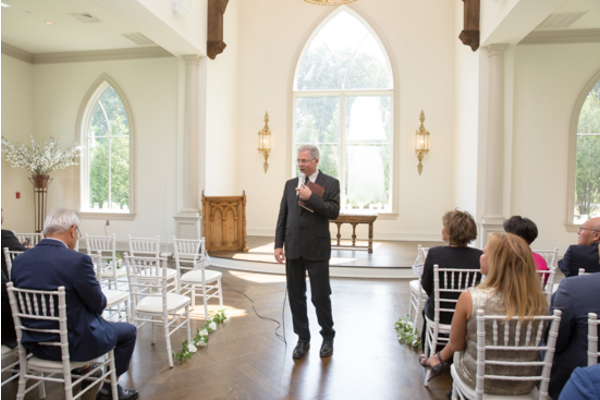 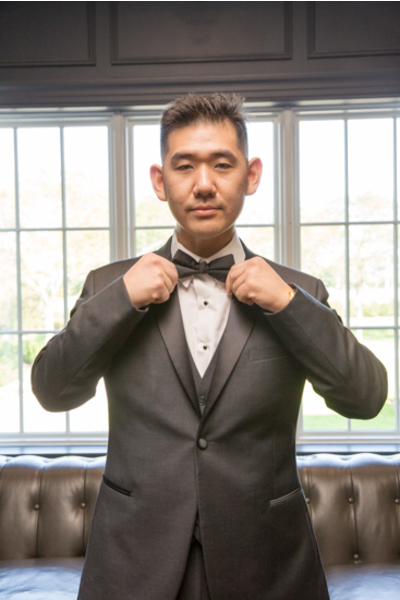 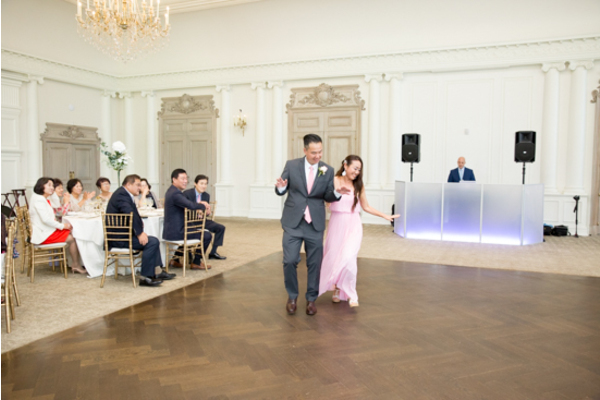 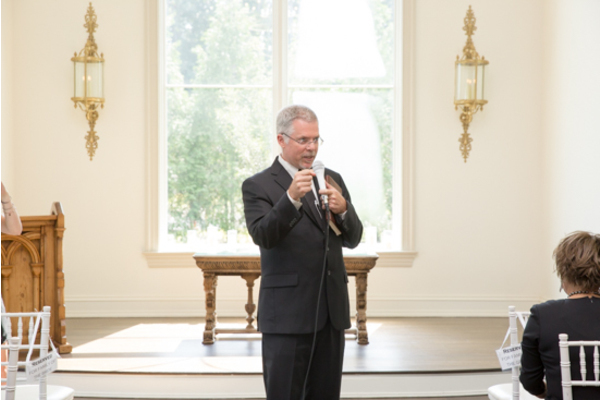 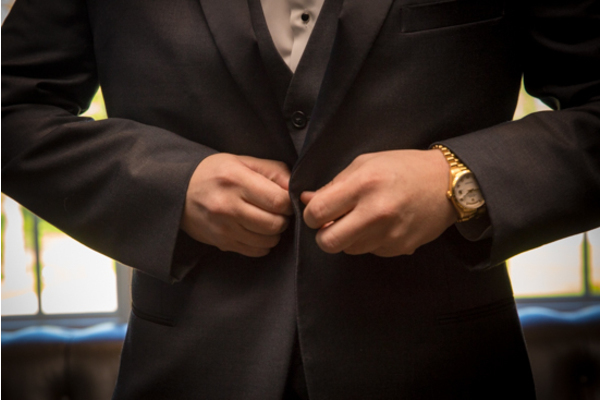 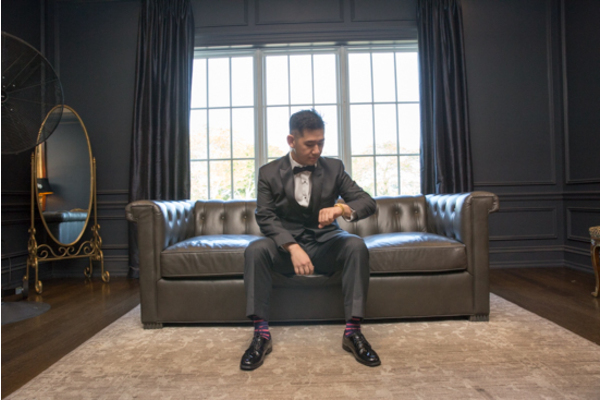 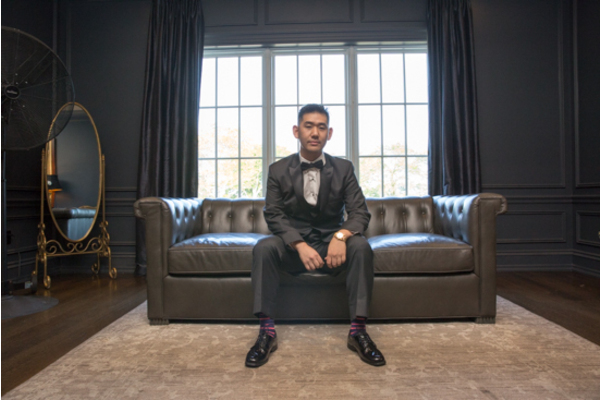 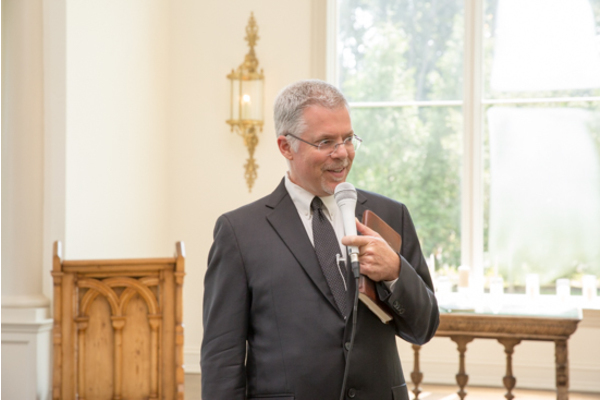 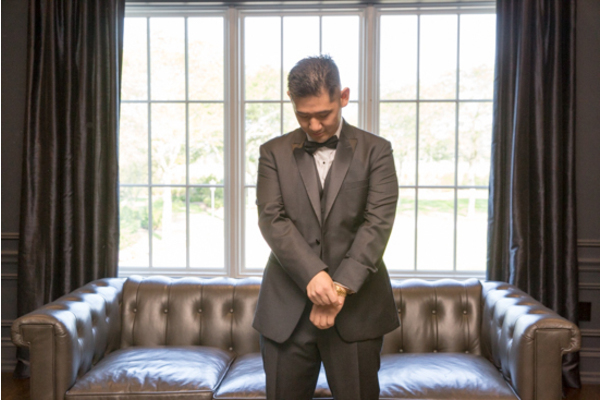 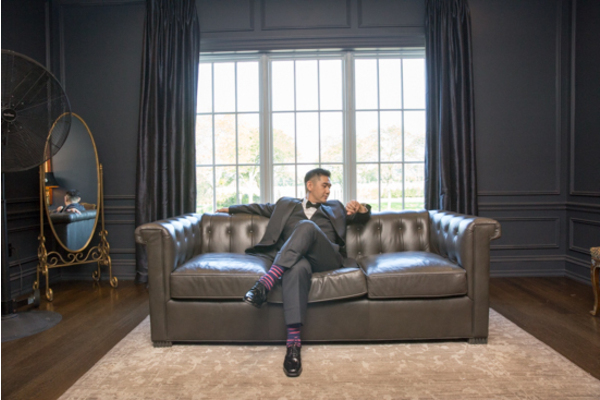 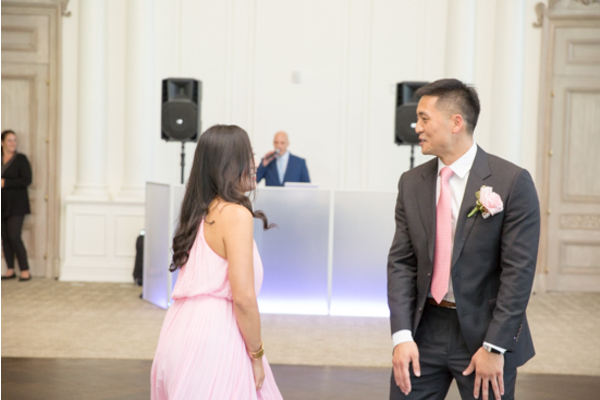 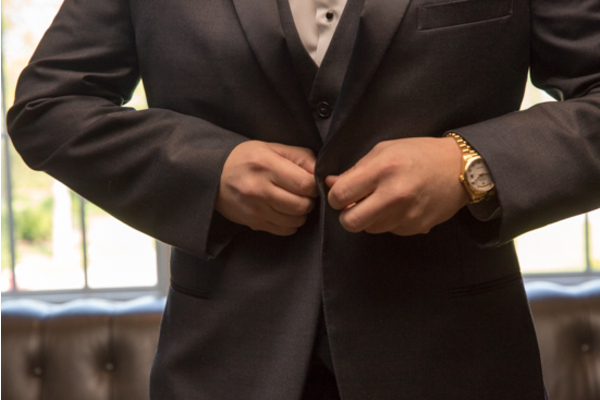 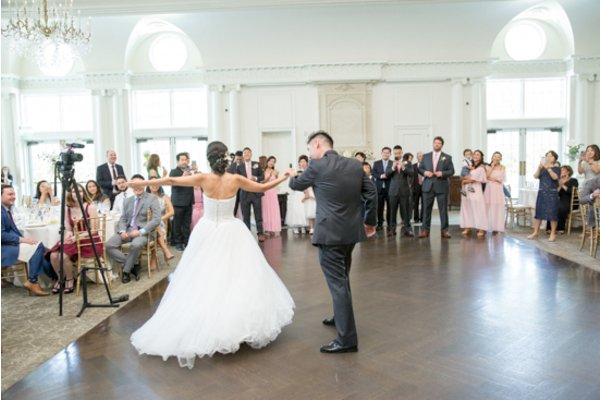 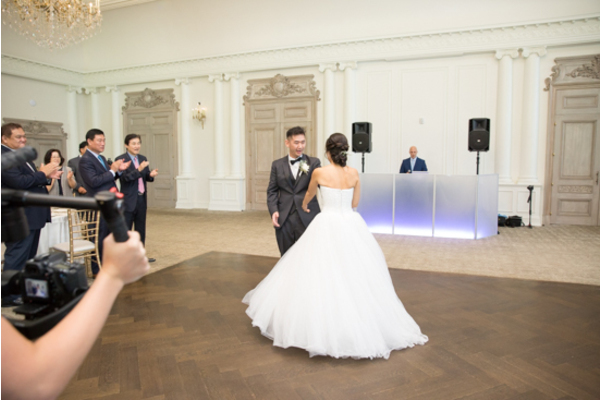 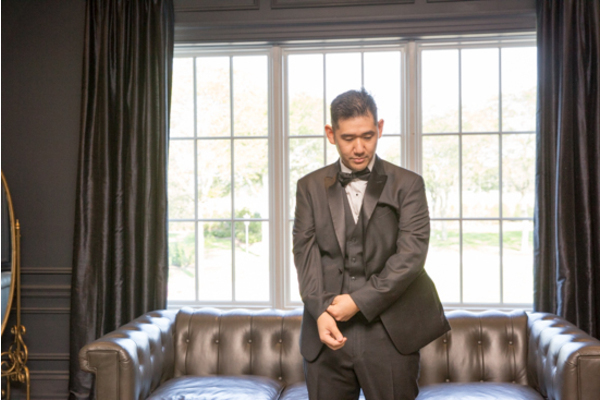 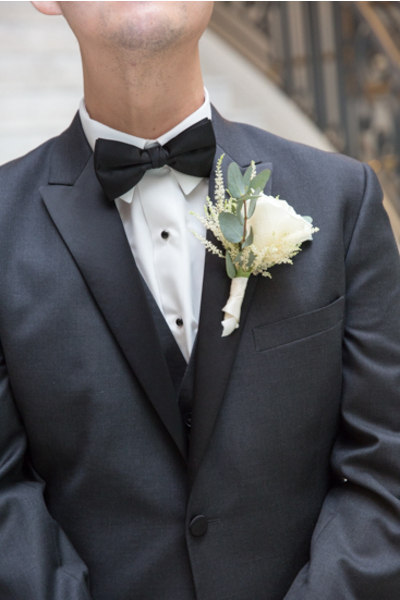 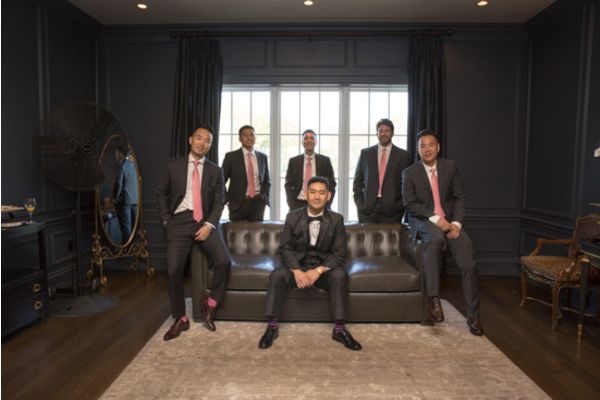 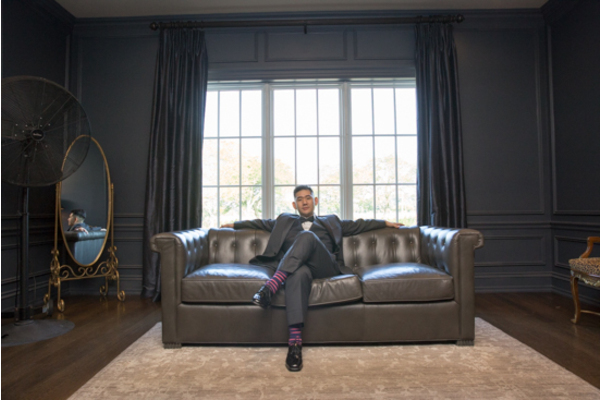 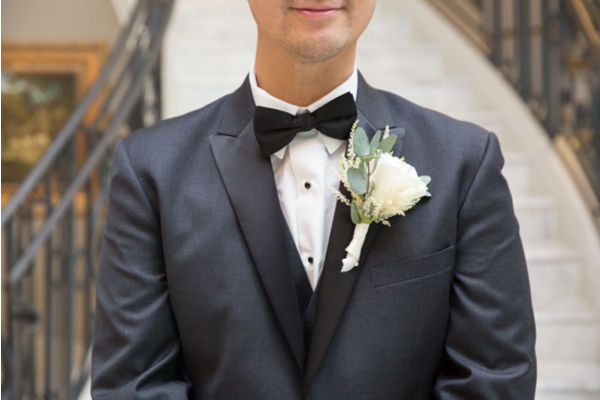 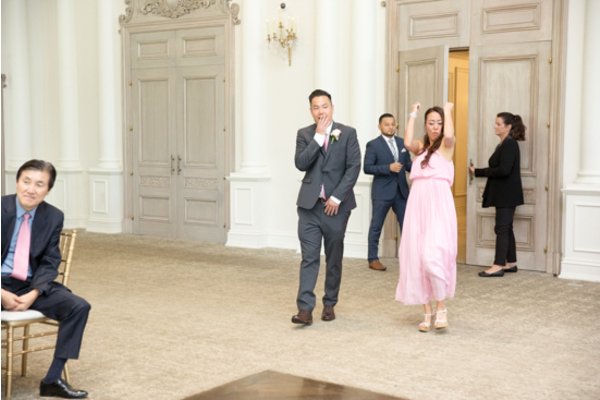 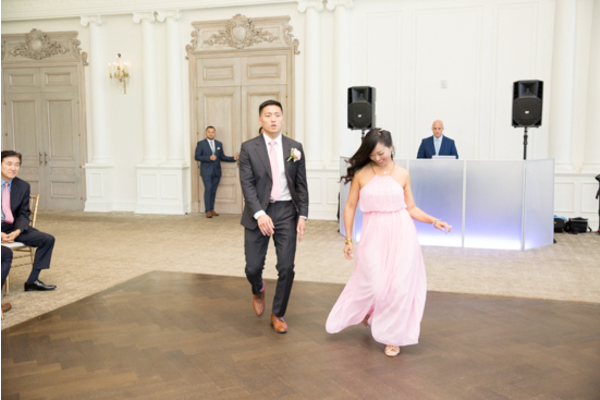 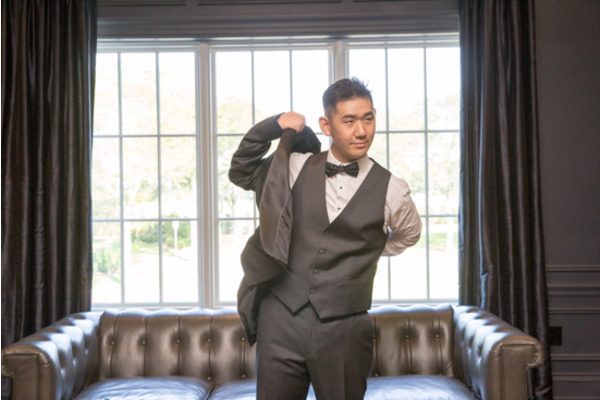 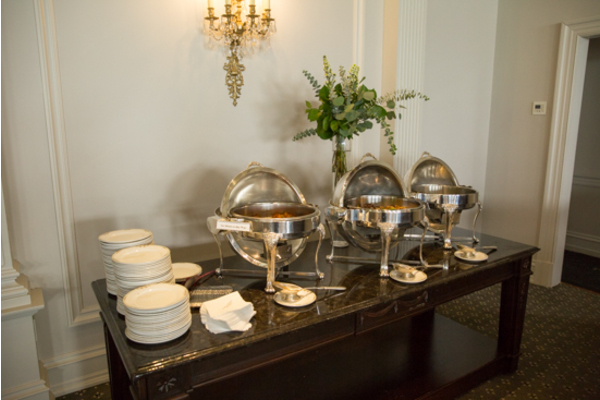 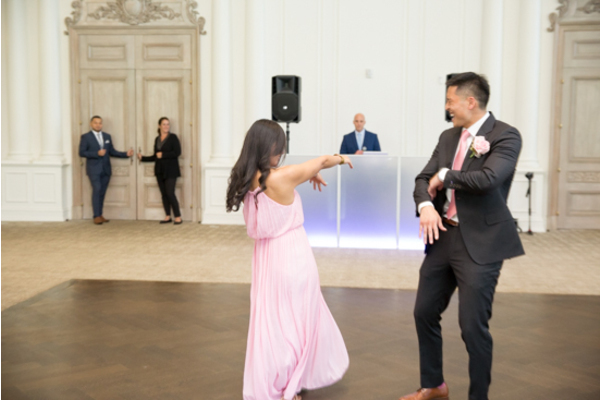 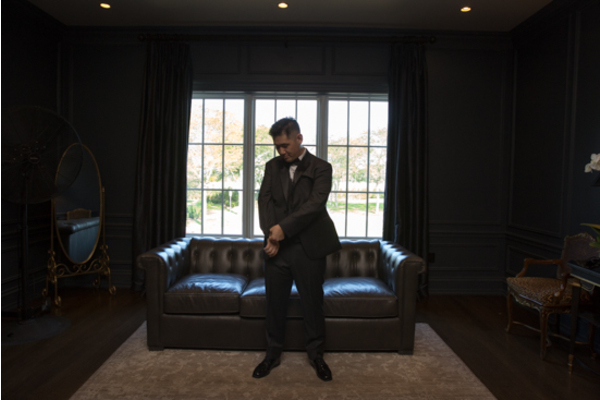 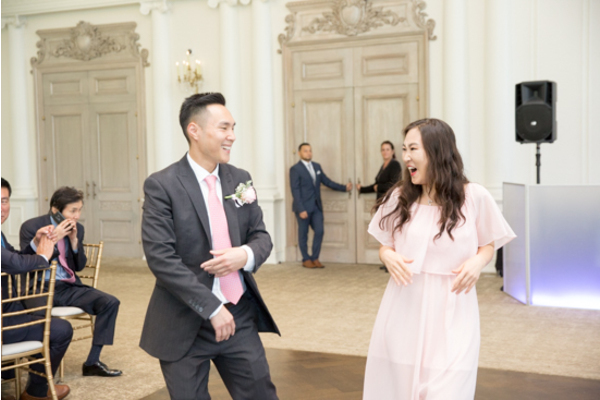 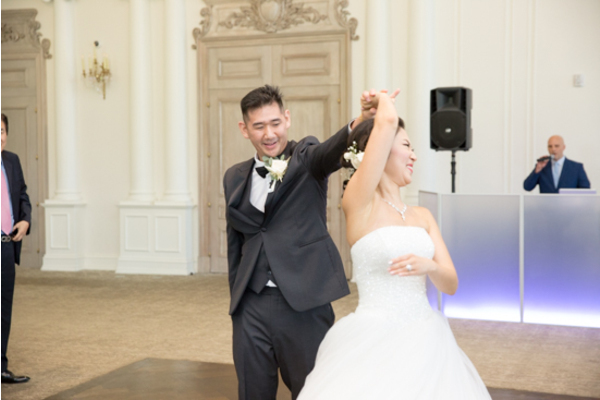 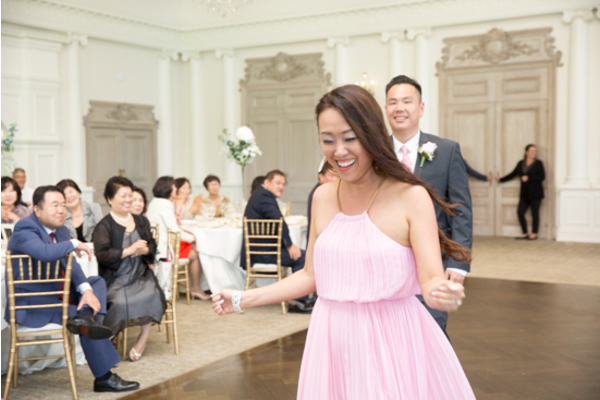 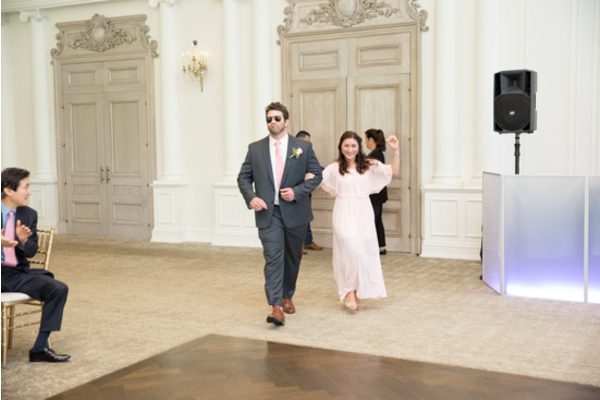 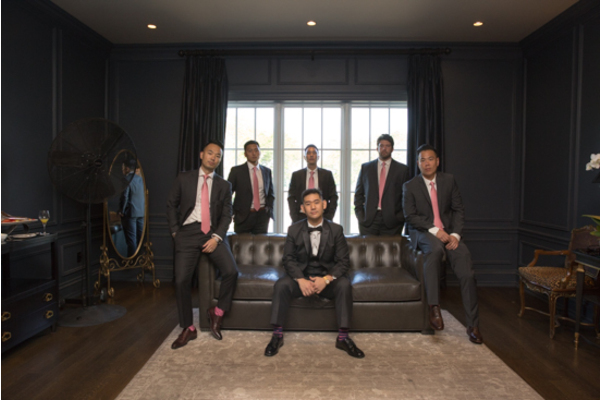 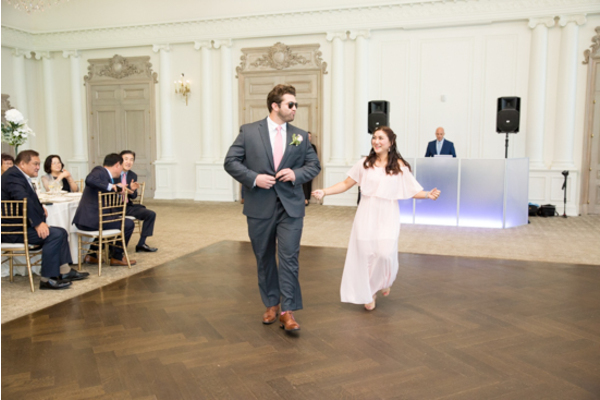 Surely, our NJ Wedding DJ cued up classic wedding songs for the entire night! 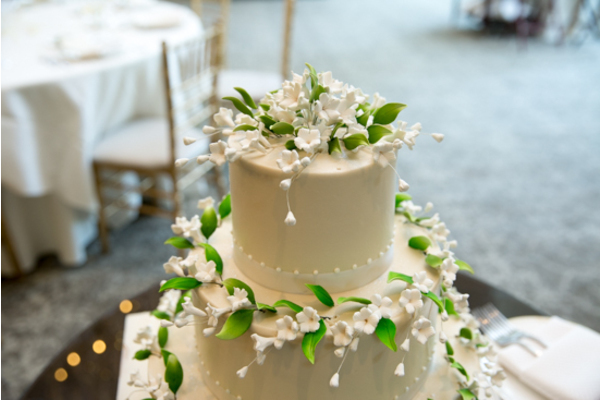 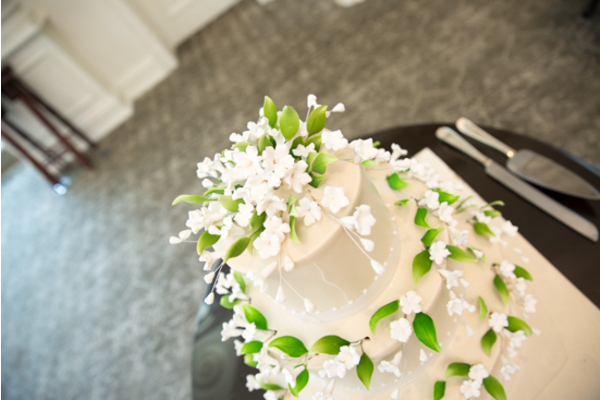 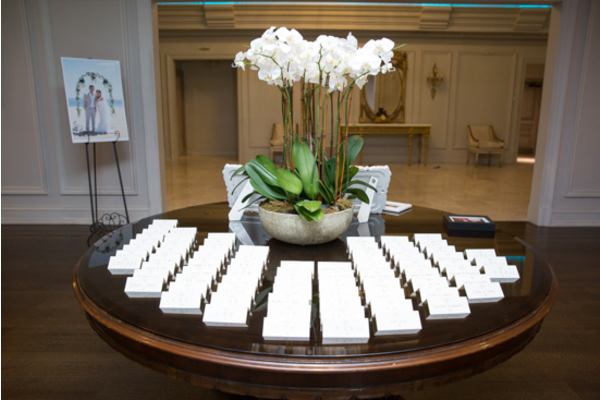 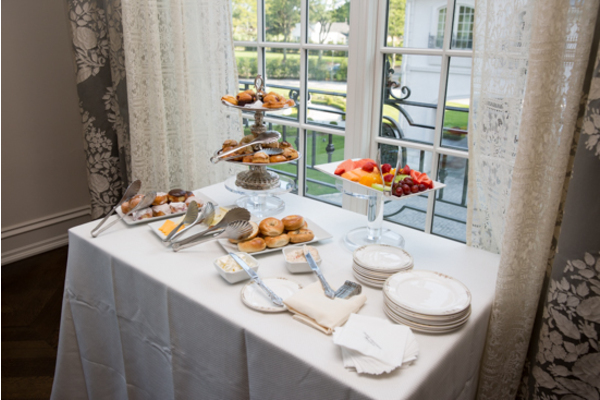 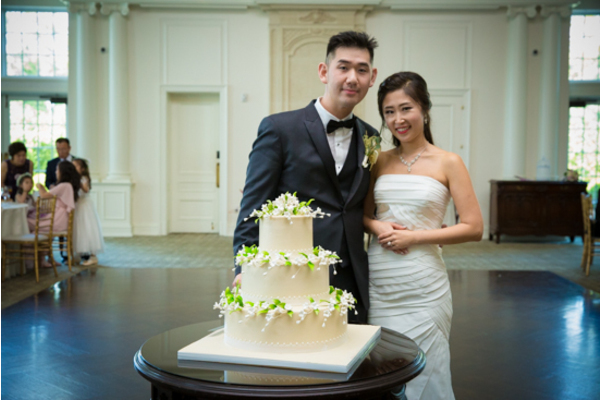 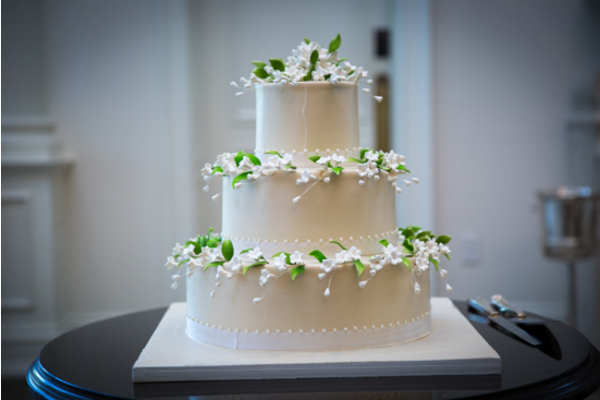 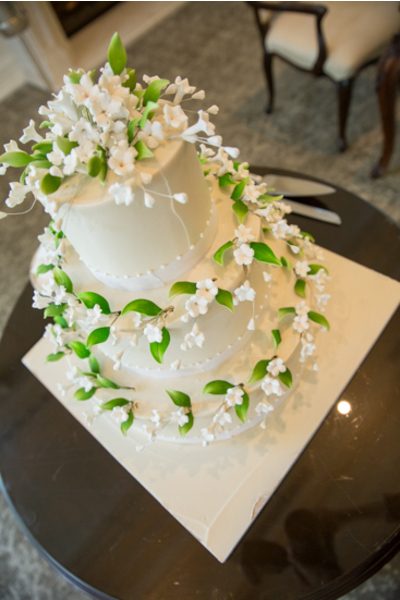 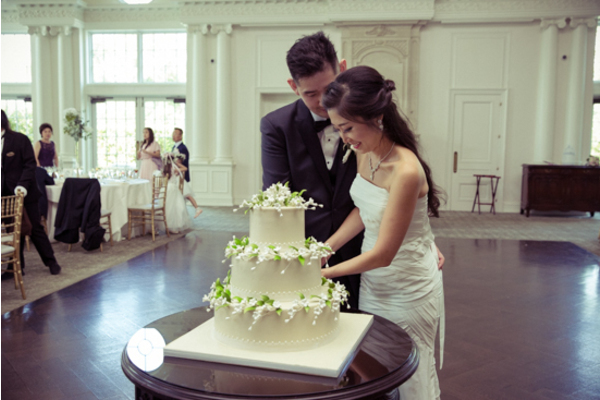 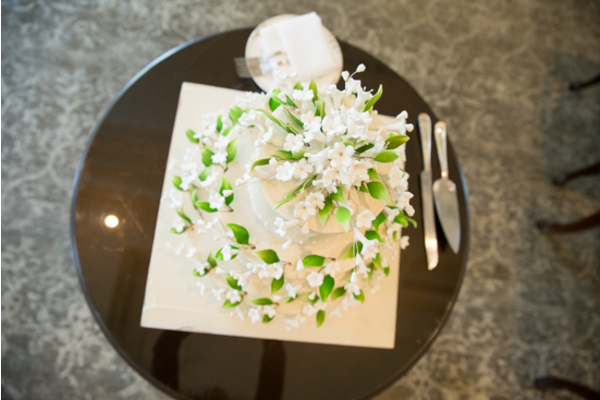 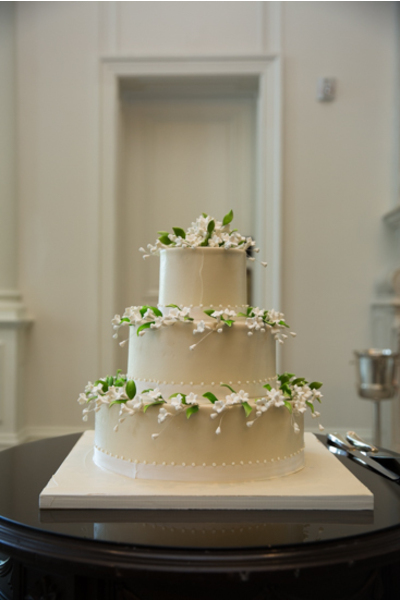 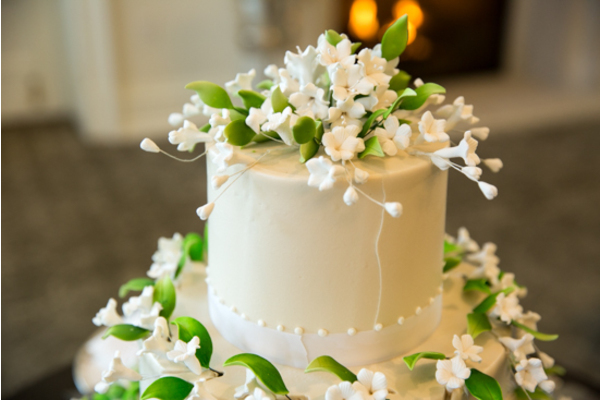 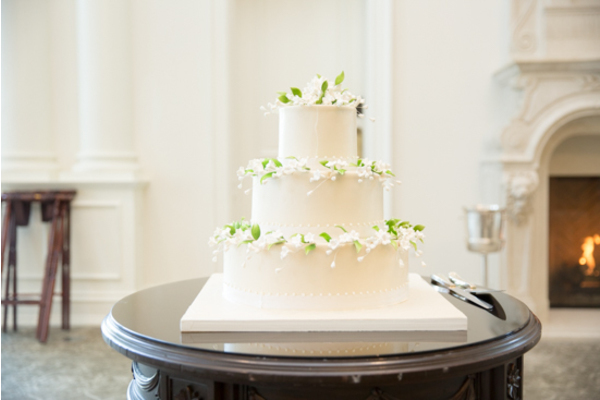 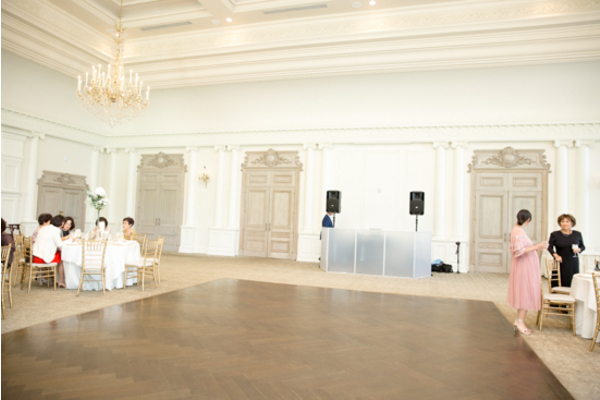 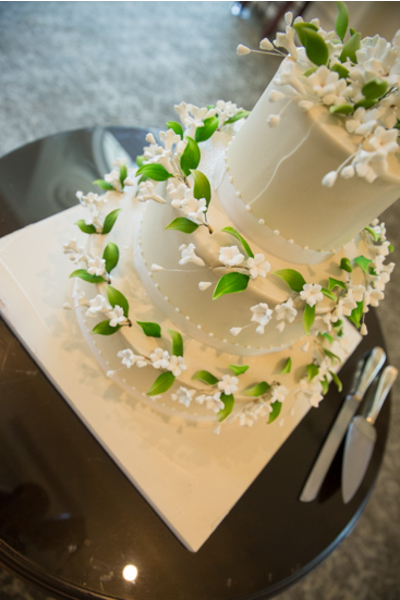 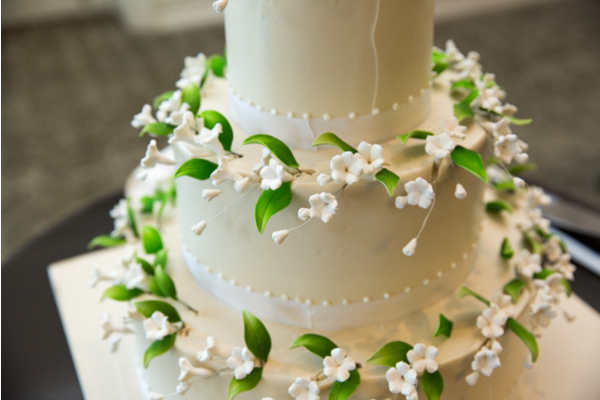 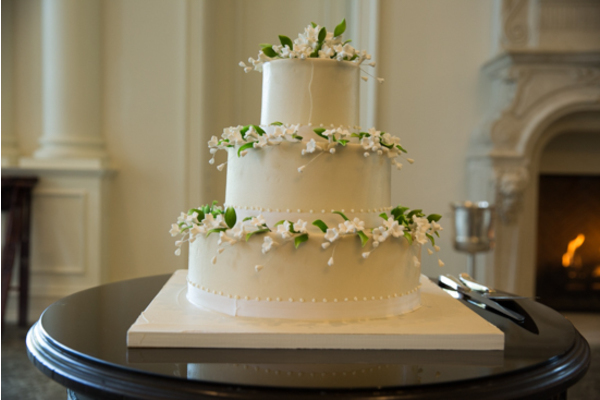 Lastly, their minimalistic wedding cake stood out at the beautiful venue. 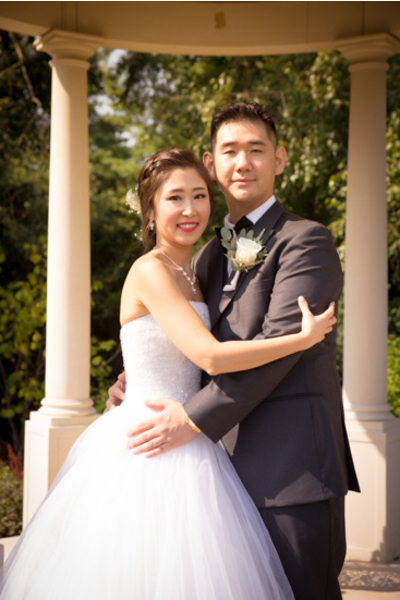 Congratulations, again, to the lovely couple! 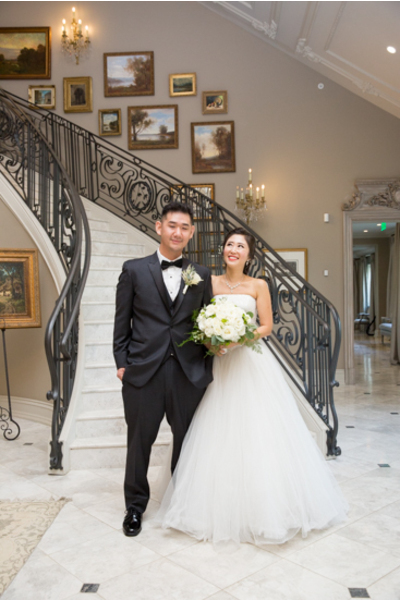 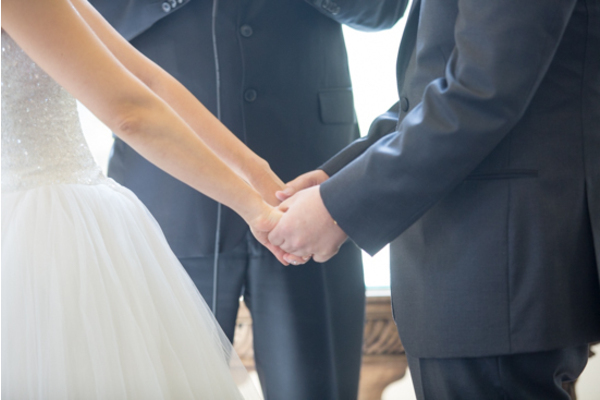 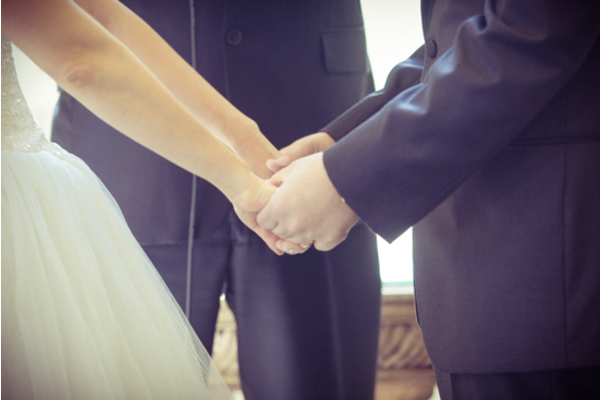 We hope your new life together is filled with endless love!